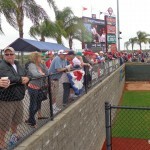 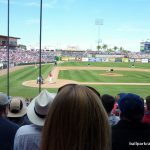 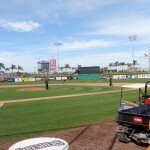 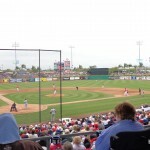 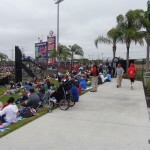 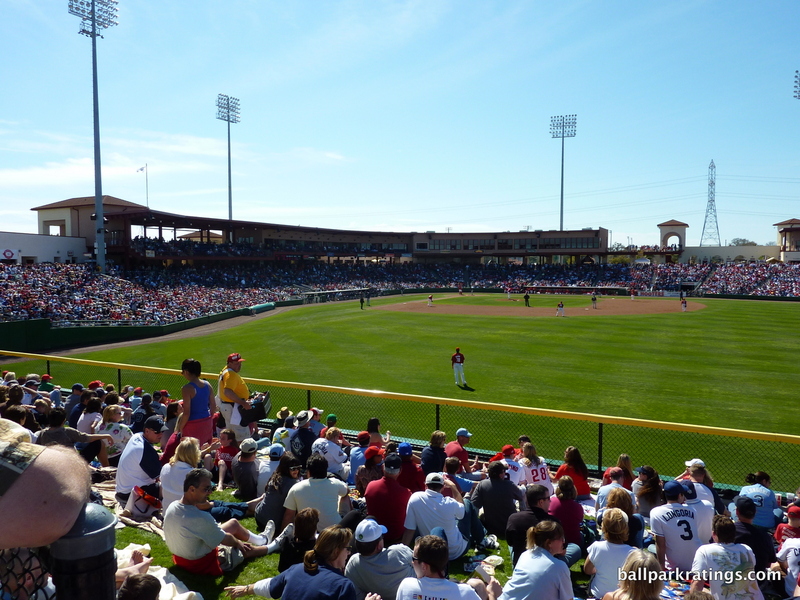 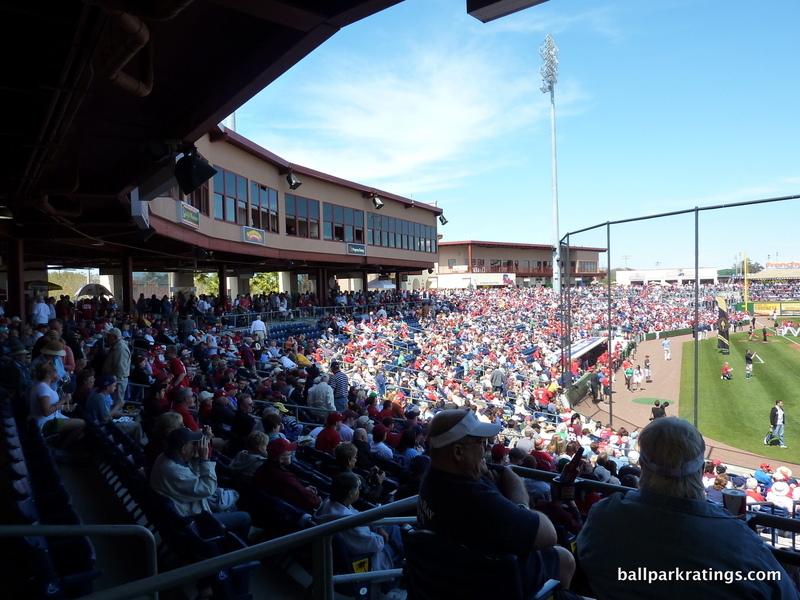 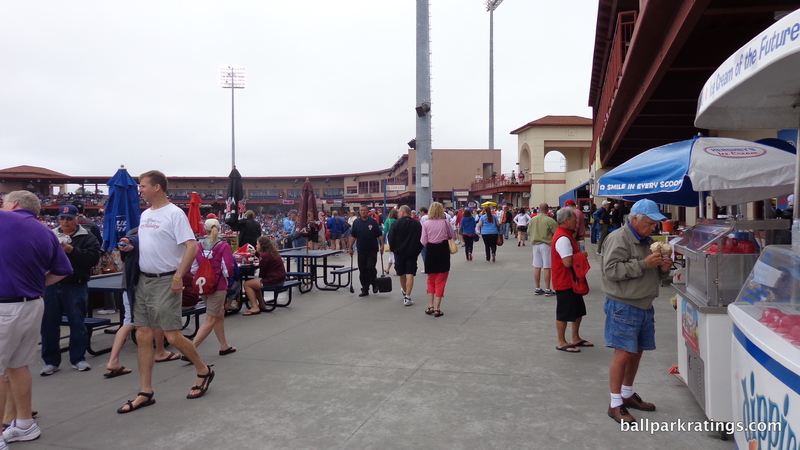 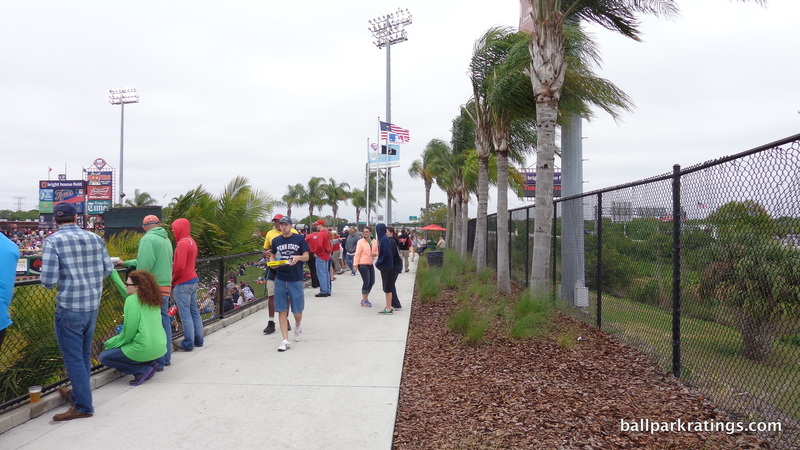 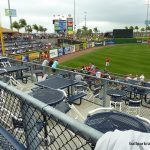 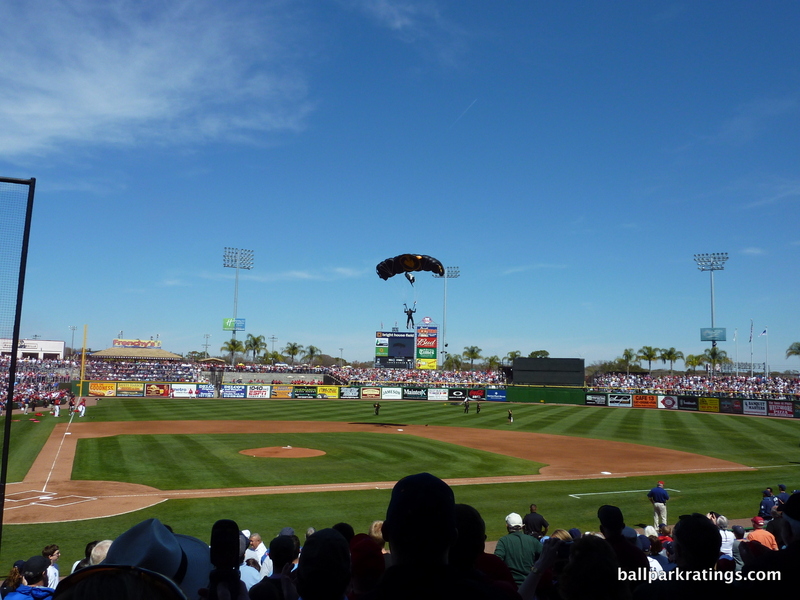 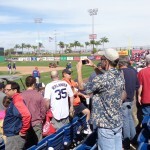 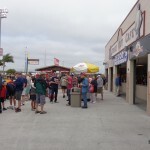 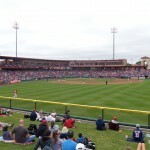 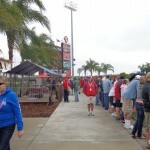 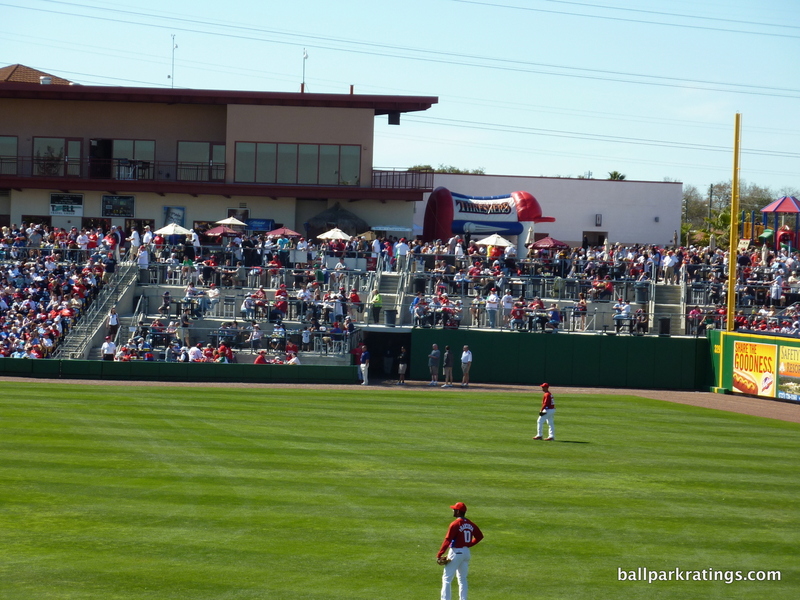 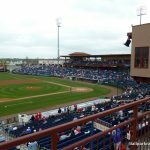 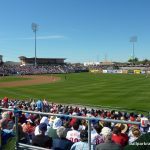 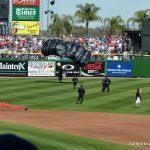 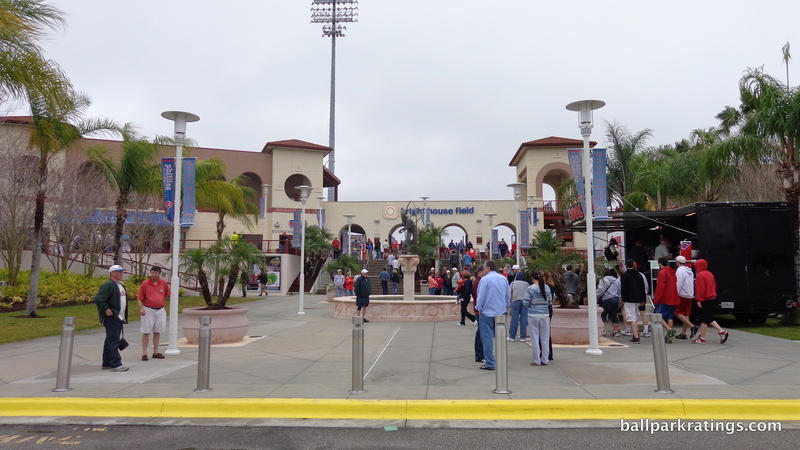 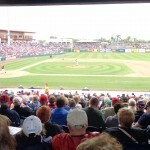 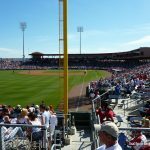 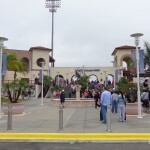 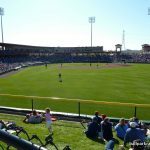 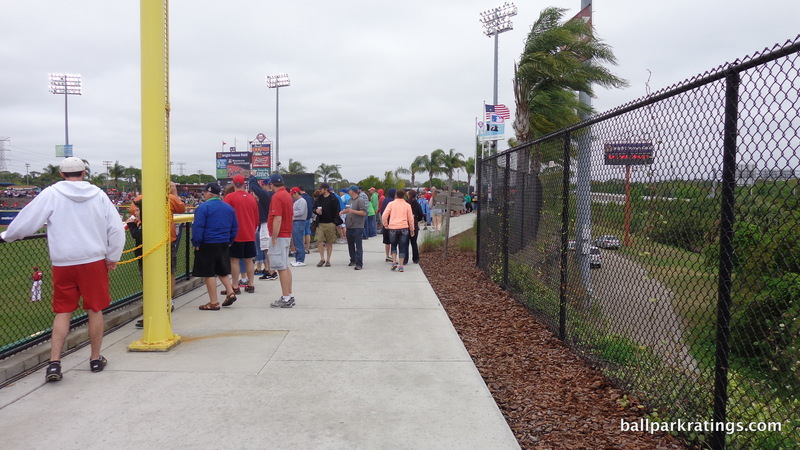 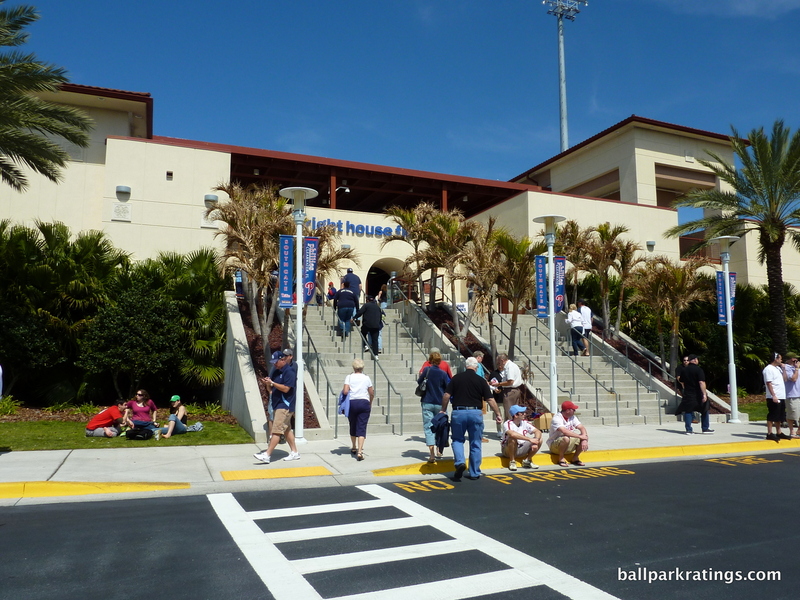 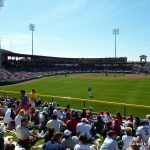 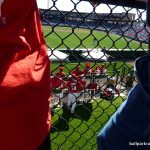 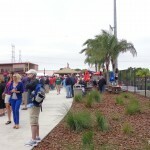 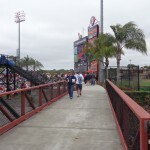 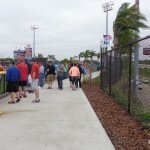 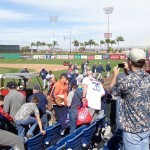 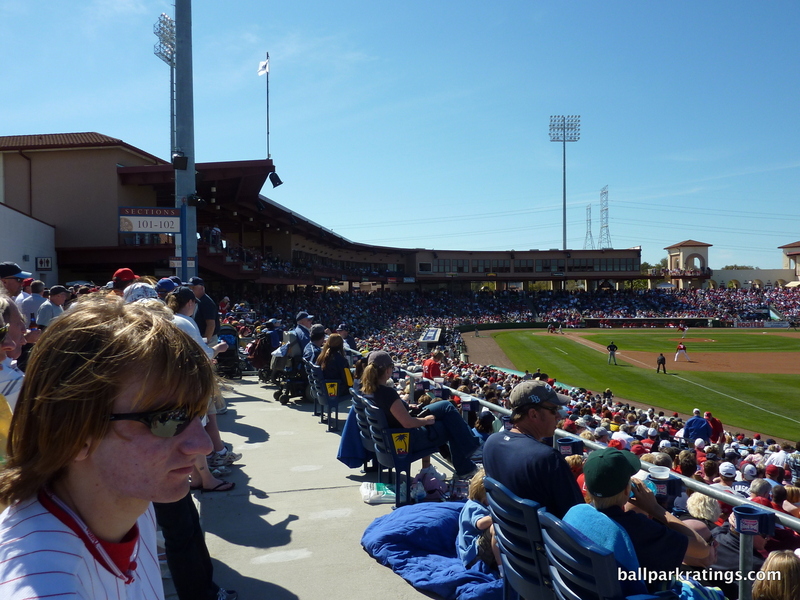 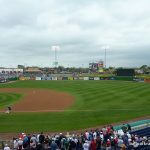 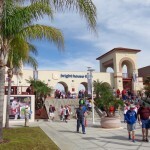 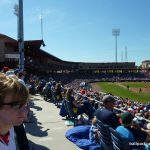 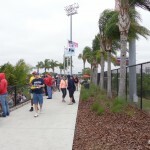 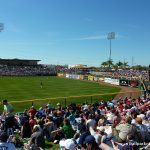 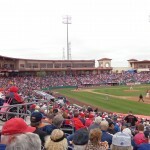 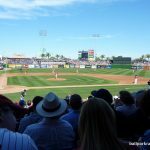 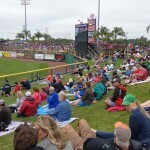 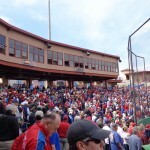 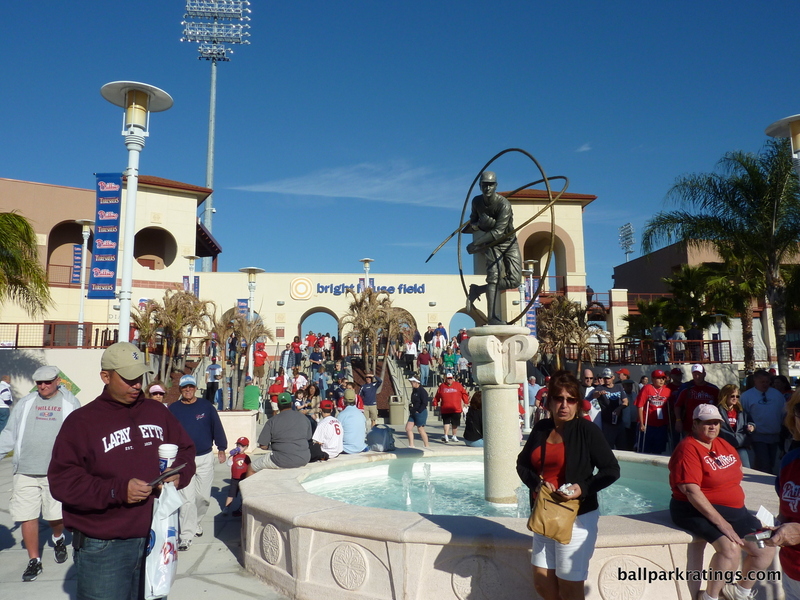 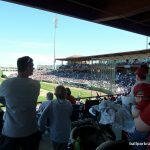 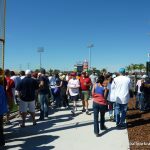 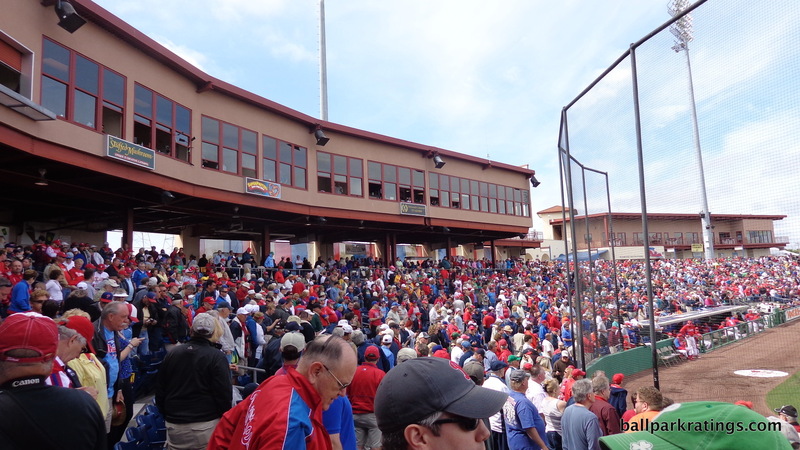 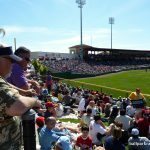 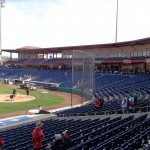 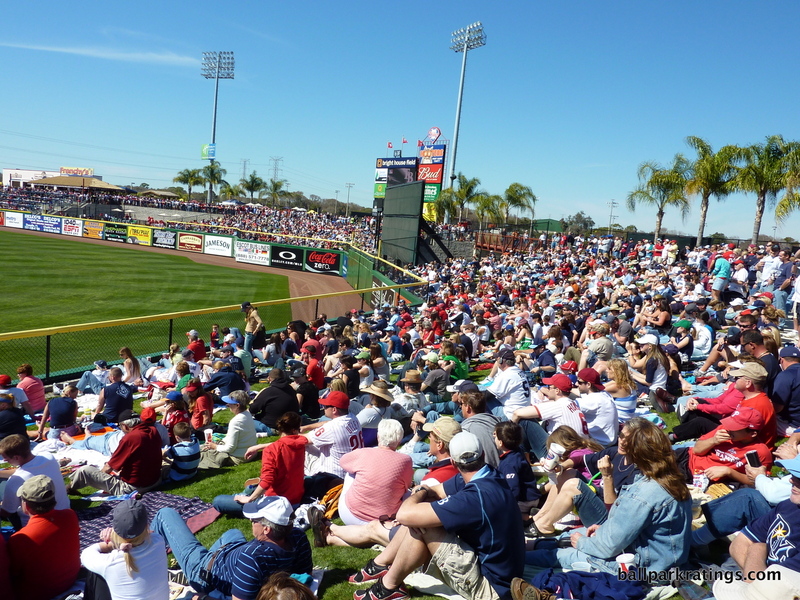 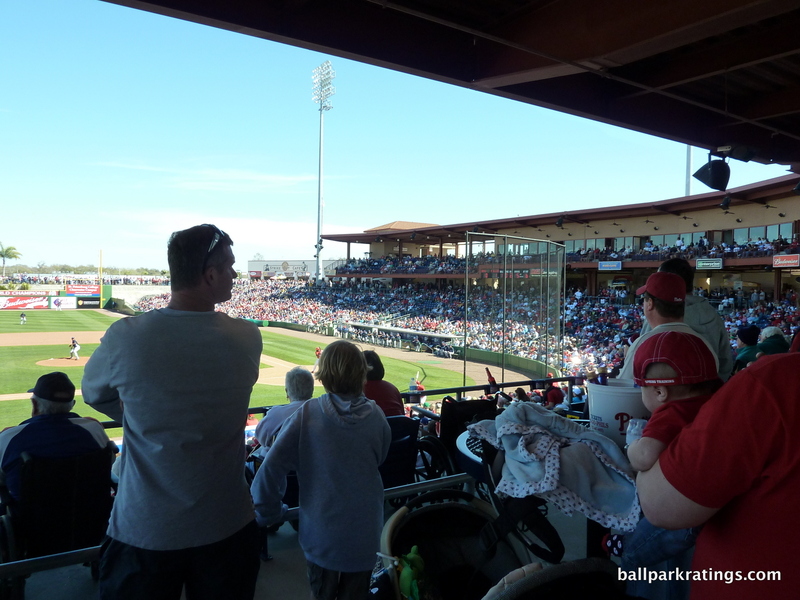 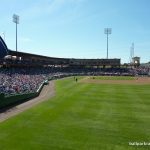 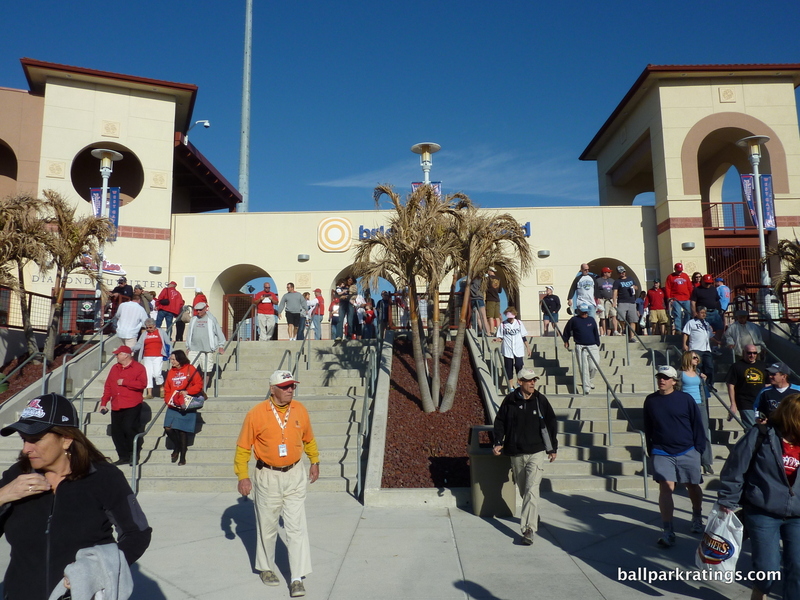 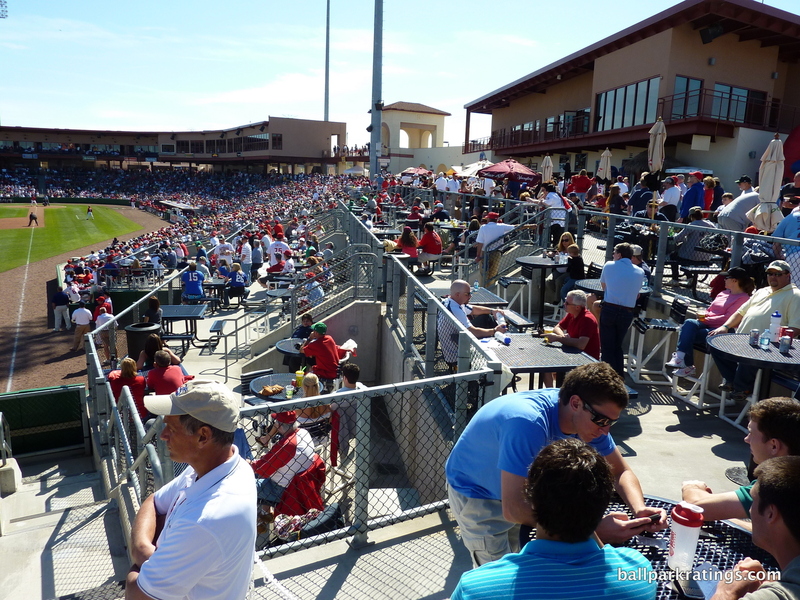 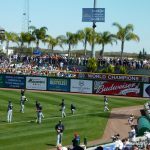 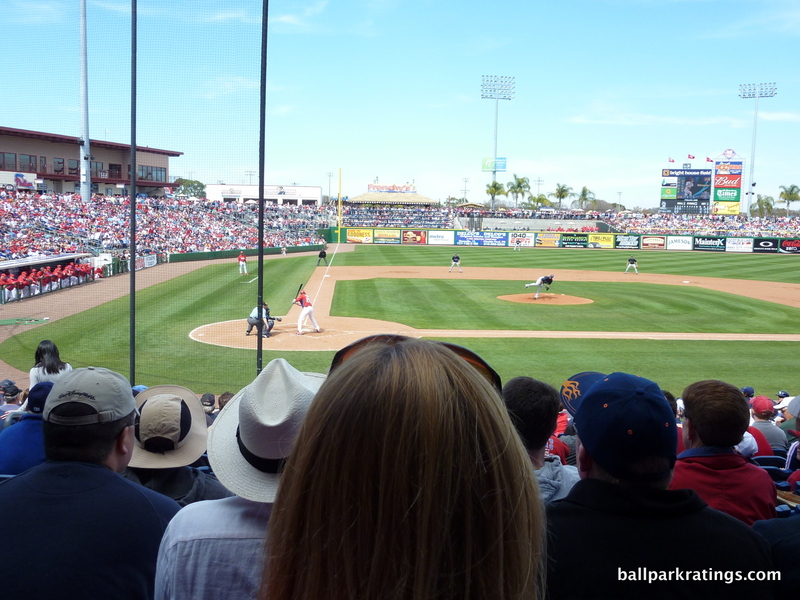 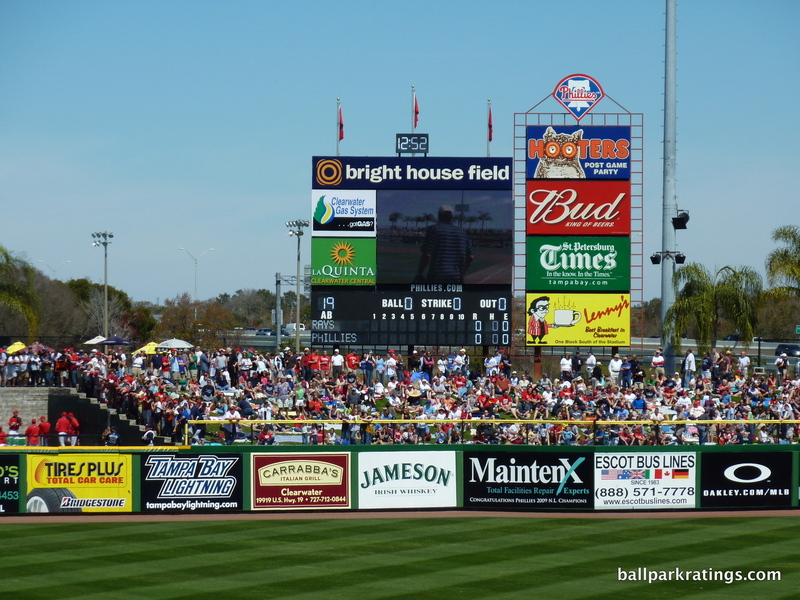 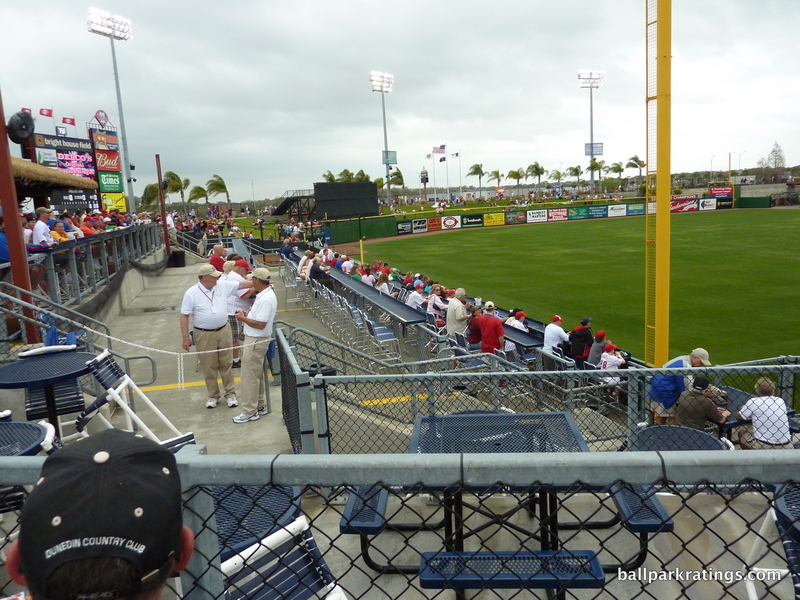 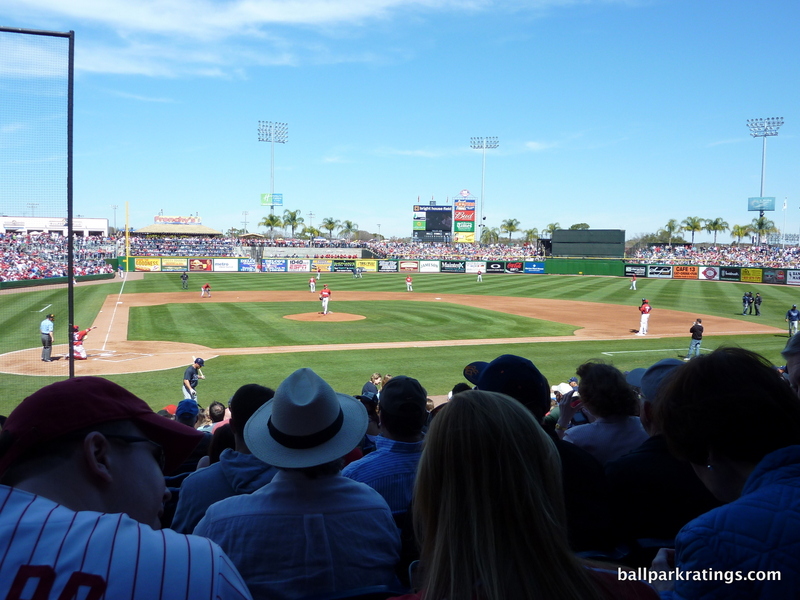 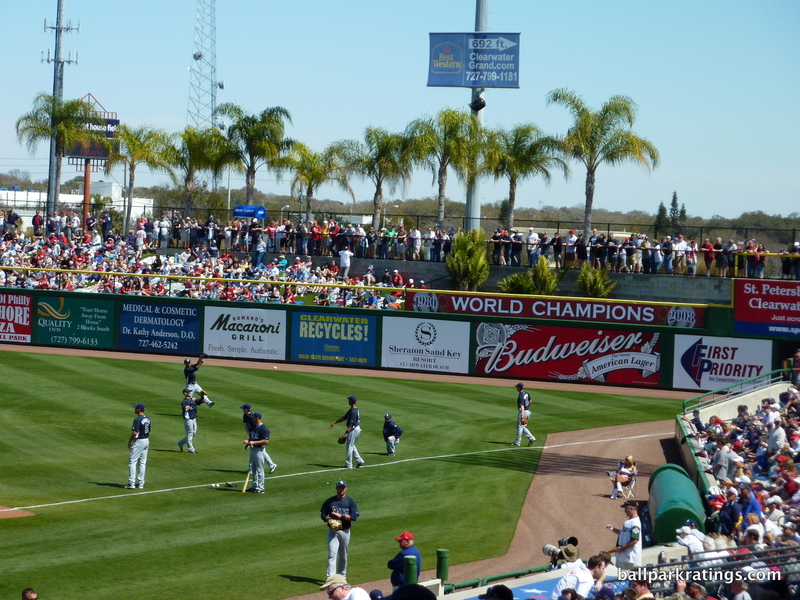 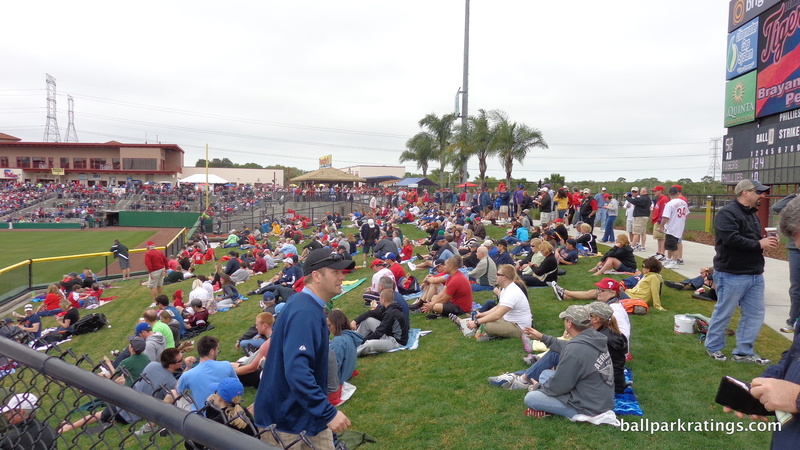 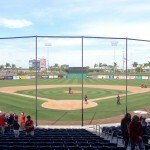 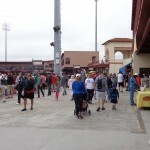 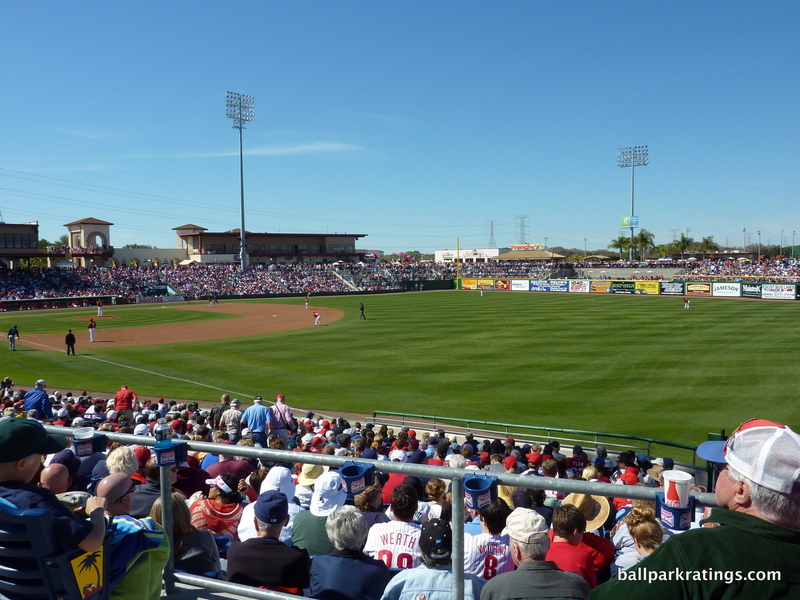 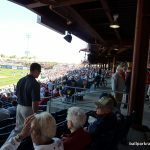 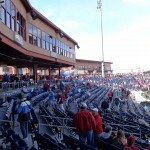 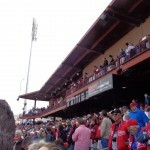 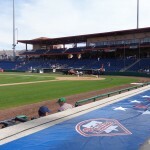 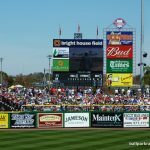 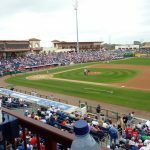 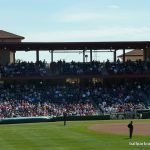 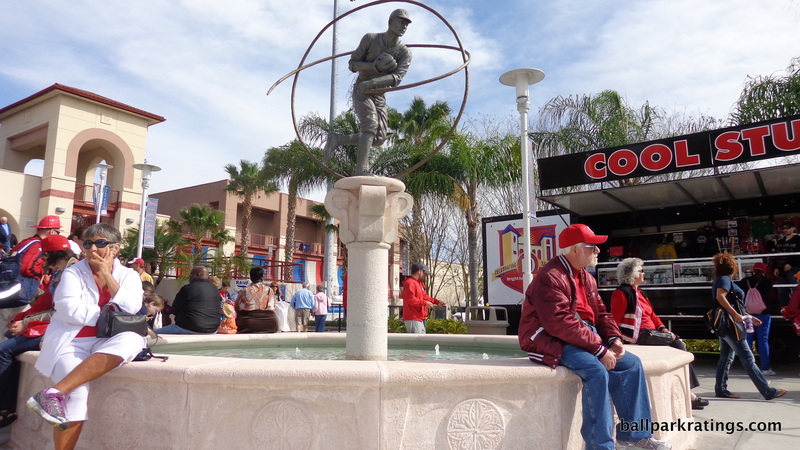 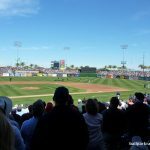 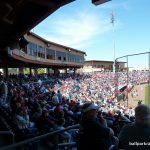 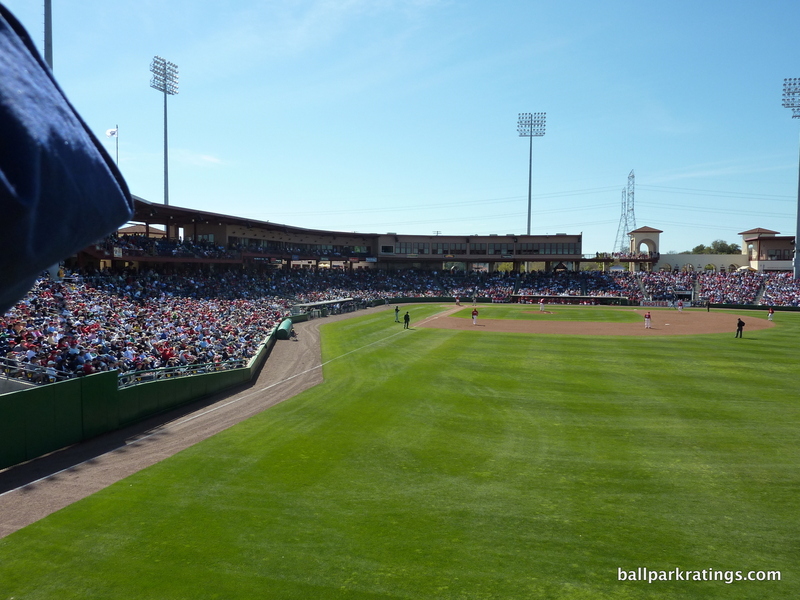 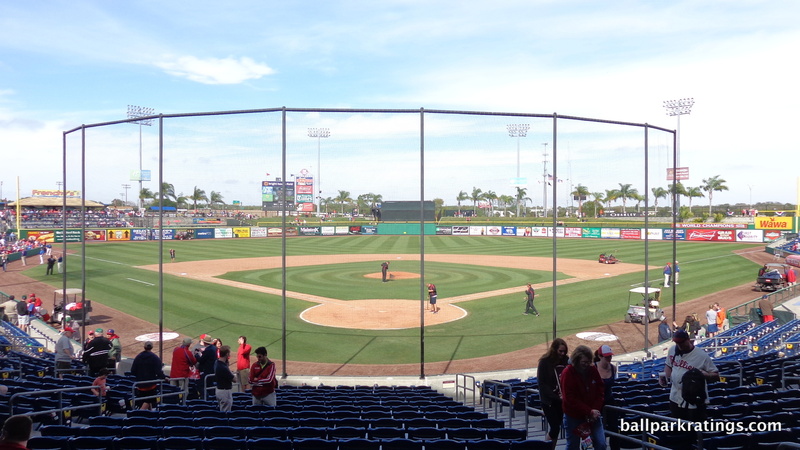 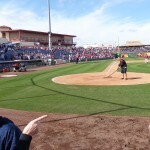 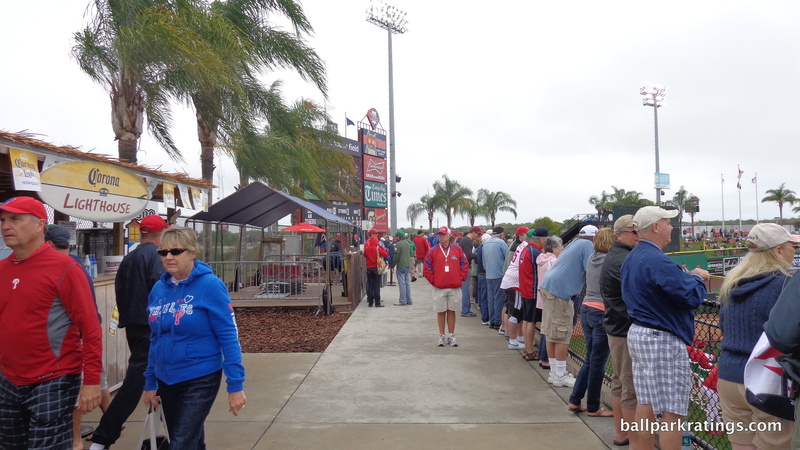 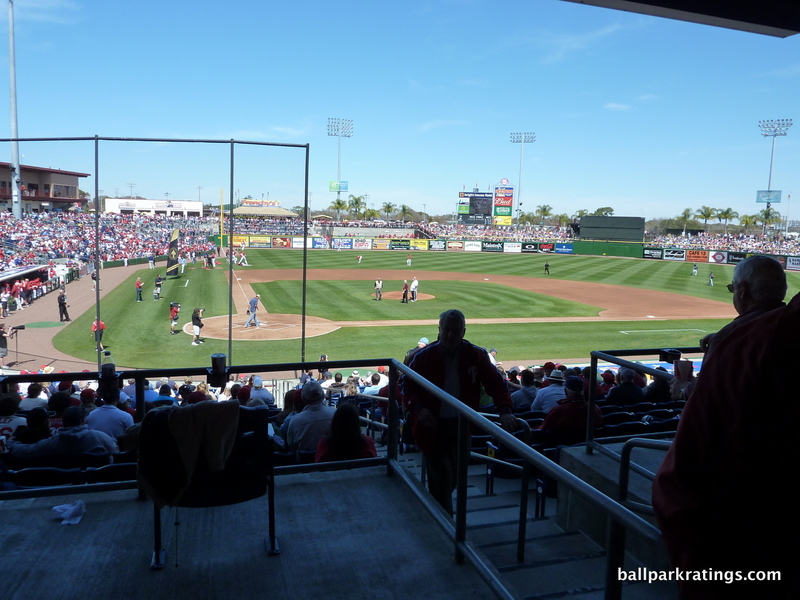 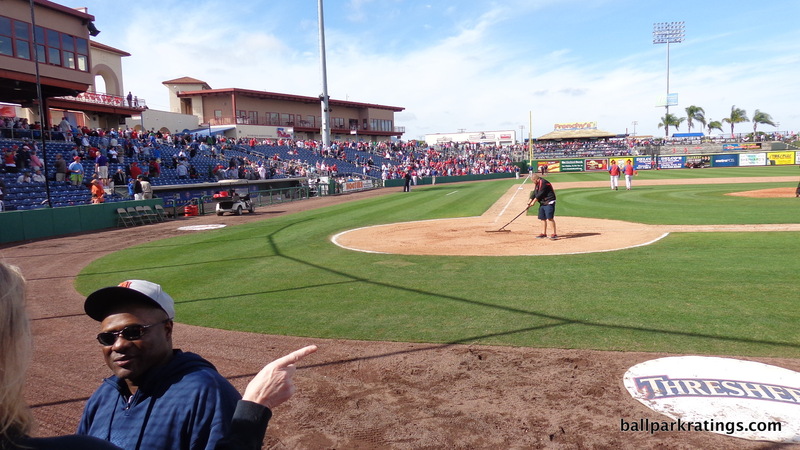 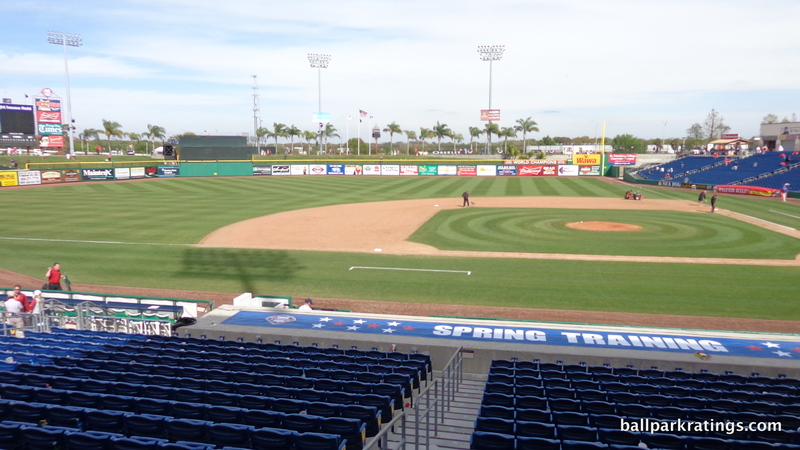 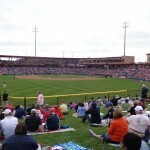 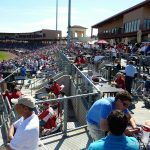 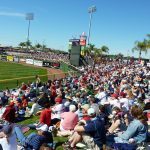 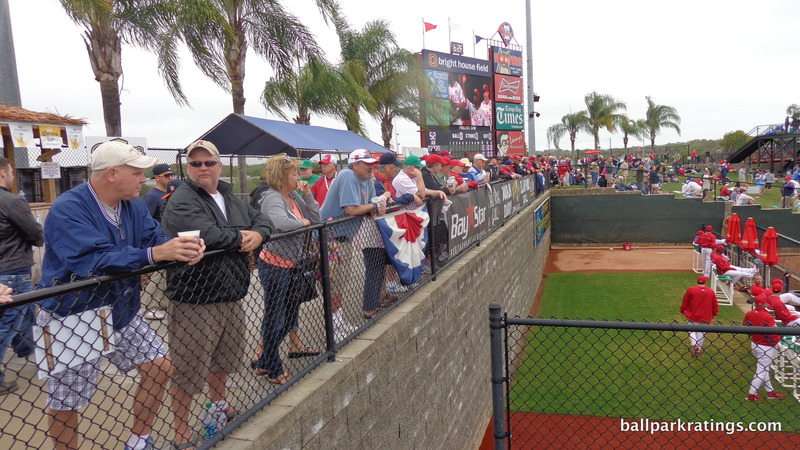 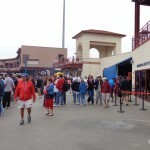 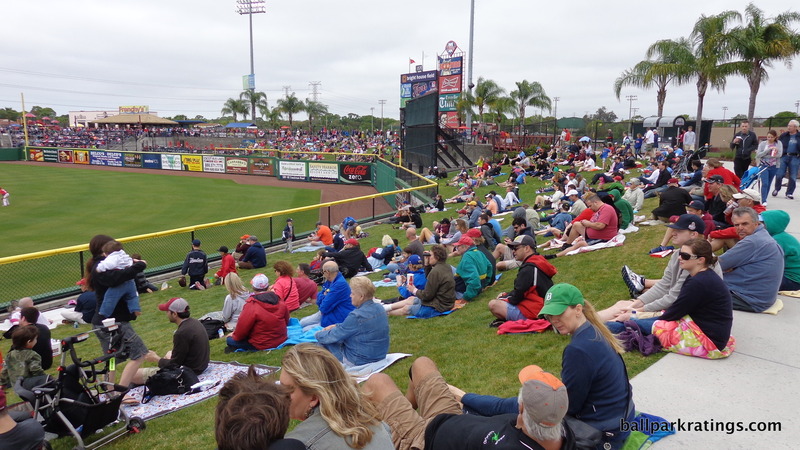 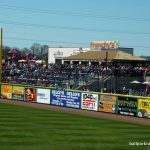 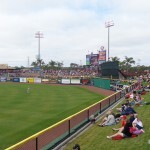 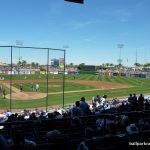 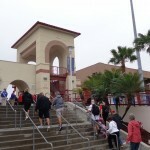 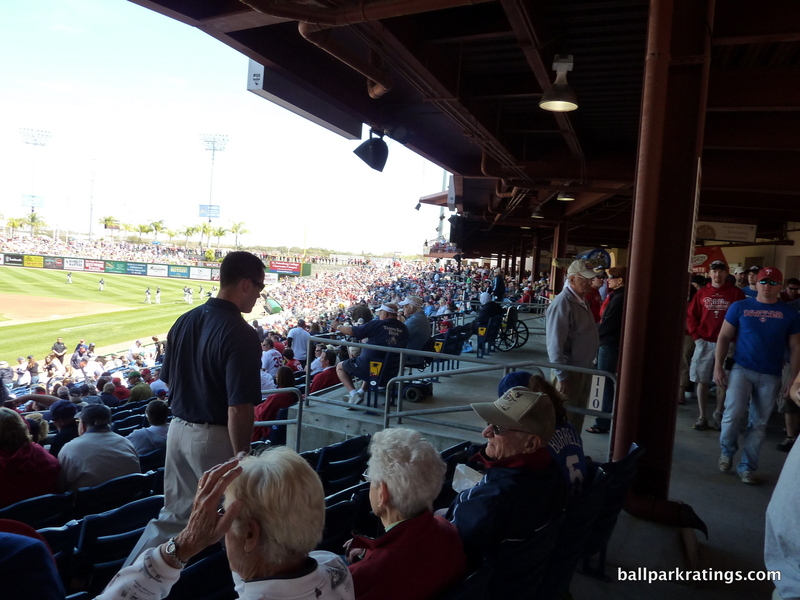 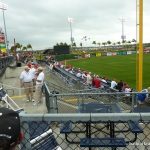 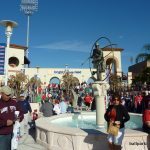 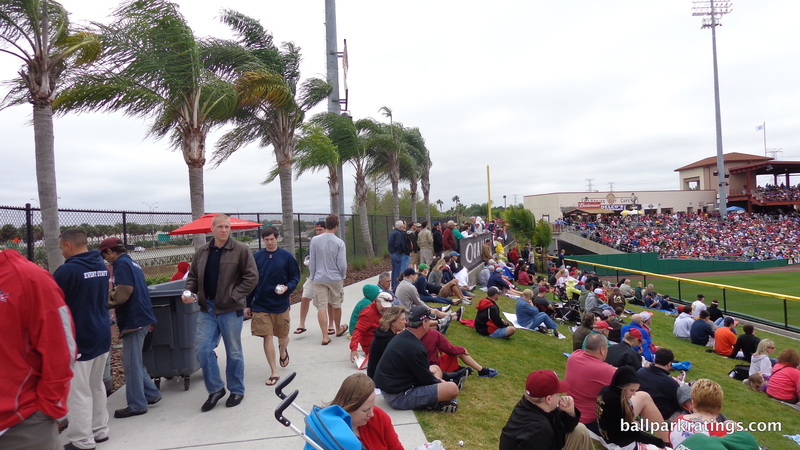 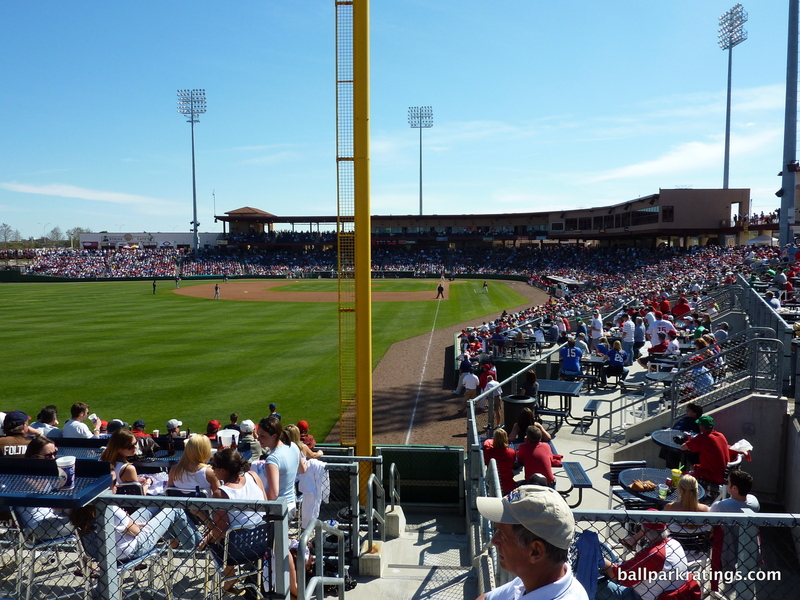 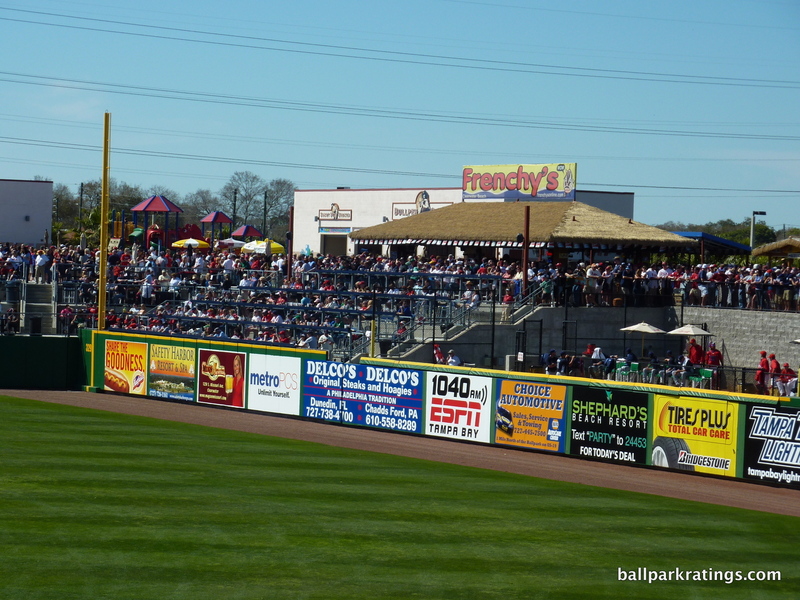 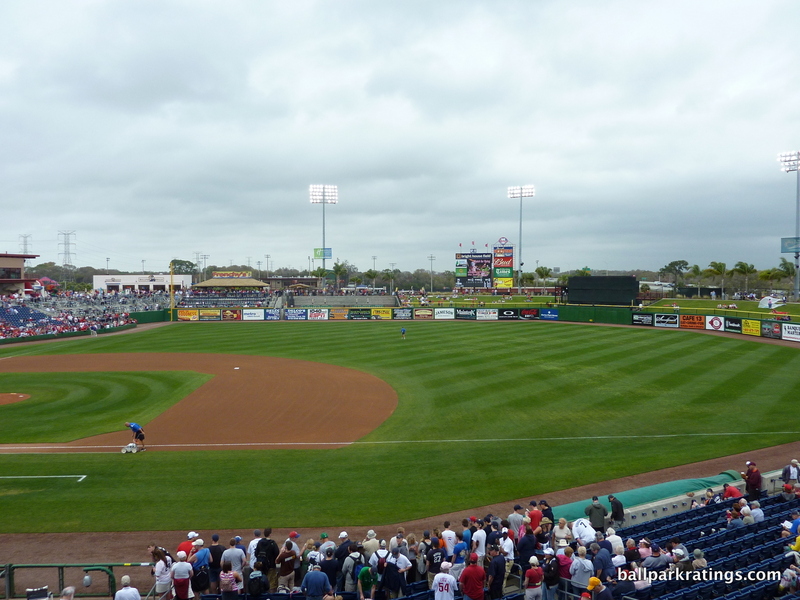 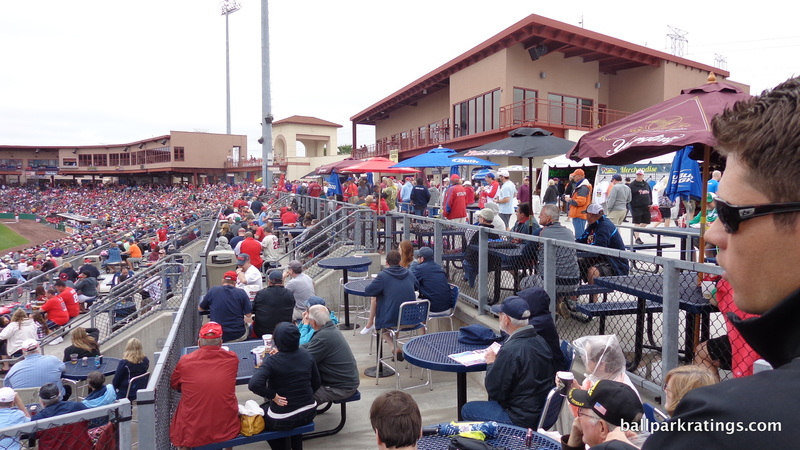 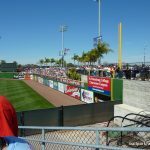 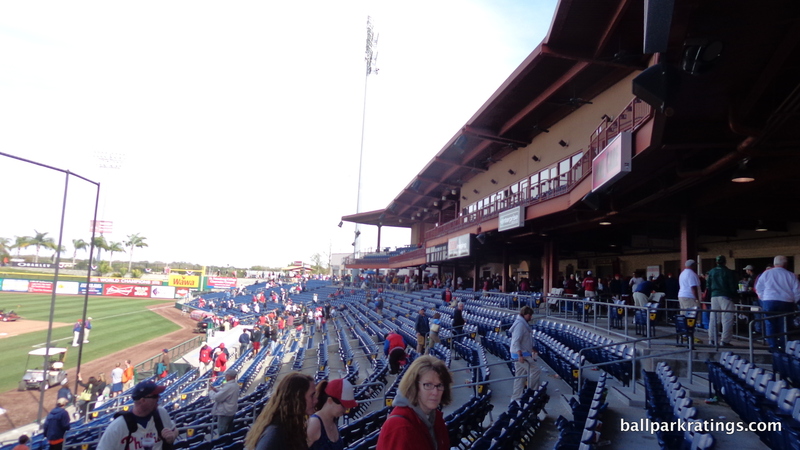 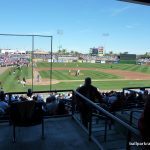 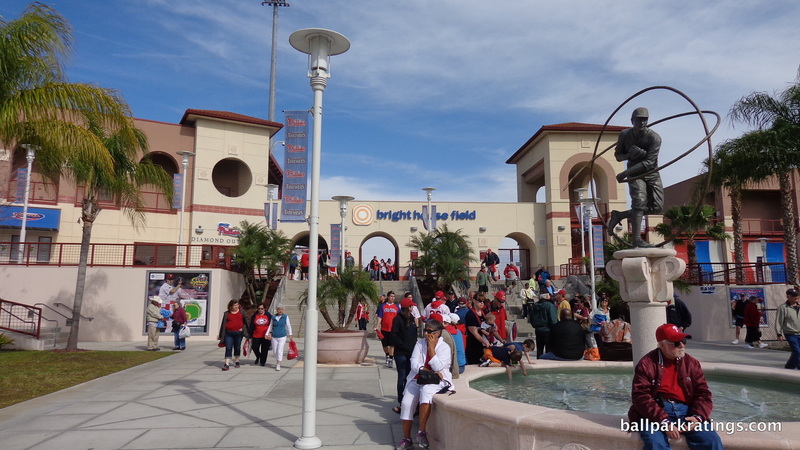 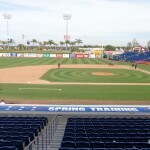 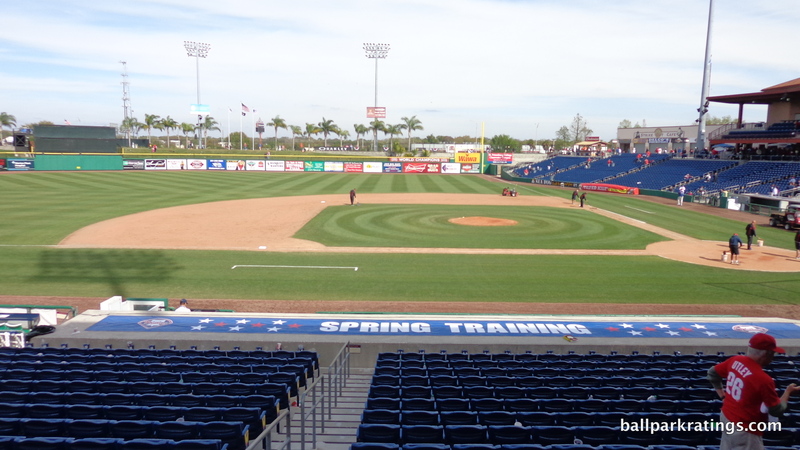 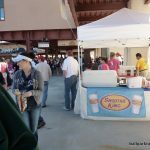 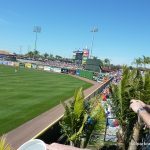 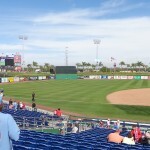 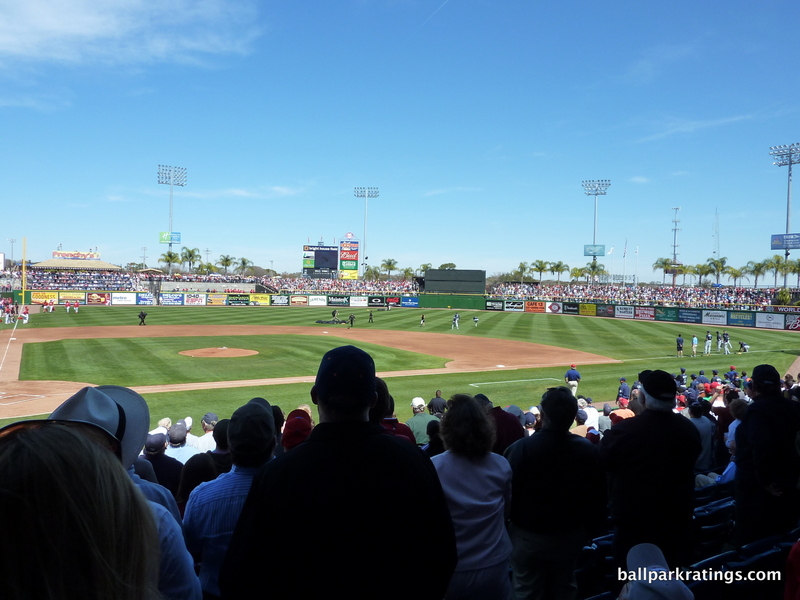 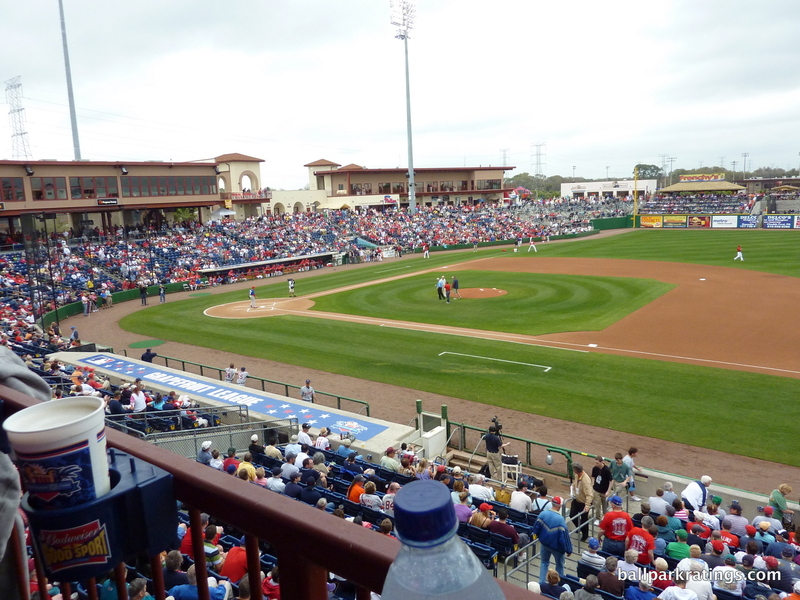 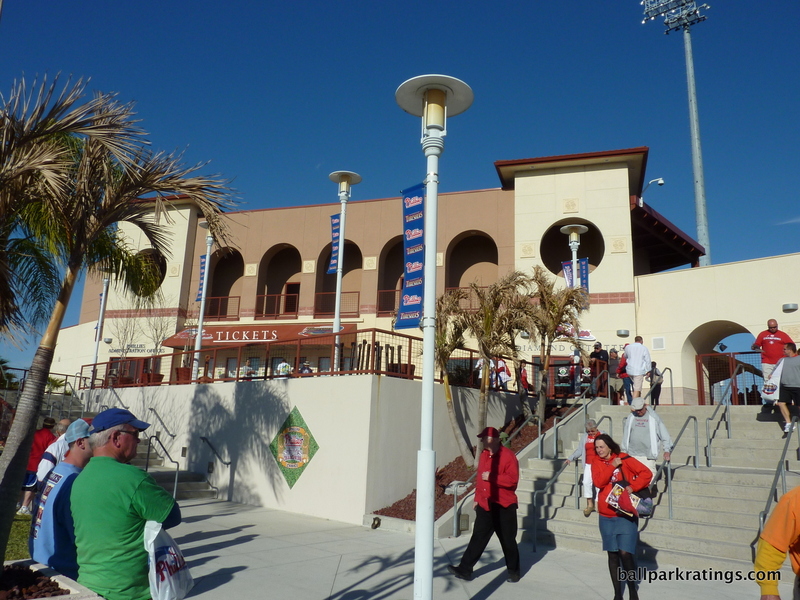 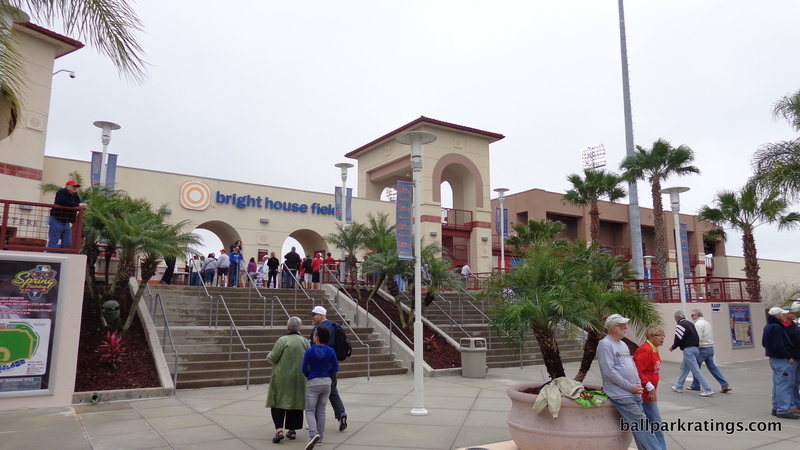 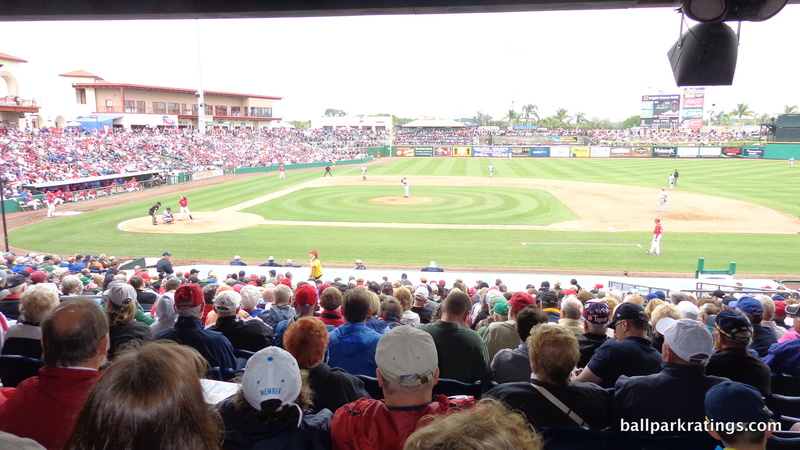 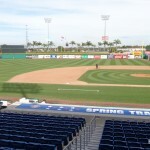 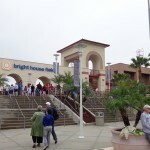 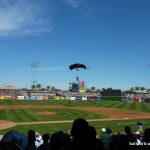 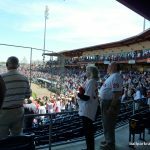 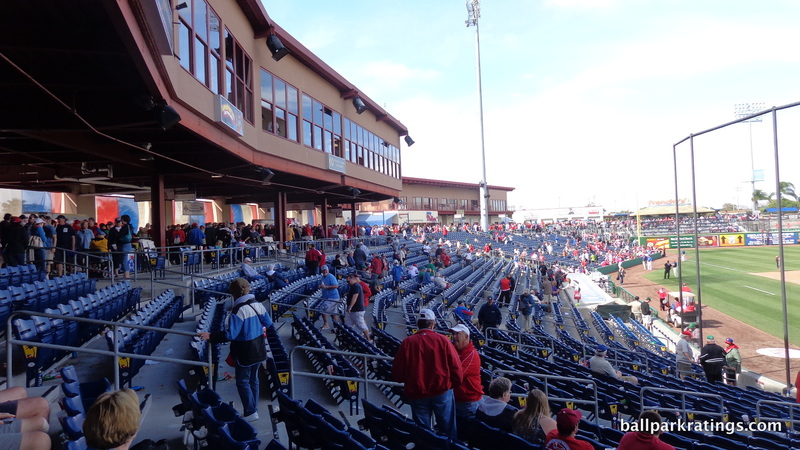 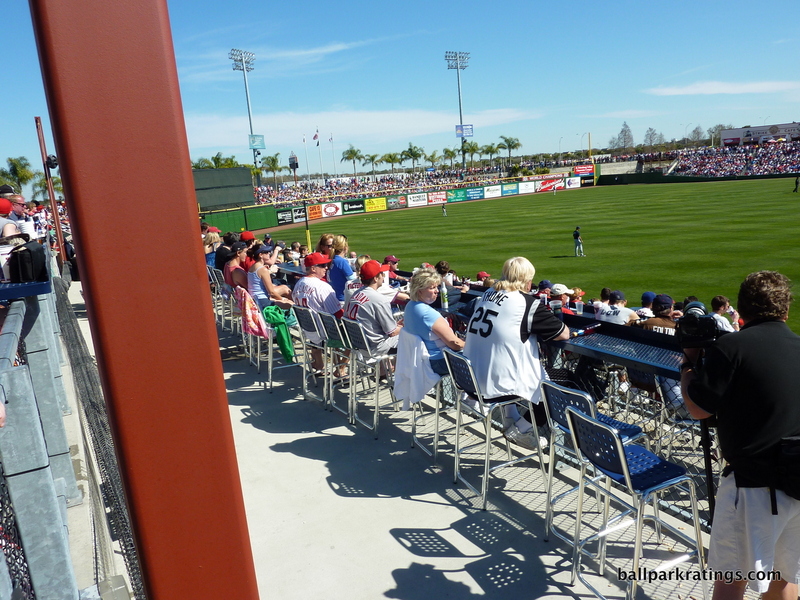 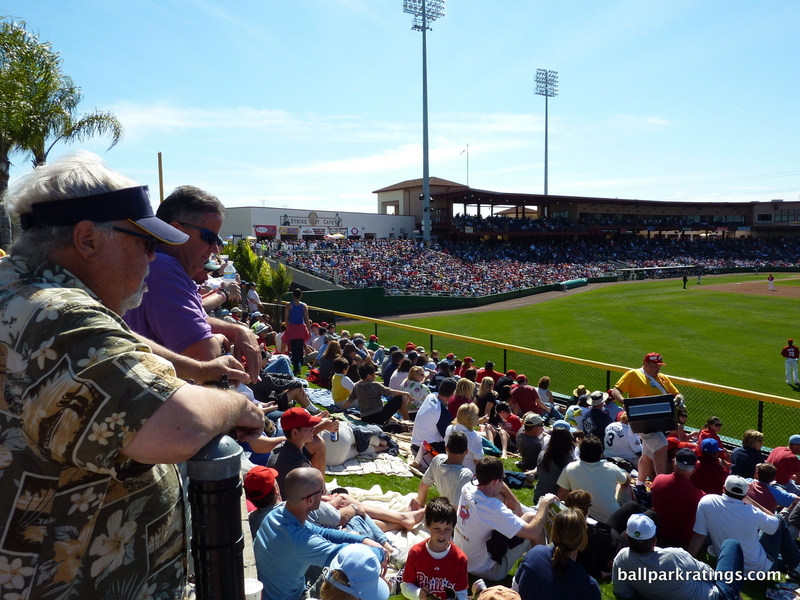 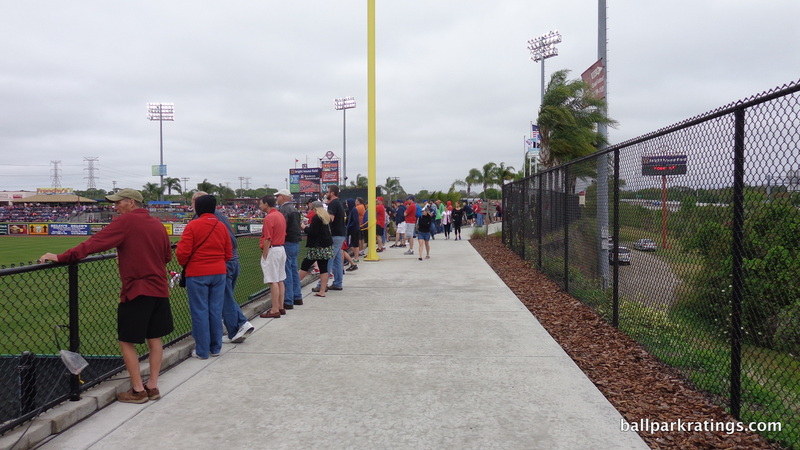 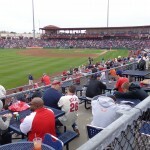 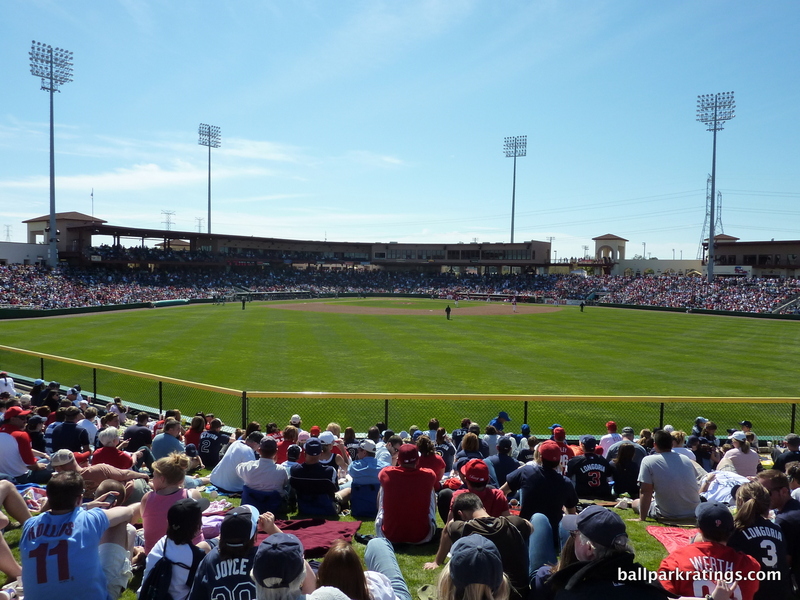 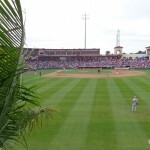 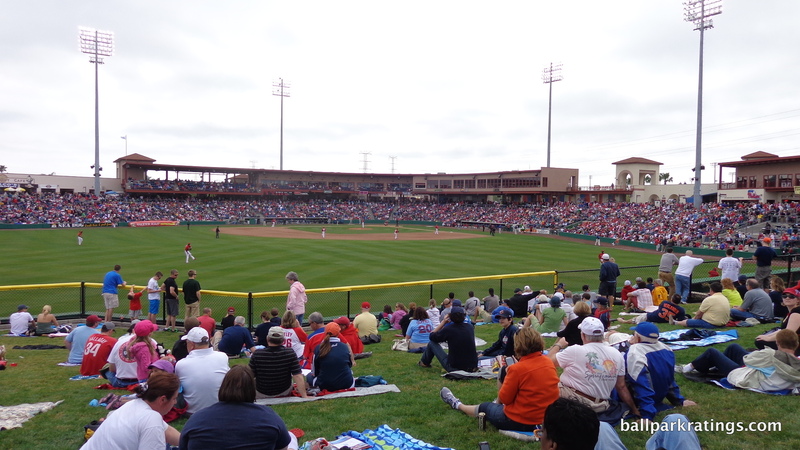 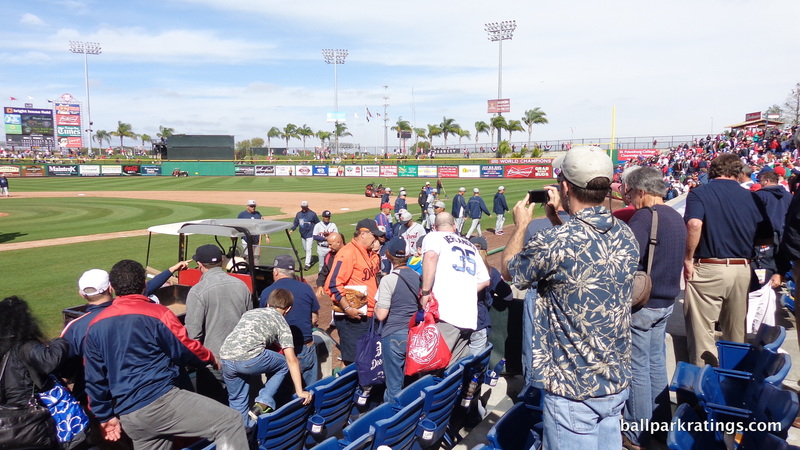 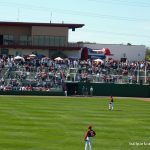 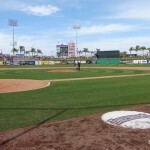 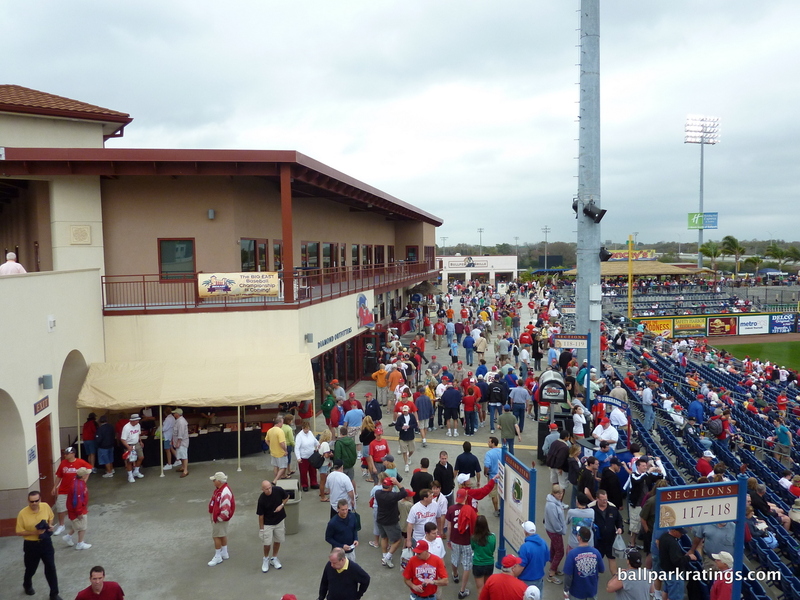 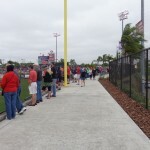 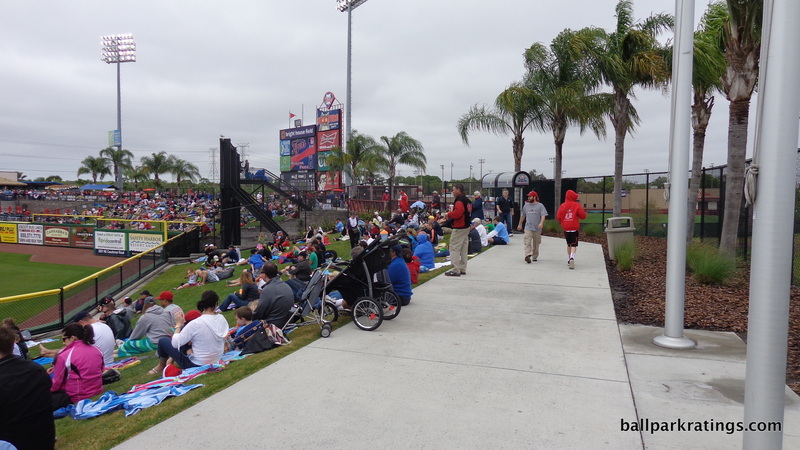 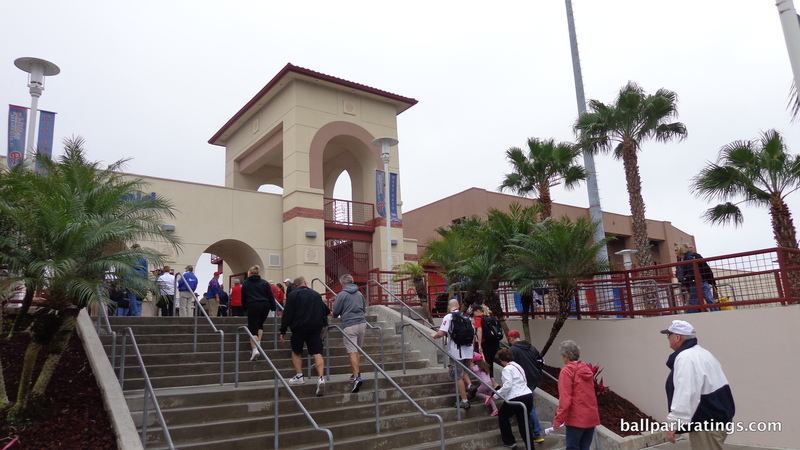 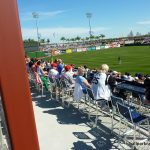 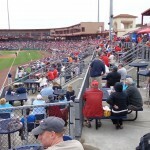 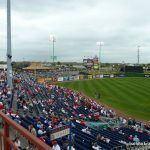 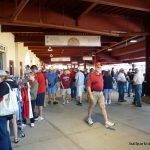 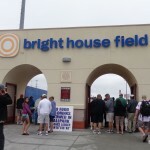 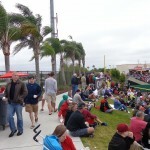 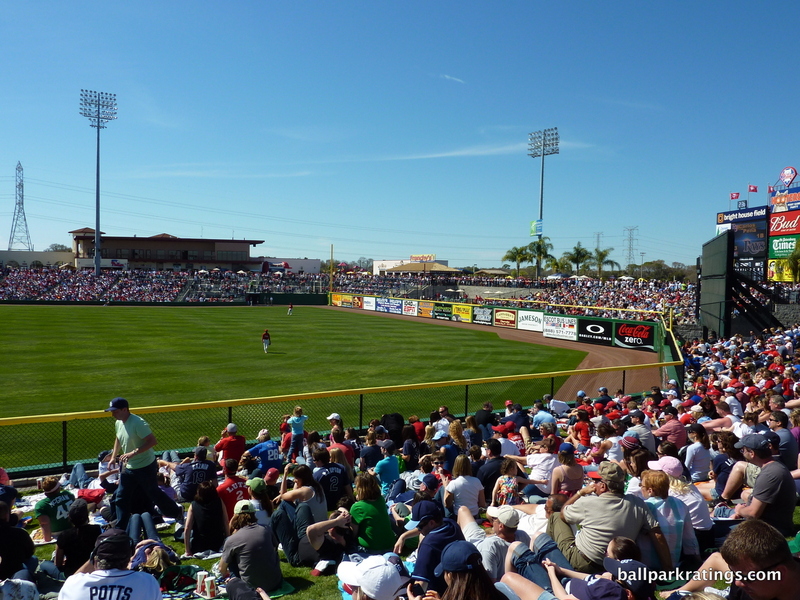 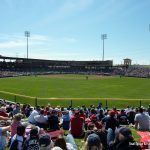 As the first Grapefruit League park with a 360-degree concourse sporting views of the action and a berm encompassing the outfield, Spectrum Field has traditionally been in a league of its own. 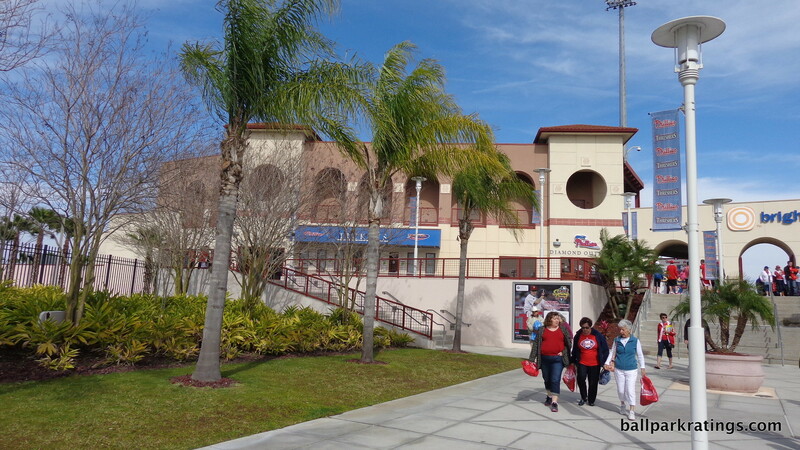 But after six multimillion-dollar renovation projects across the state, Spectrum Field is no longer self-evidently outstanding. 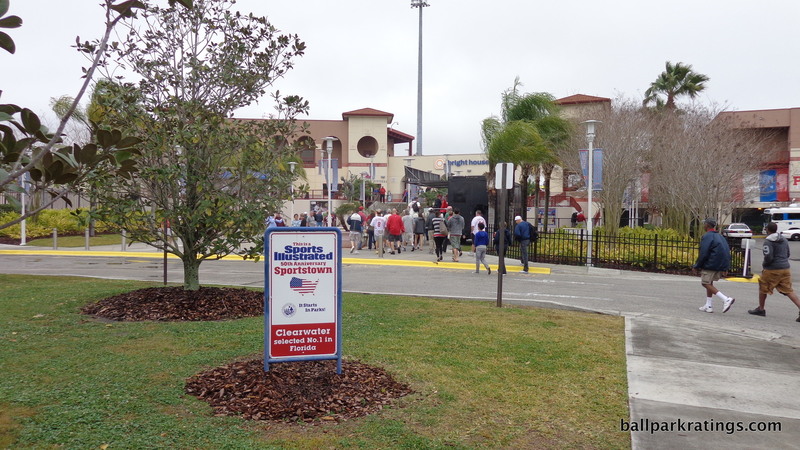 Nor does it have the superlatives of some other great spring training parks. 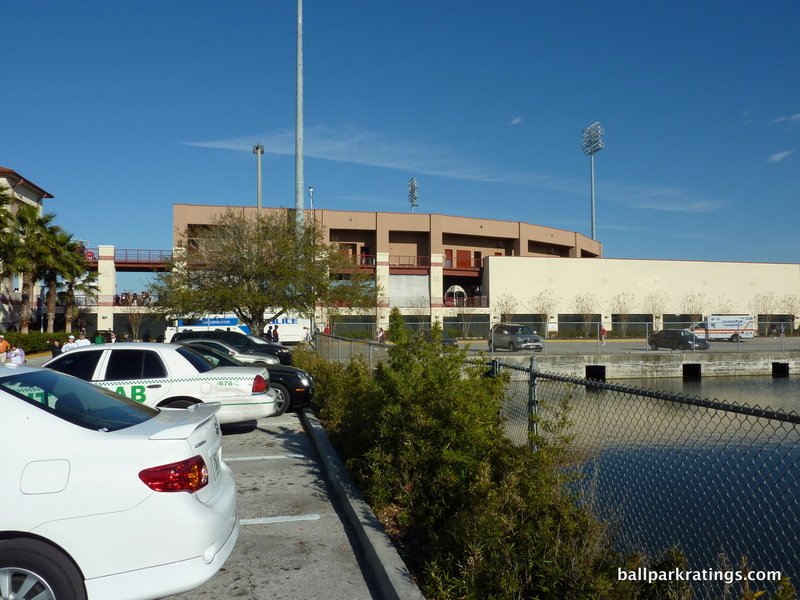 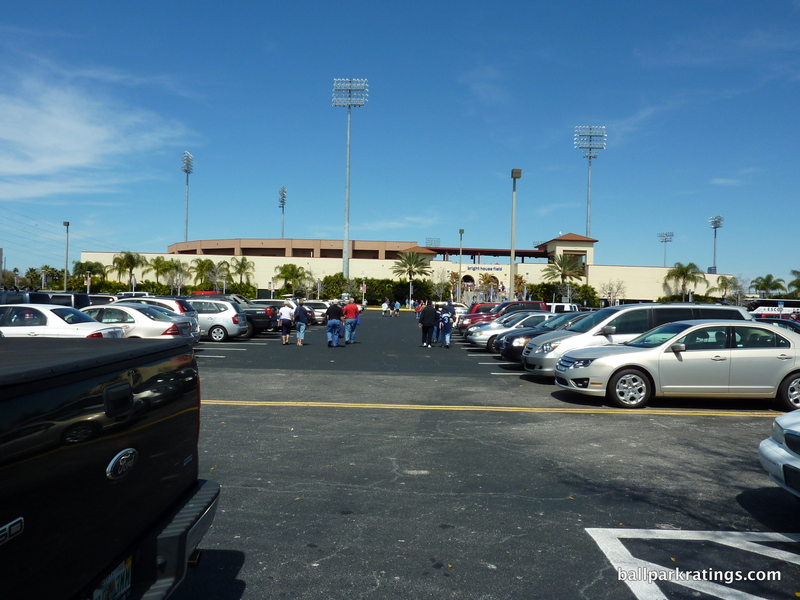 It doesn’t have the impressive array of amenities like Steinbrenner Field (Yankees). 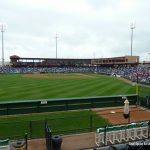 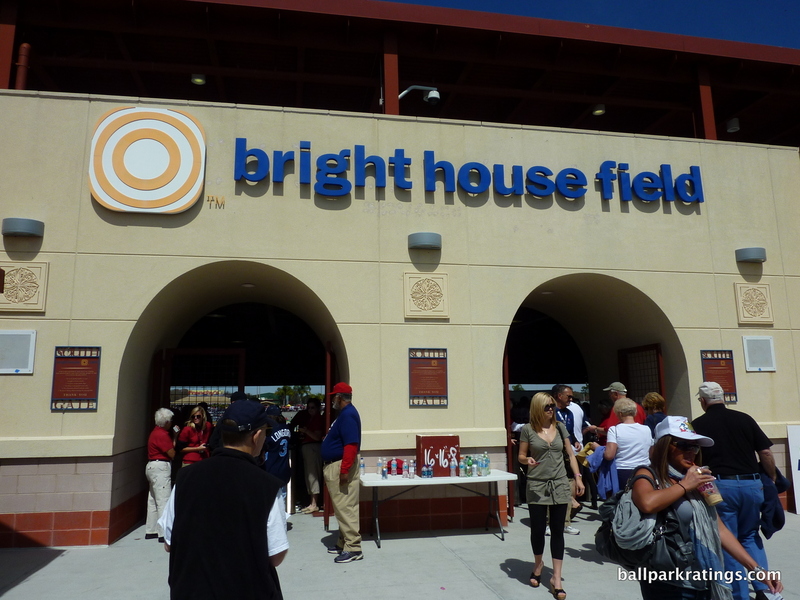 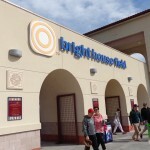 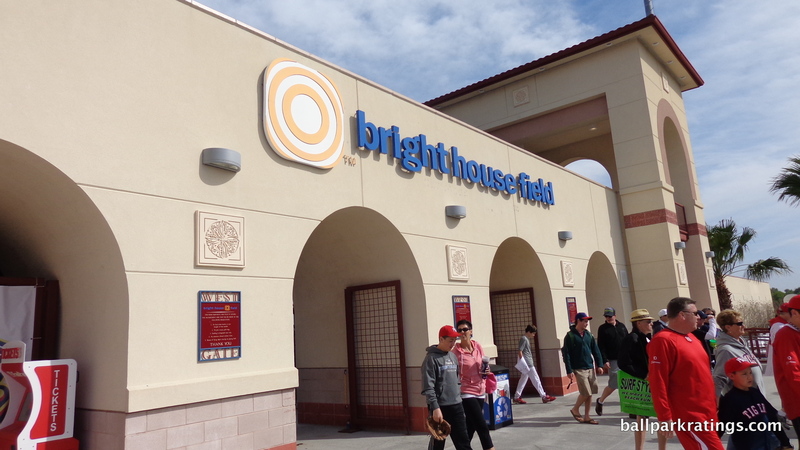 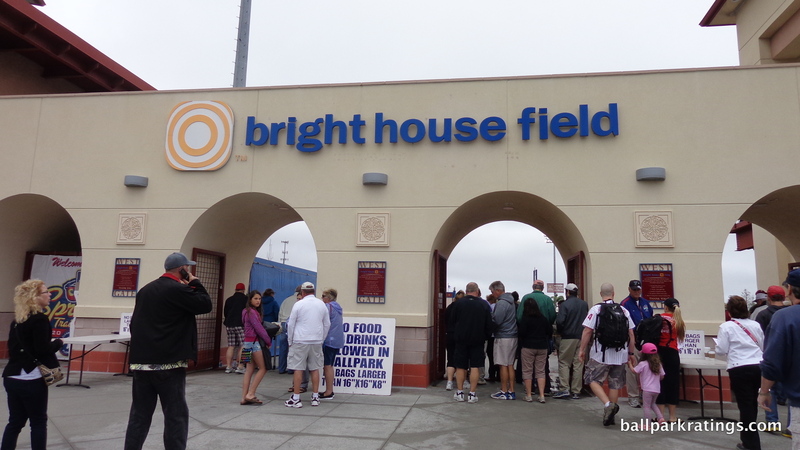 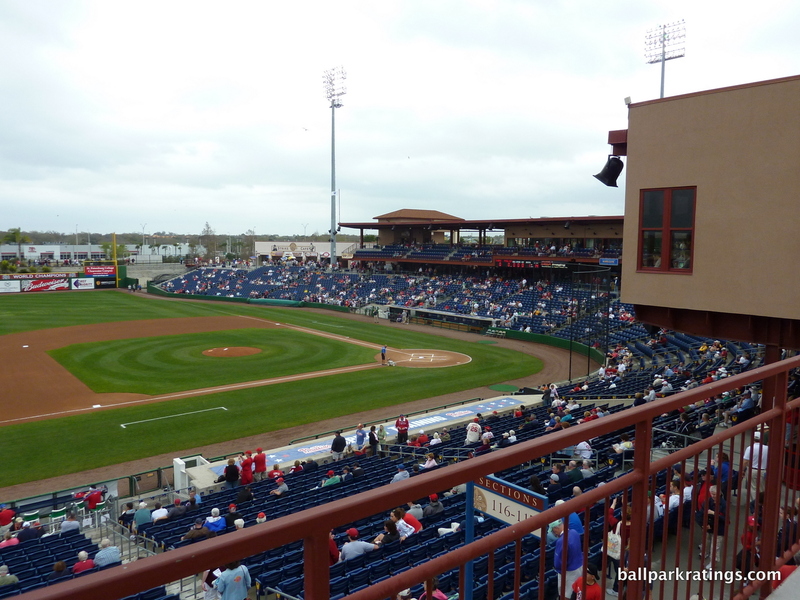 It doesn’t have the stunning or distinctive architecture of an Ed Smith Stadium (Orioles) or Joker Marchant Stadium (Tigers), much less that of the three outstanding parks in Arizona. 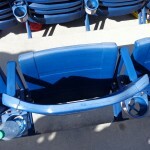 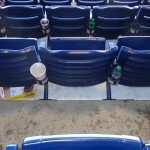 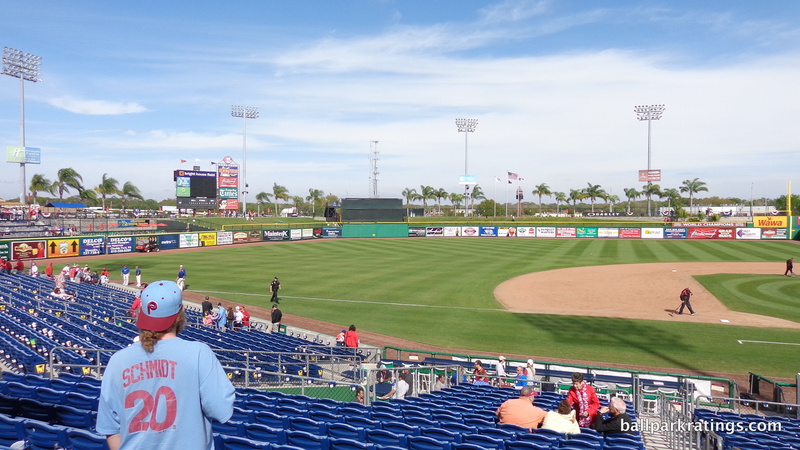 It doesn’t even have the superior functionality of the Ballpark of the Palm Beaches (Astros and Nationals). 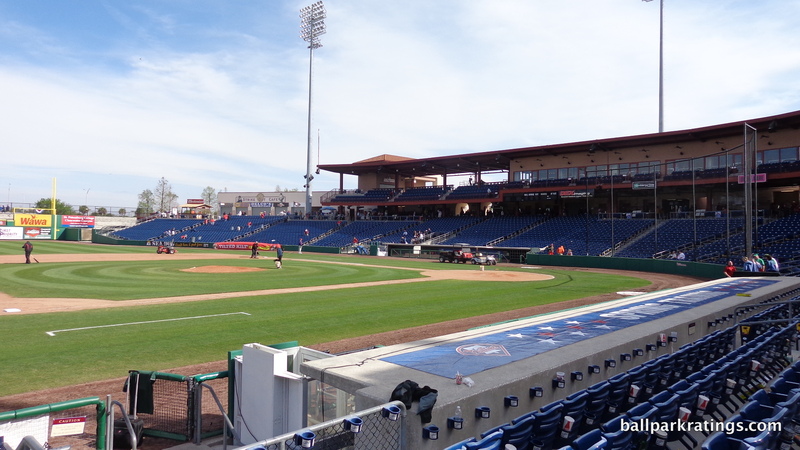 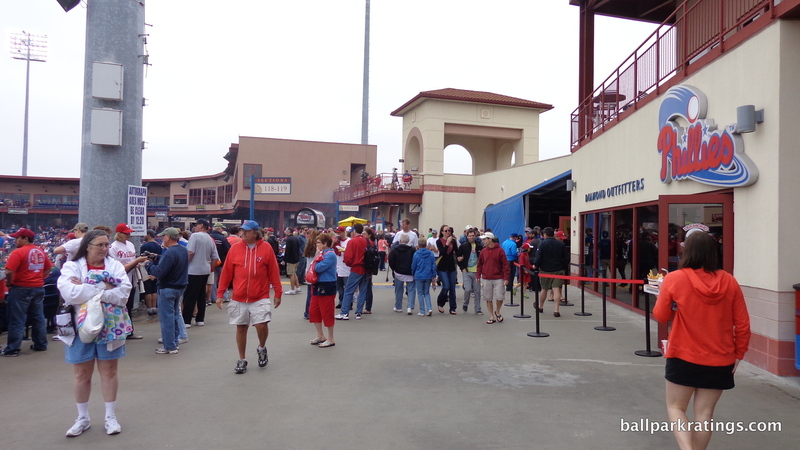 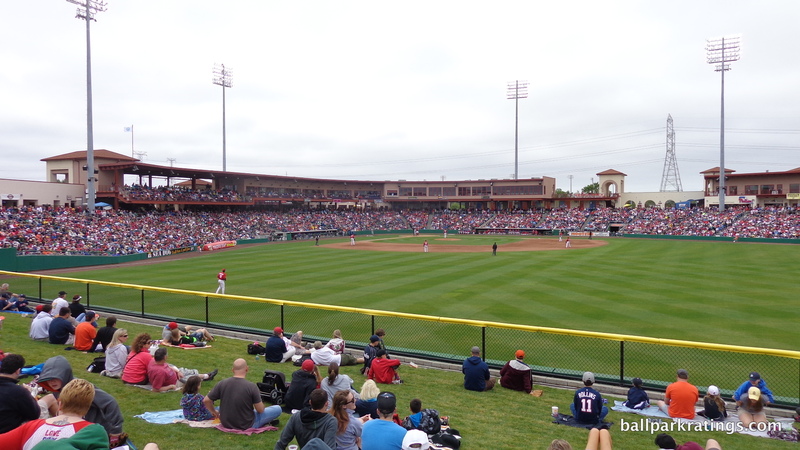 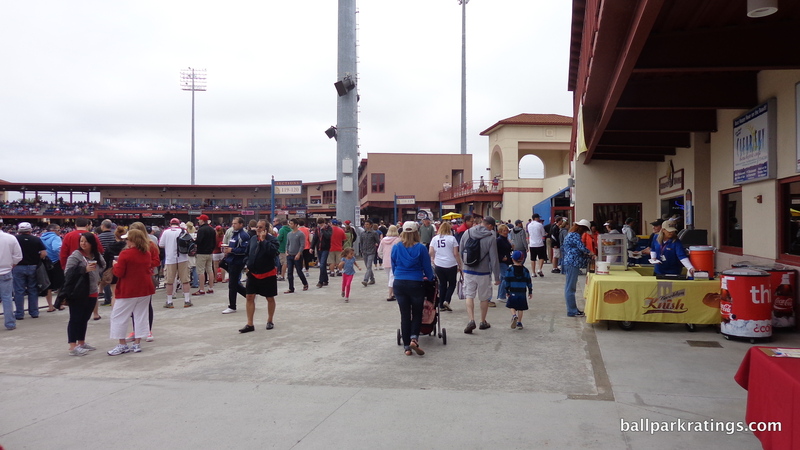 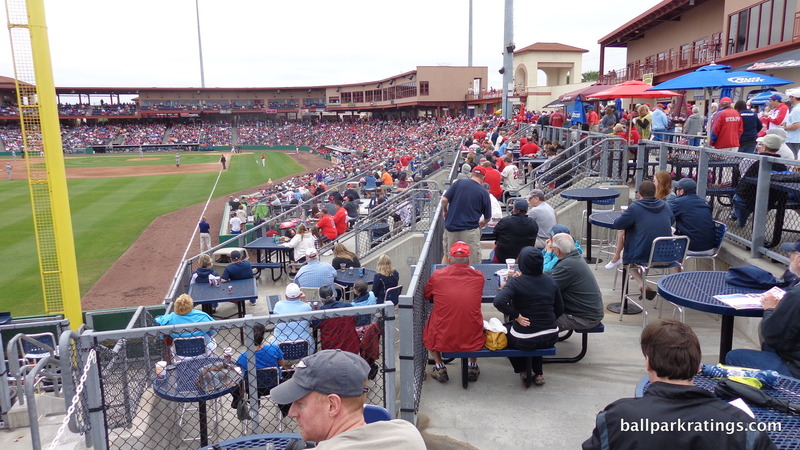 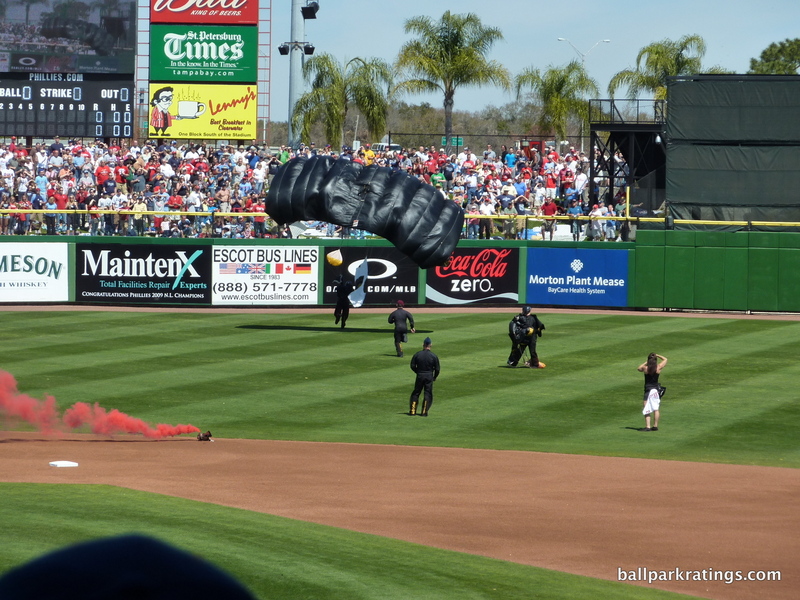 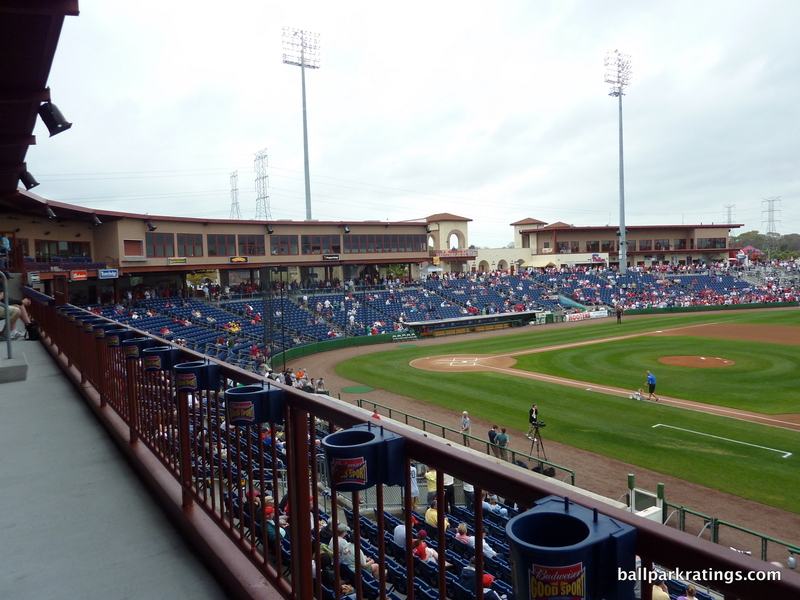 But today, Spectrum Field still ranges from very good to great in most of those respects, presenting the most well-rounded ballpark experience in the Grapefruit League. 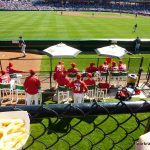 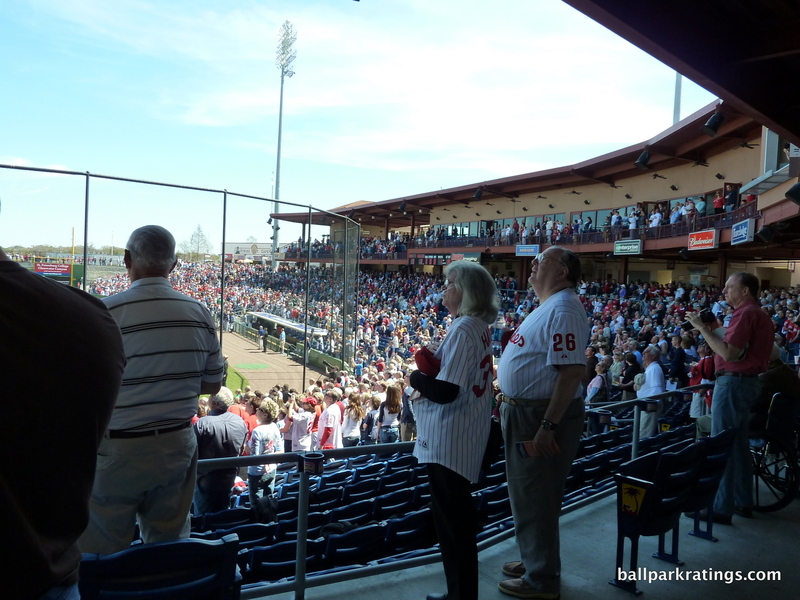 Designed in a Spanish Mediterranean architectural style infused with a distinctively Philadelphian flare, the Phillies’ park checks all of the boxes, with great functionality, memorable fan-friendly amenities, pleasant aesthetics, and a vibrant atmosphere. 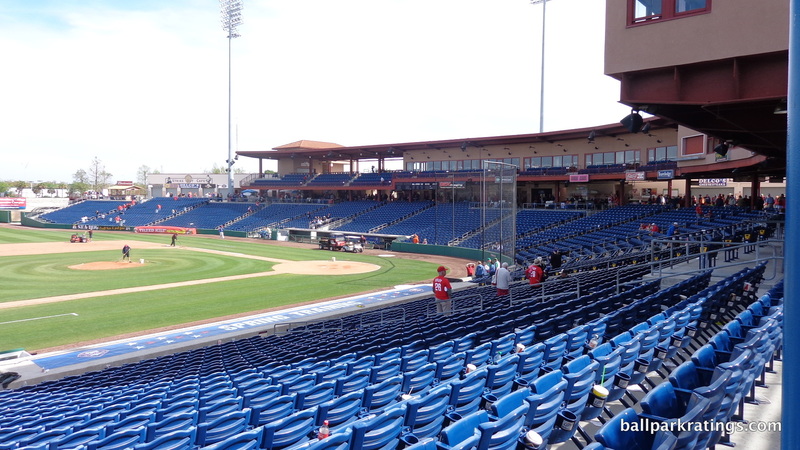 I’m comfortable putting Spectrum Field #1 in Florida spring training, even if it does kind of feel like it earned this placement by default. 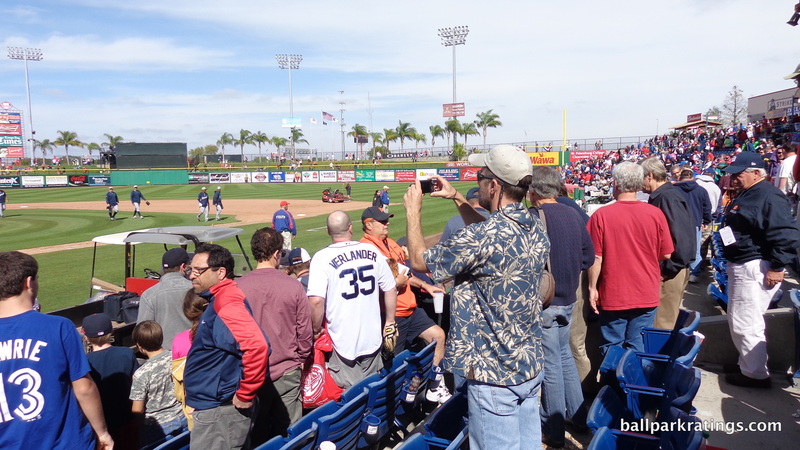 It doesn’t have any of the major blemishes of otherwise great Grapefruit League parks, even if those parks may be more outstanding in one respect or another. 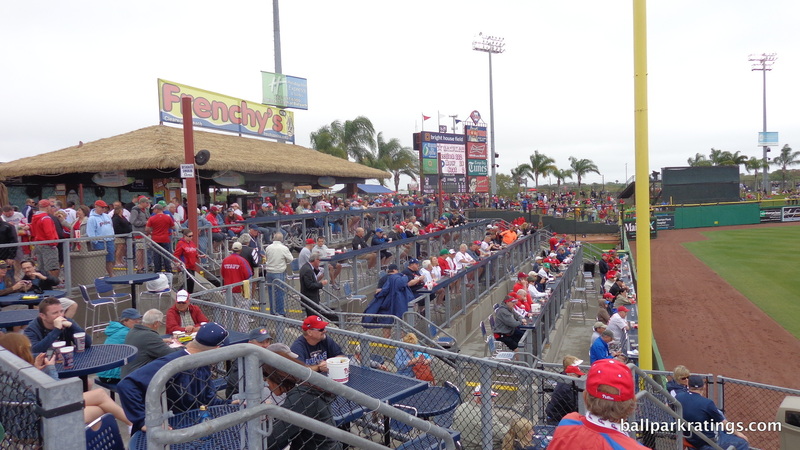 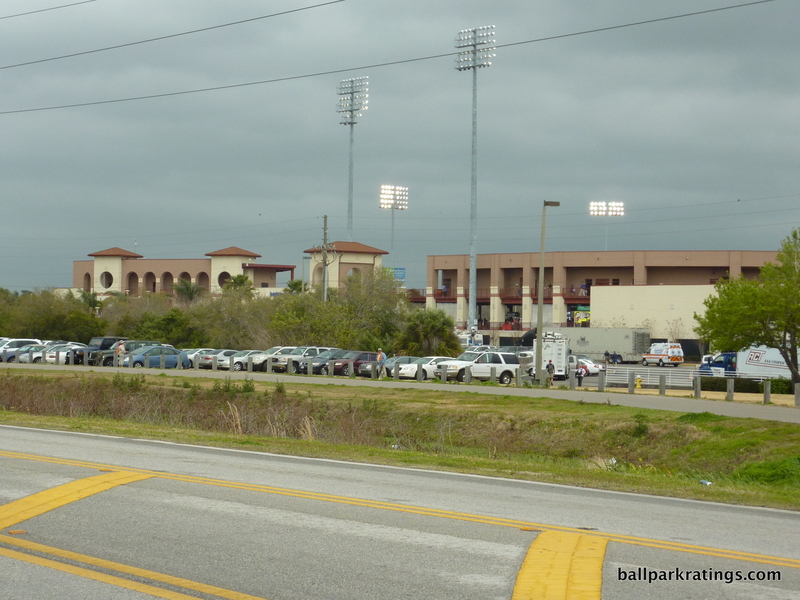 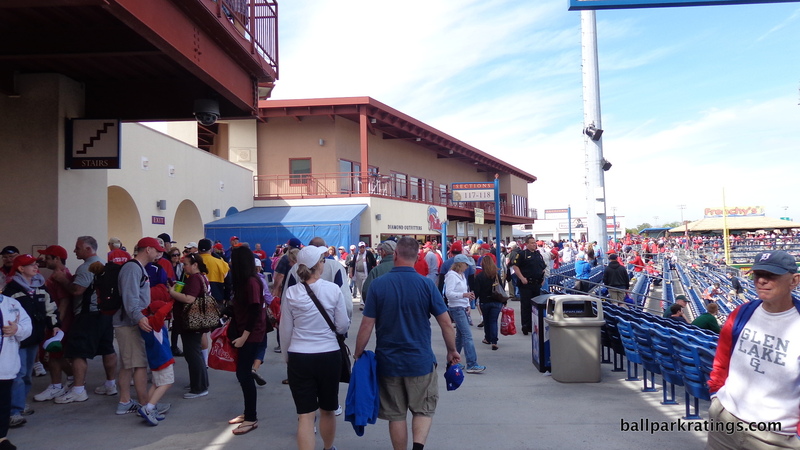 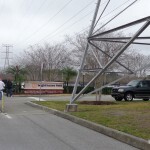 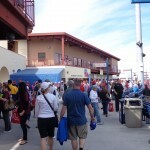 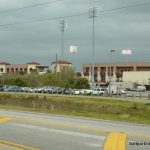 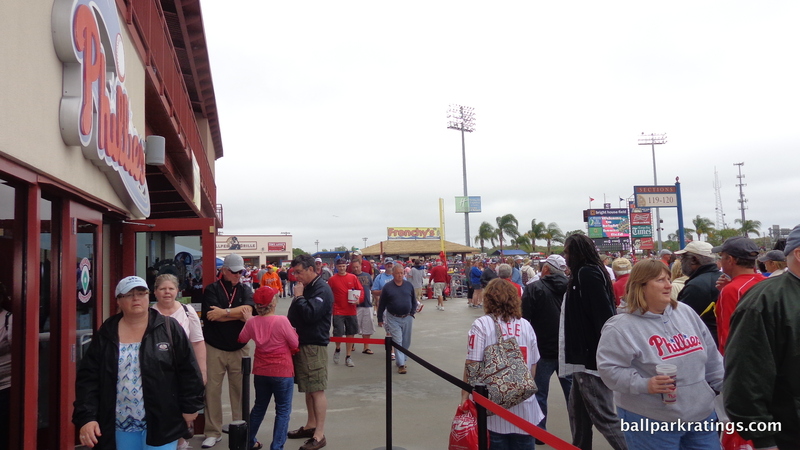 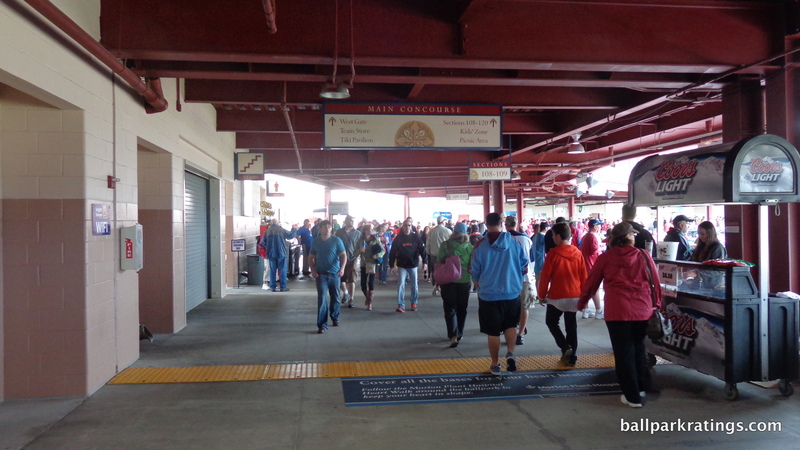 Known for its congestion near U.S. 19, Spectrum Field’s cluttered Clearwater setting is often criticized, but it’s not the worst. 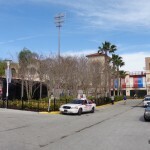 There is plenty of commercial development, most notably a shopping center and Buffalo Wild Wings right next door. 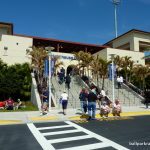 Clearwater gets an extra boost for its pristine beaches, but bad traffic drags the score down a bit. 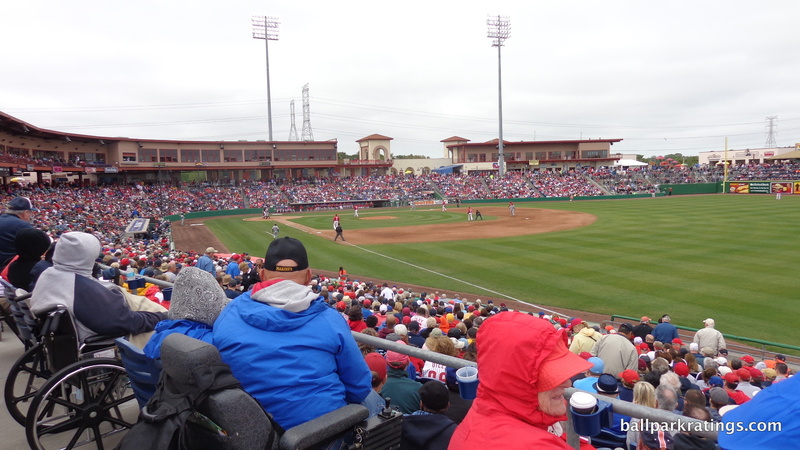 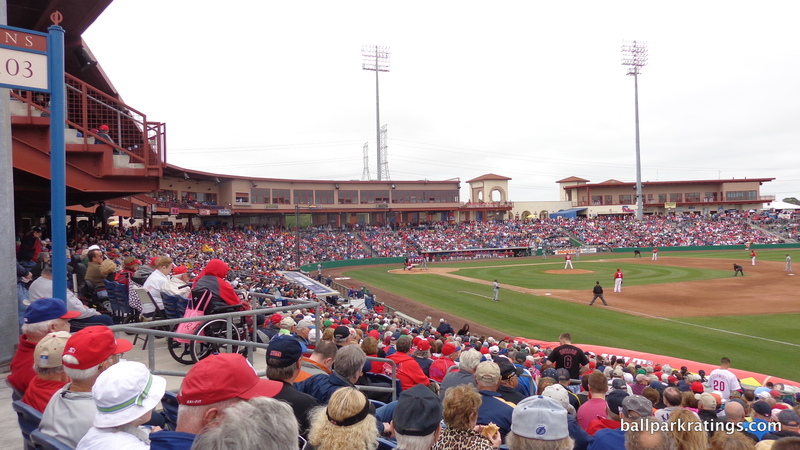 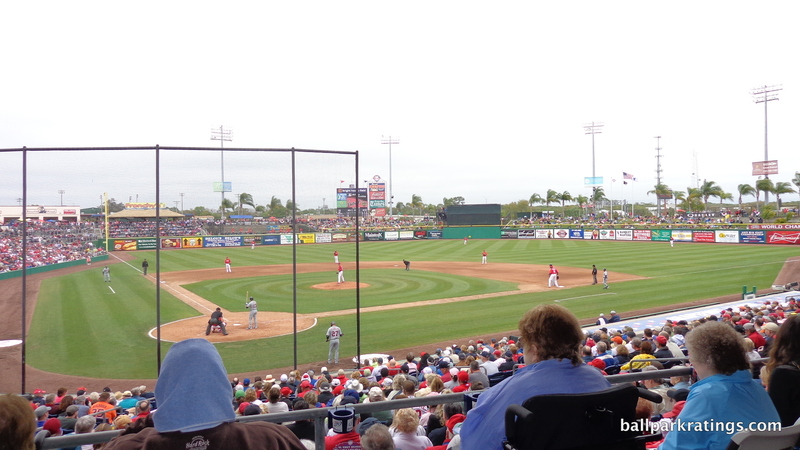 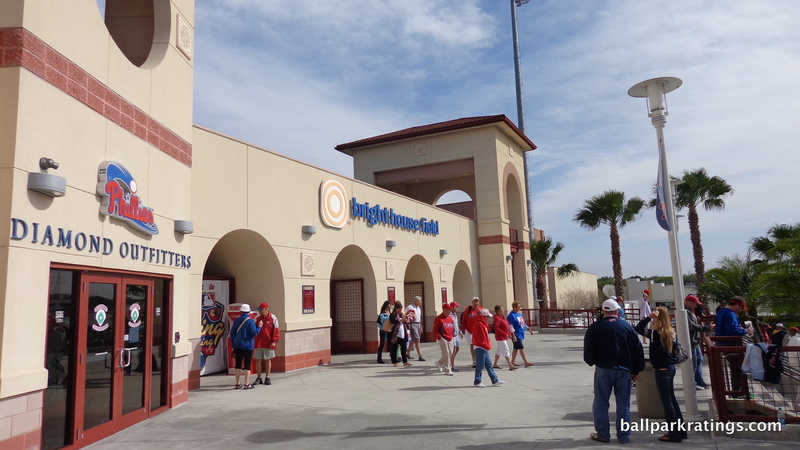 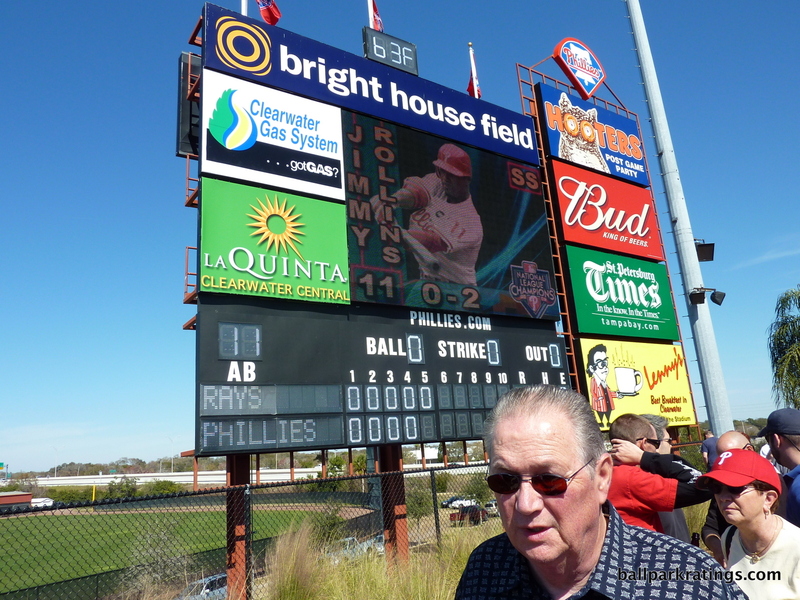 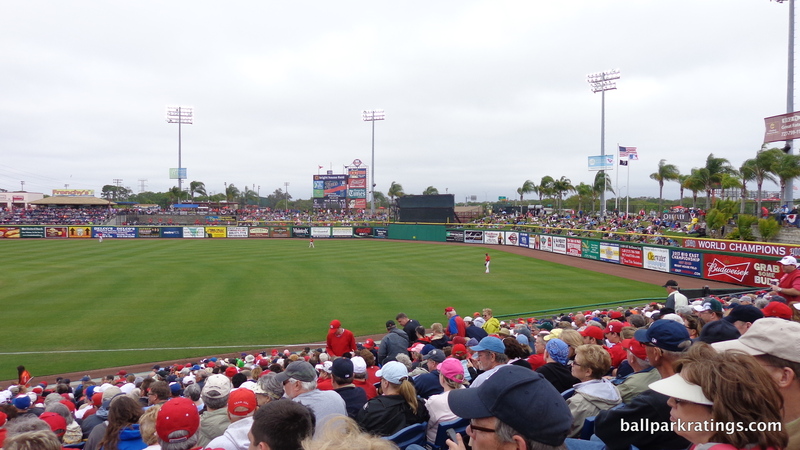 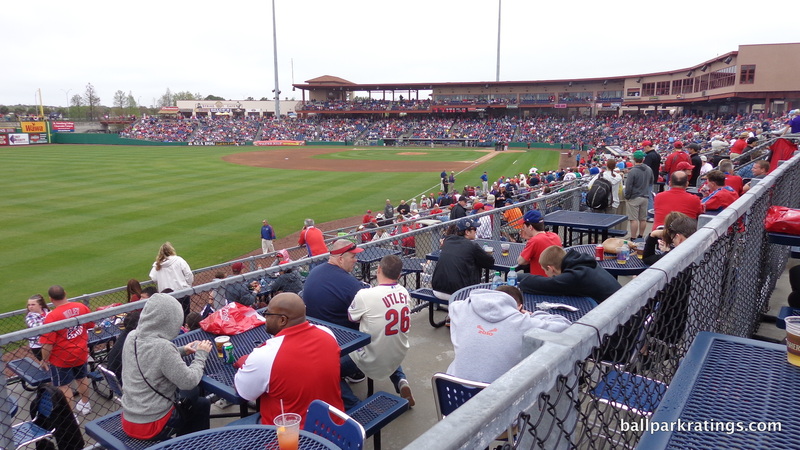 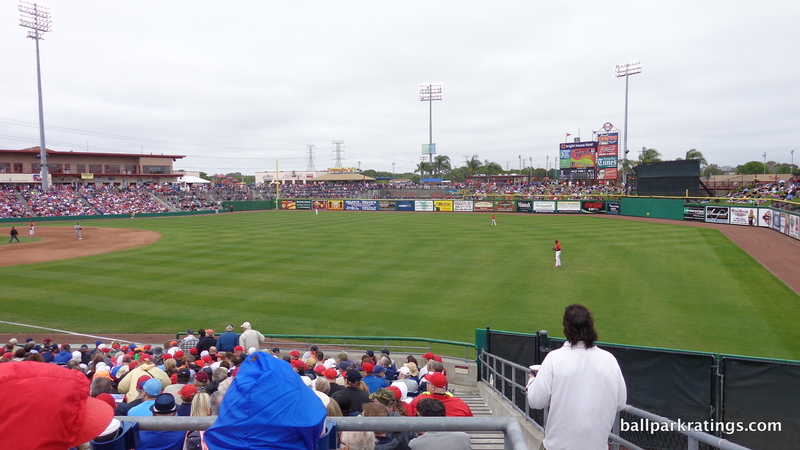 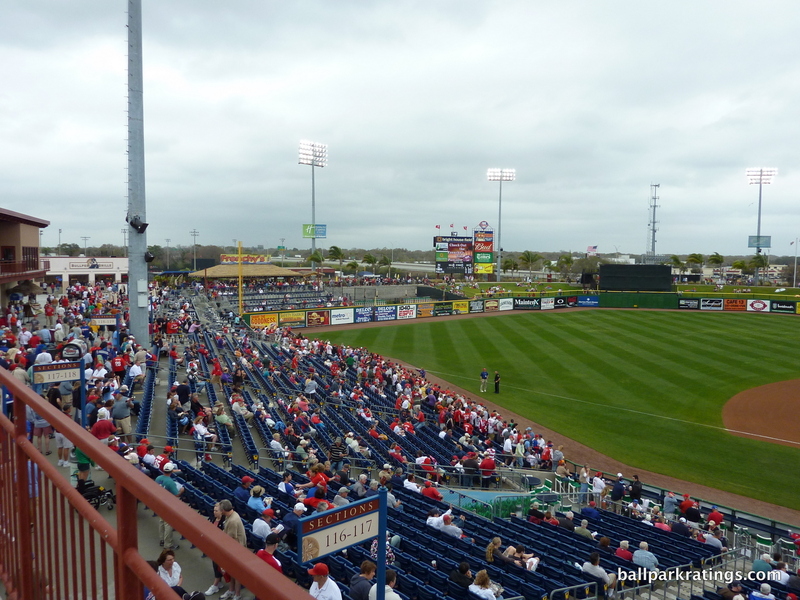 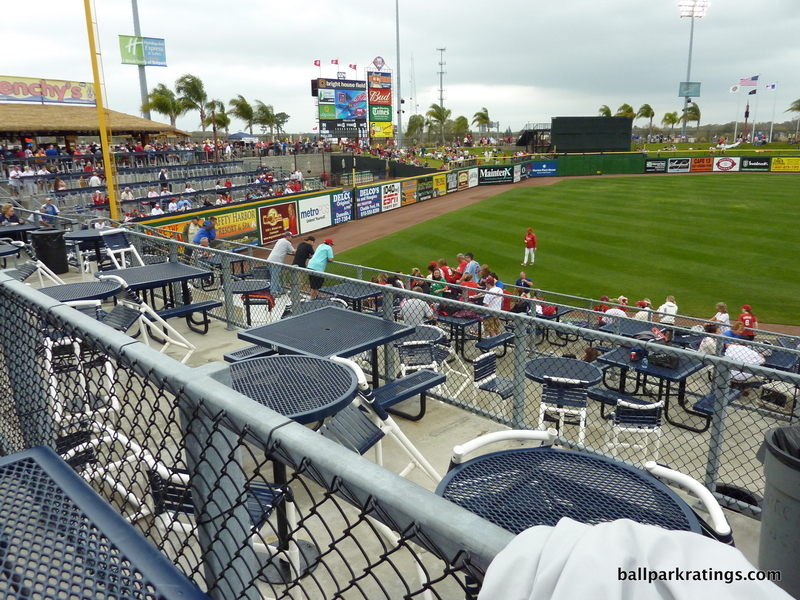 In many respects, Spectrum Field isn’t as spectacular as some of the newer renovation projects across the Grapefruit League, but it presents the most well-rounded ballpark experience. 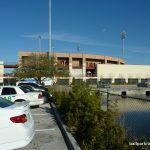 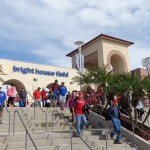 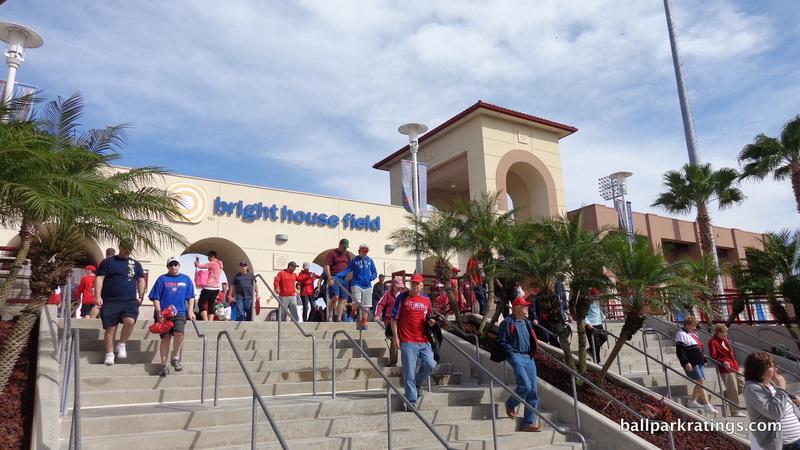 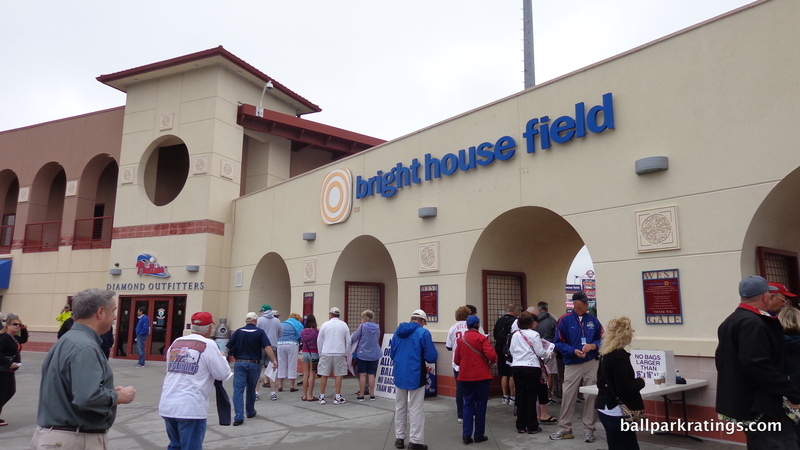 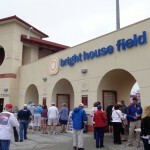 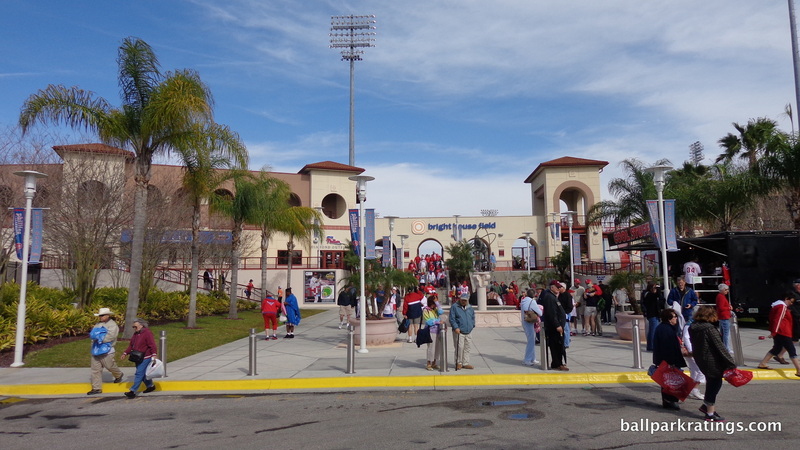 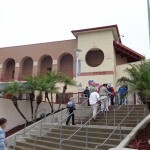 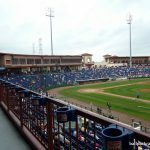 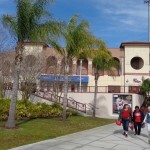 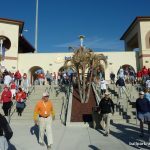 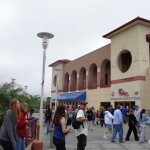 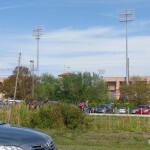 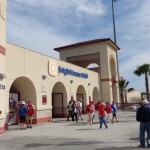 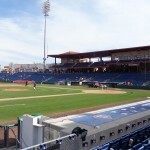 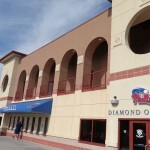 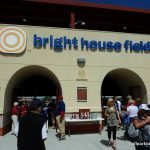 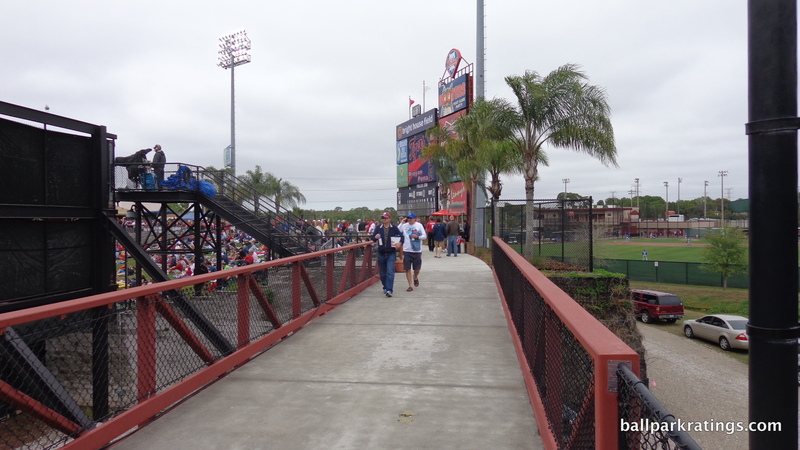 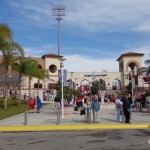 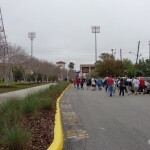 Spectrum Field’s Floridian architecture and aesthetics are attractive, but they are more restrained compared to that of Ed Smith Stadium, Disney, and even the charmingly subdued Joker Marchant Stadium. 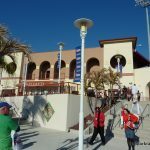 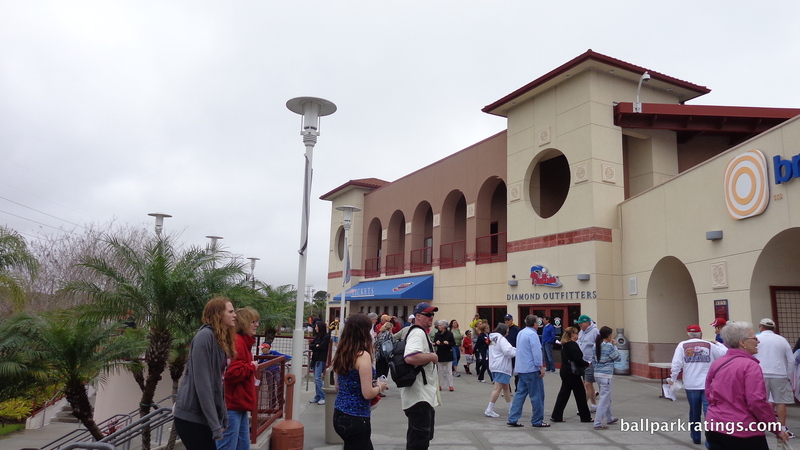 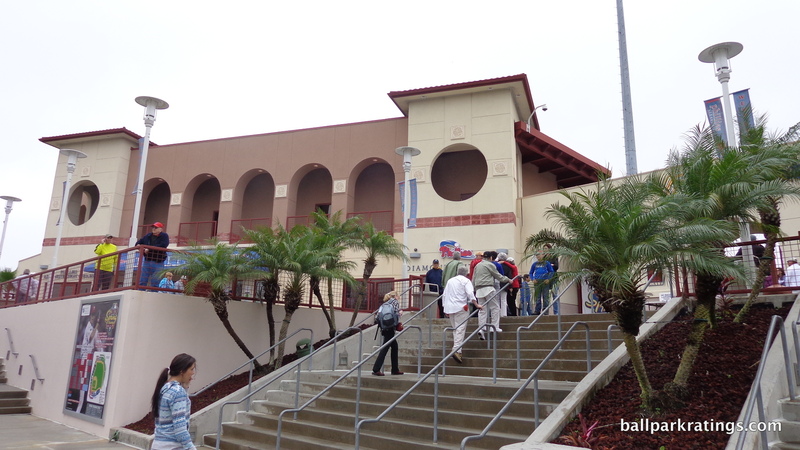 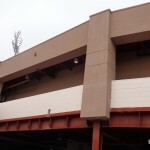 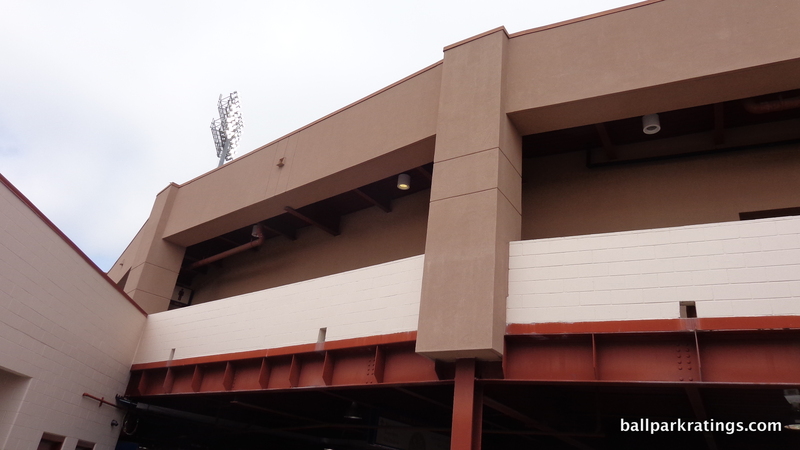 Spectrum Field’s Spanish Mediterranean façade is decked out in shades of cream and light caramel, accentuated by red terra-cotta roofing and models of Spanish fronds. 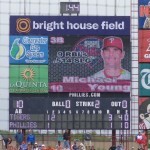 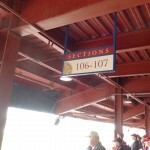 Also note the decorative titles of old Phillies logos. 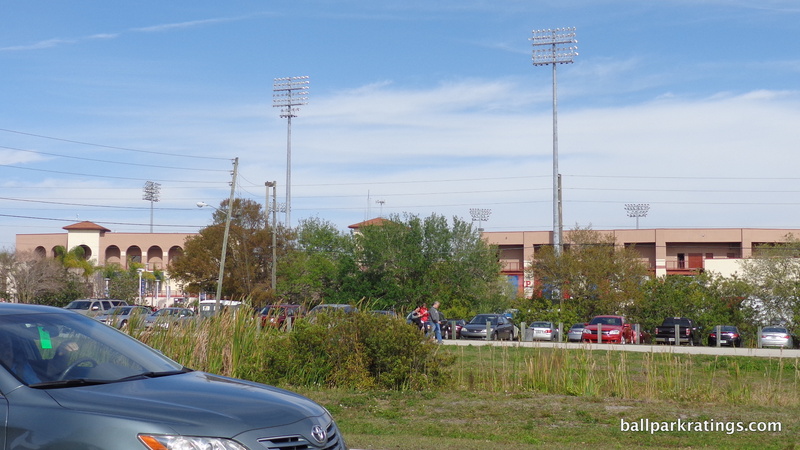 The spires are reflective of the bell towers across Florida. 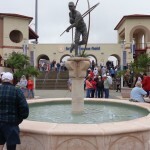 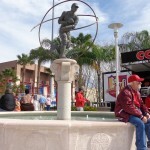 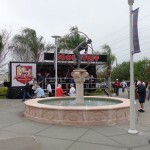 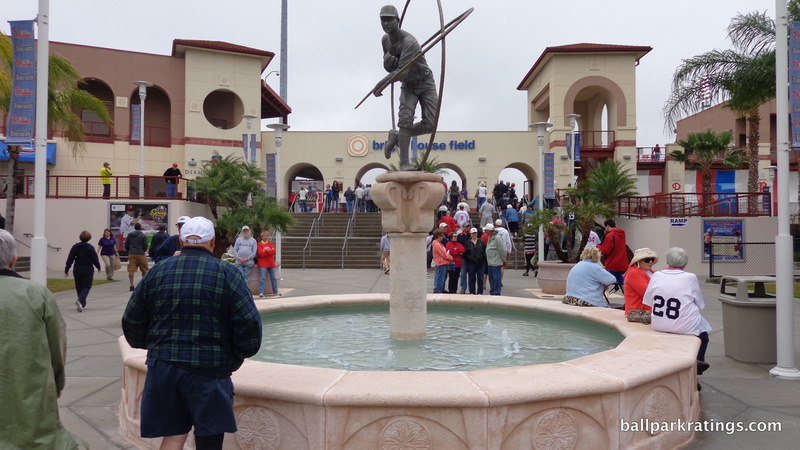 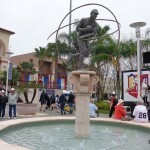 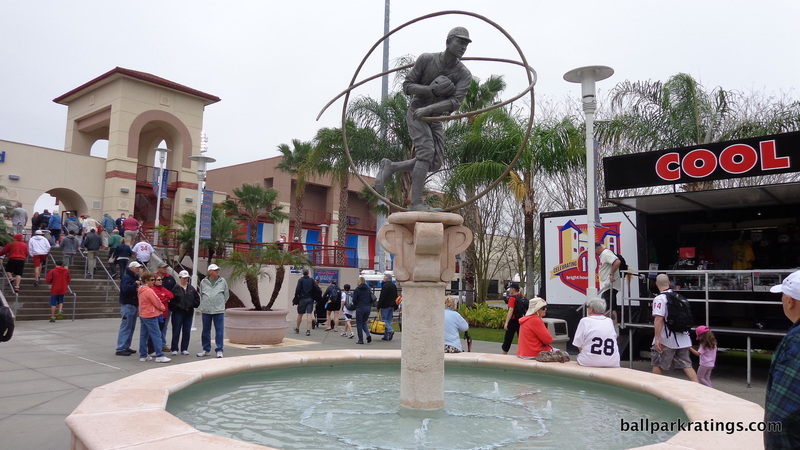 Framed by a Steve Carlton statue (“The Ace”) atop a fountain, the grand entrance behind third base is both memorable and intimate. 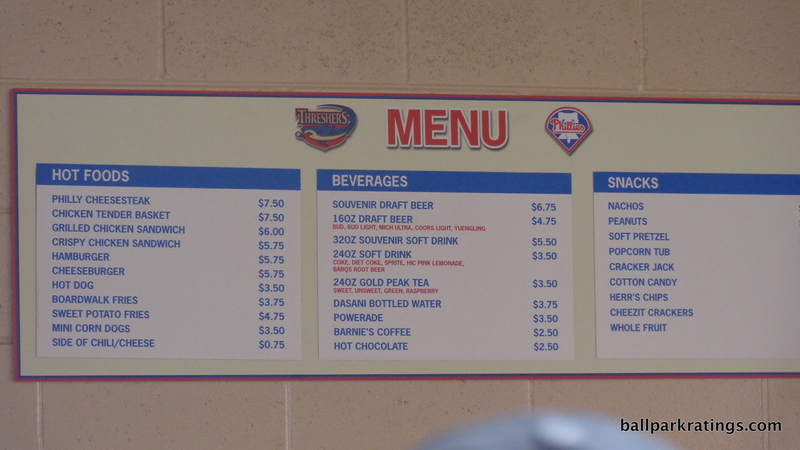 The park’s interior aesthetics are similar: very good but not outstanding. 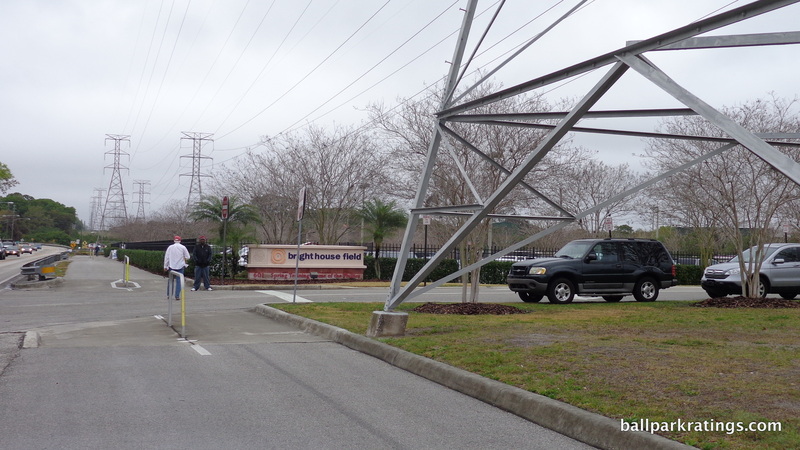 Topped by red wrought iron, light caramel and cream tones are incorporated inside as well. 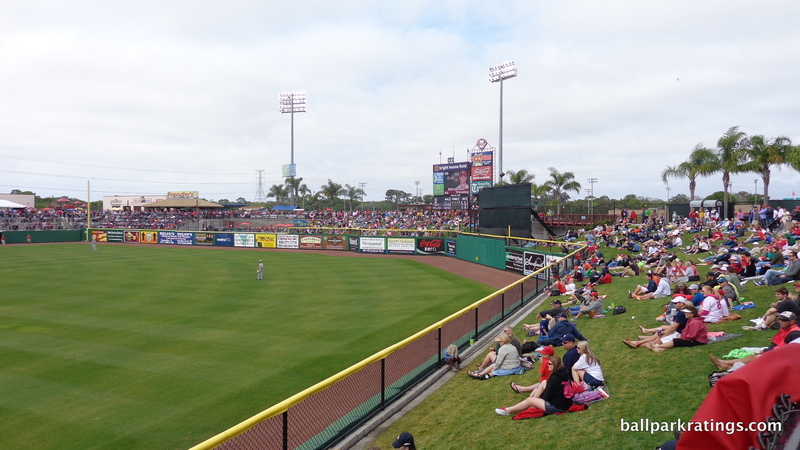 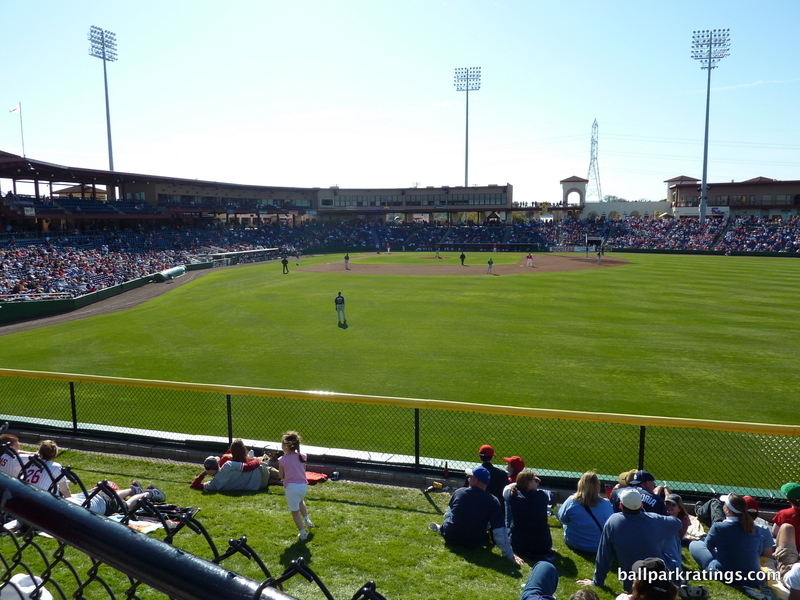 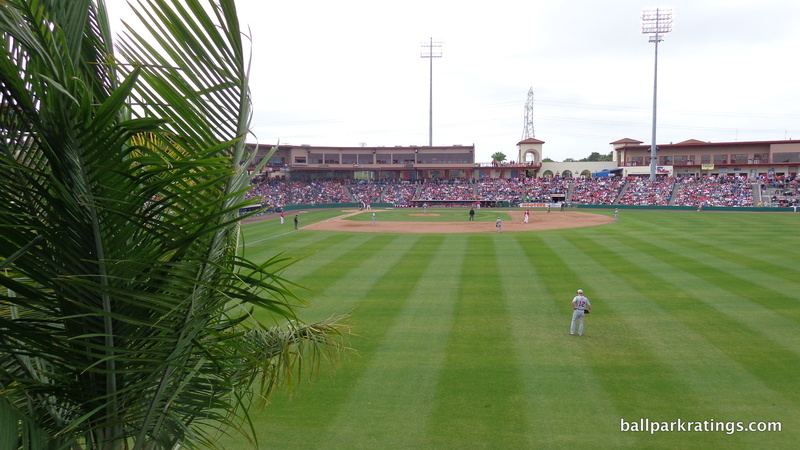 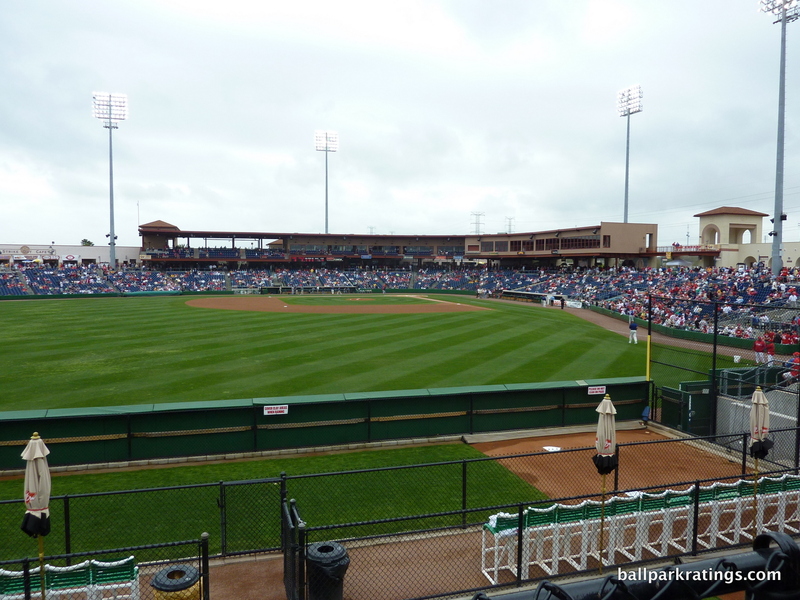 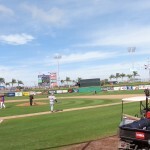 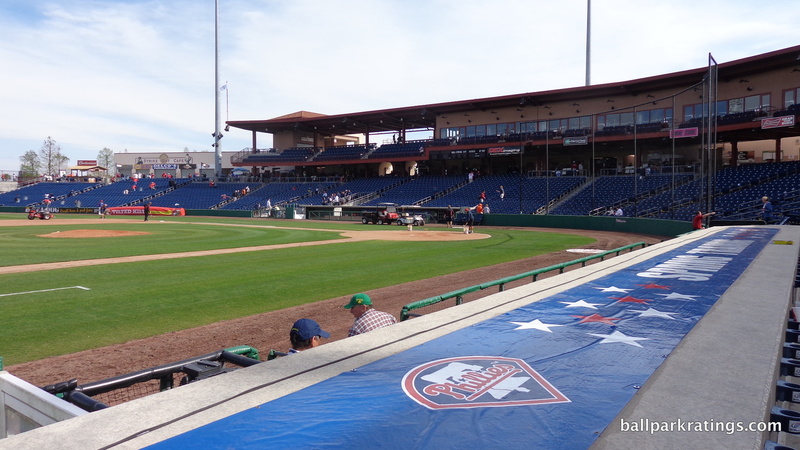 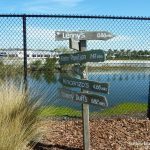 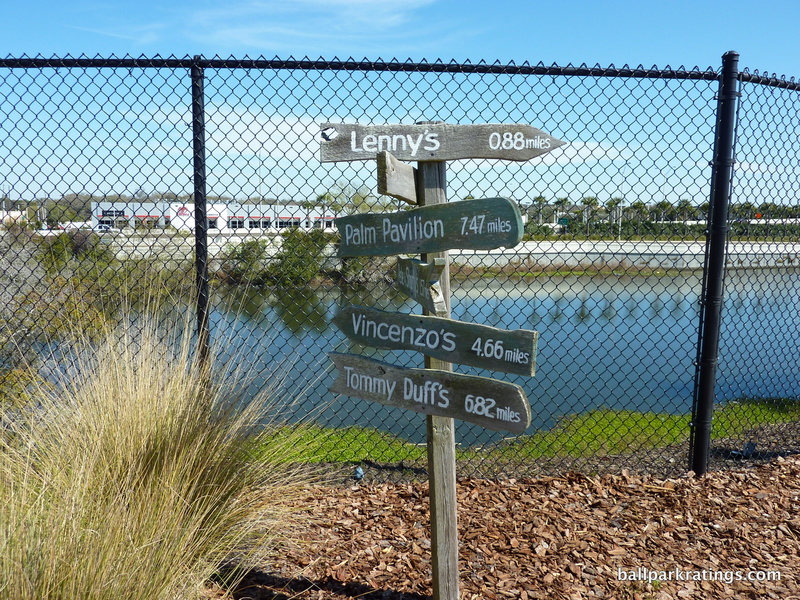 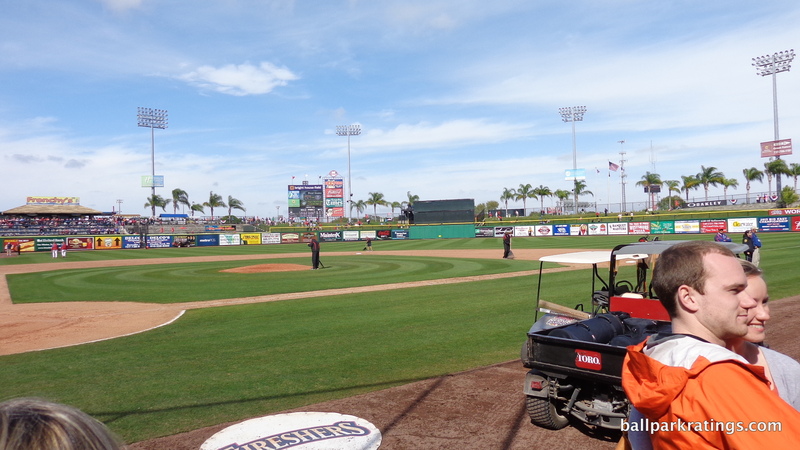 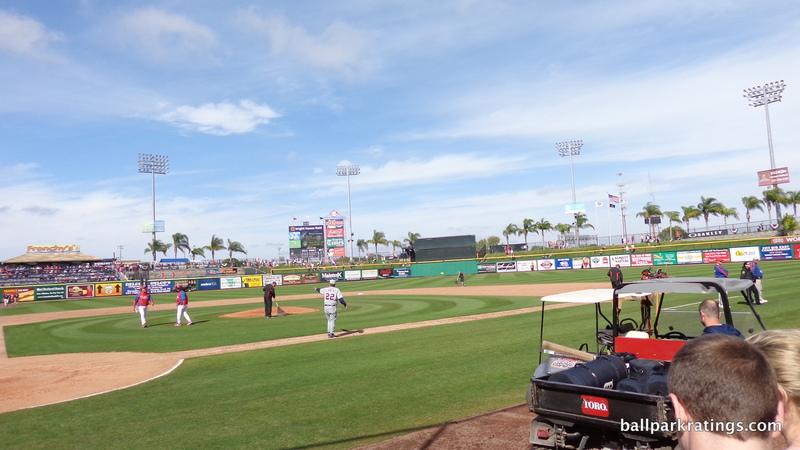 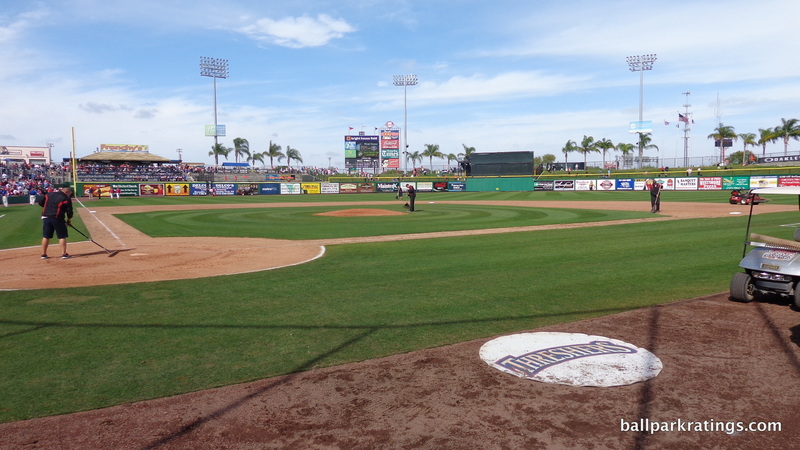 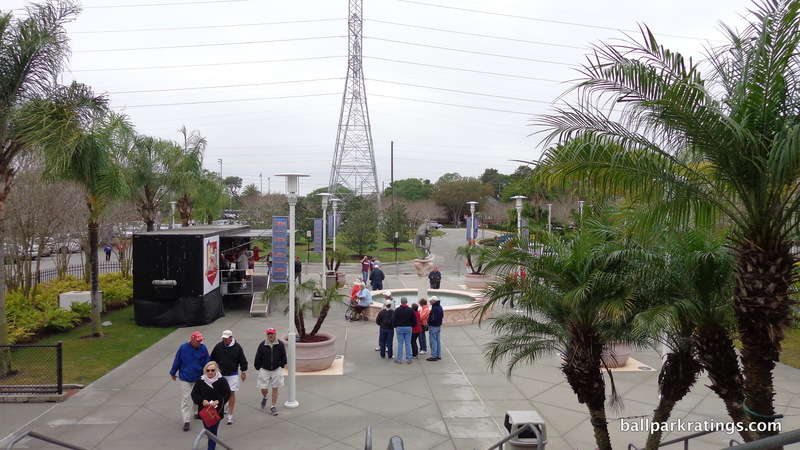 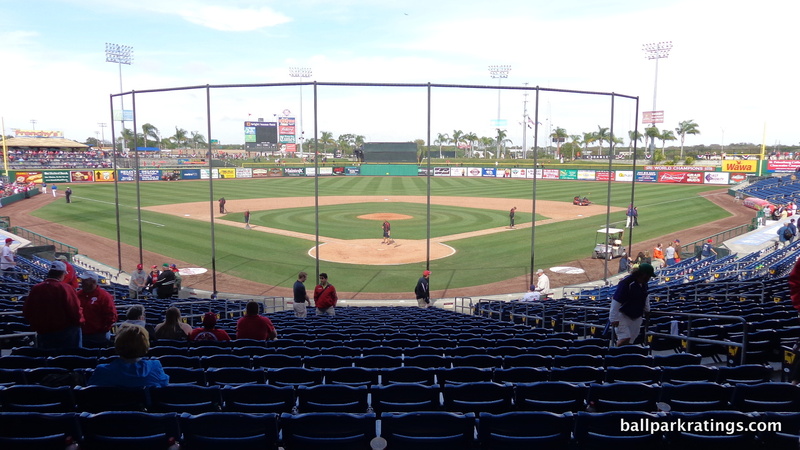 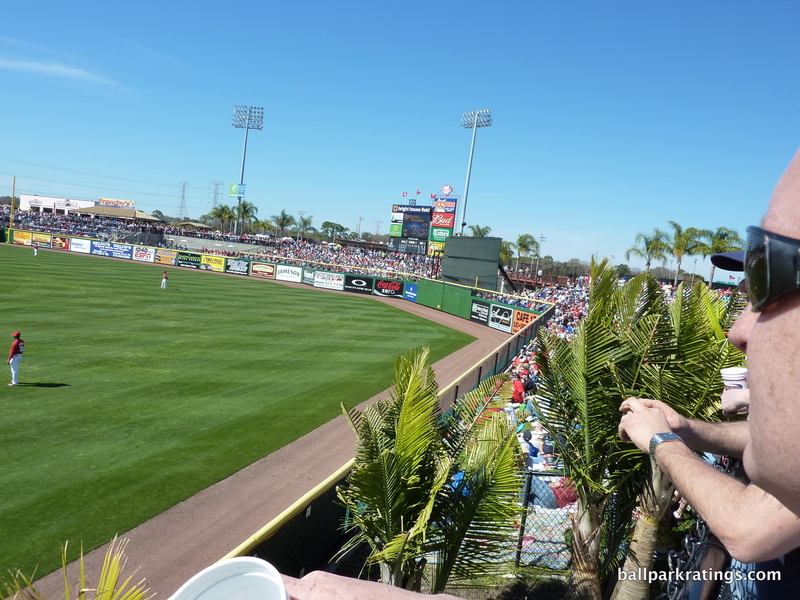 With palm trees lining the outfield and not much of a backdrop beyond them, Spectrum Field has always had the illusion of being on the water, as other parks have some sort of views beyond the outfield scene. 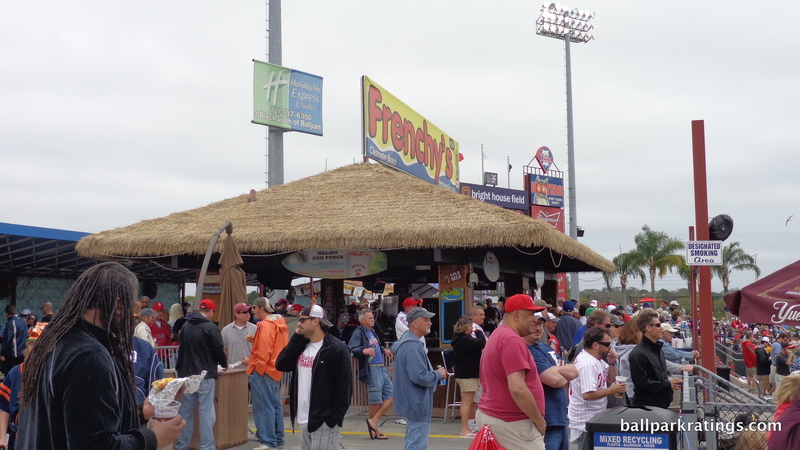 This lovely sensibility is underscored by the aesthetics of Frenchy’s Tiki Pavilion in left field. 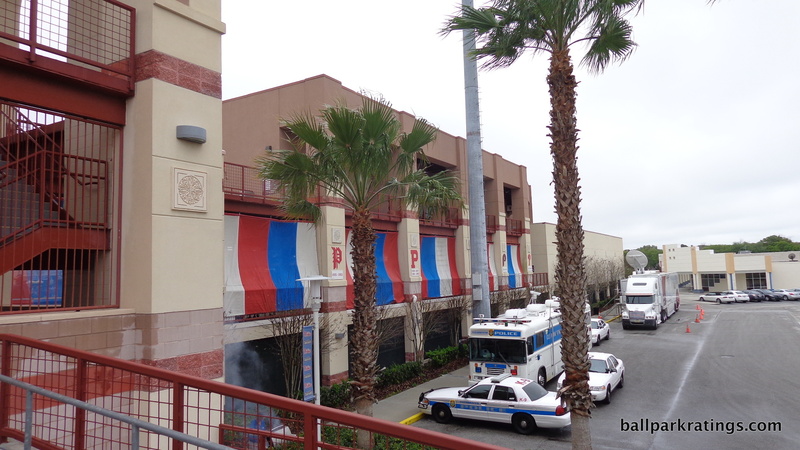 Spectrum Field is the only park other than JetBlue (Red Sox) to simultaneously reflect the architectural vibe of the spring state and the home state/team. 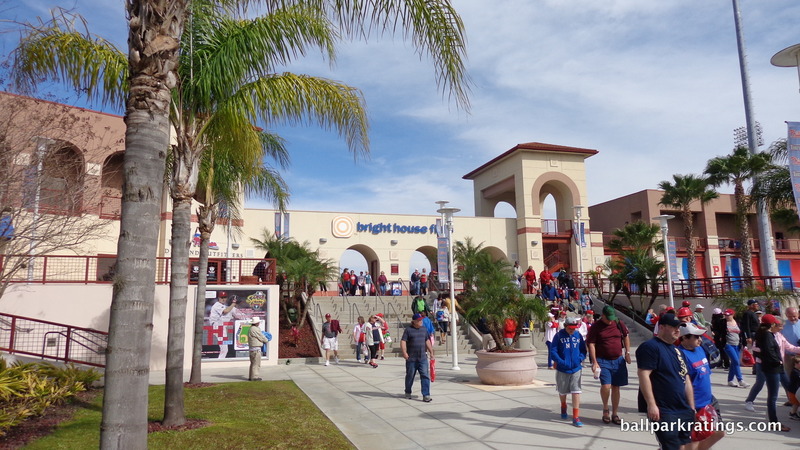 When I say reflect the home state/team, I mean the structure itself reminds fans of home, versus just incorporating beautiful historical references like Ed Smith Stadium. 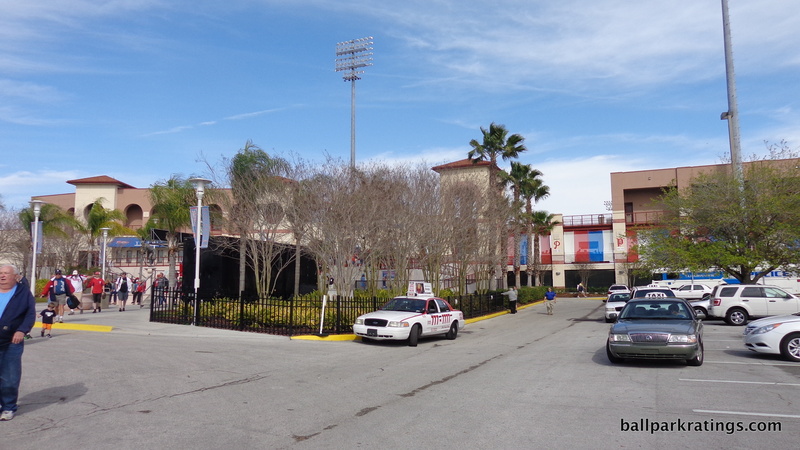 Ed Smith Stadium isn’t a Baltimorean building, but Spectrum Field very much feels like one that would fit in Philadelphia. 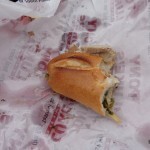 (This is a very subjective observation subject to debate. 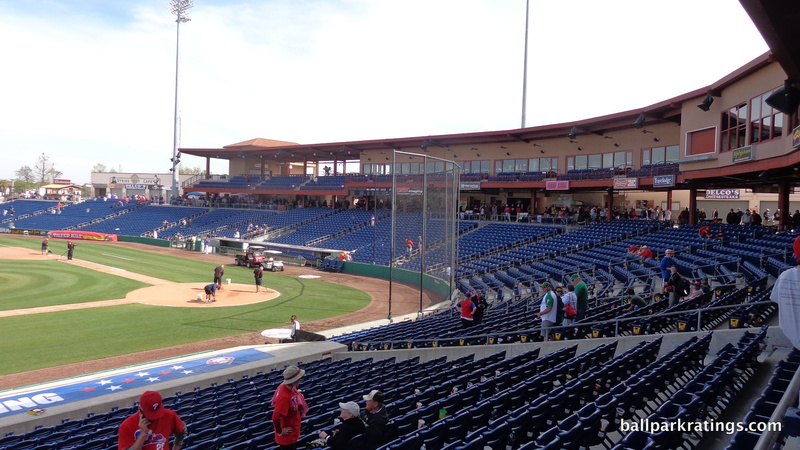 Perhaps Ed Smith Stadium would fit in Baltimore too). 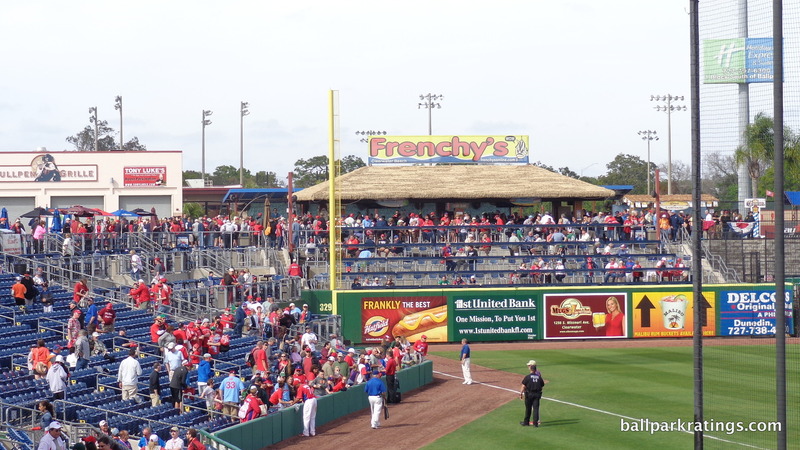 But when I take in a game at Spectrum Field, I somehow feel like I’m both in Philadelphia and Florida, and that’s a neat trick. 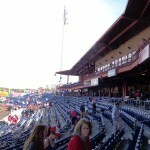 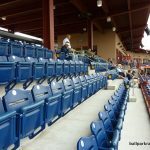 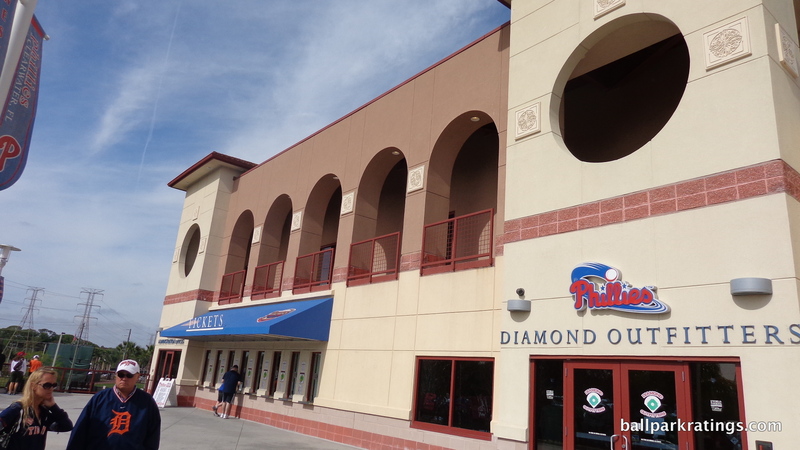 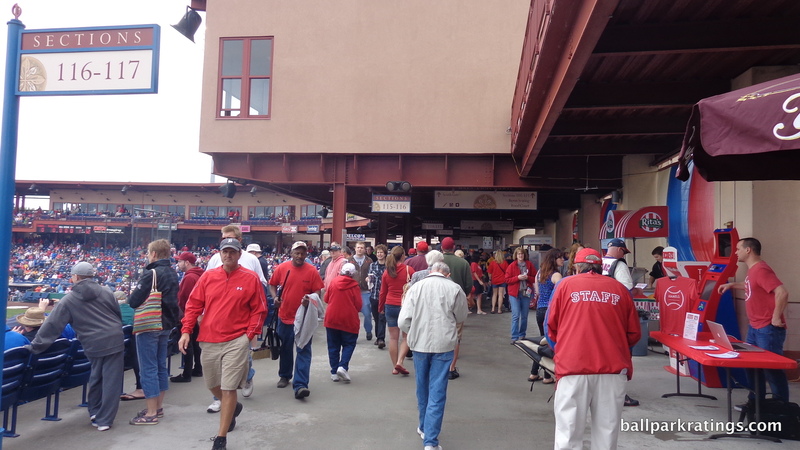 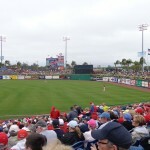 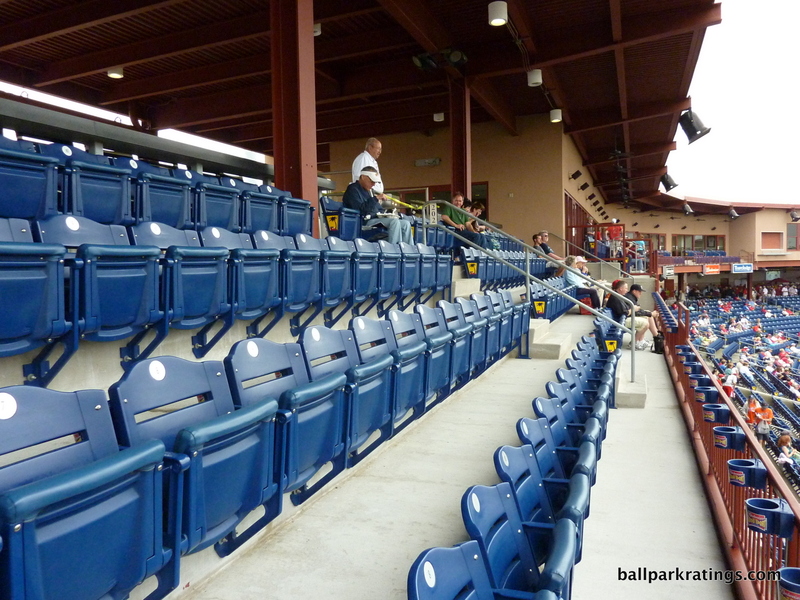 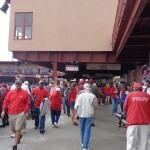 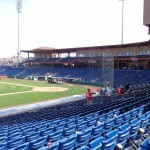 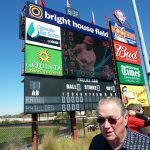 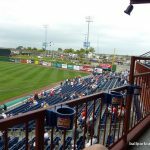 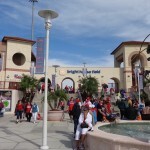 Achieved through a wonderful color scheme, Spectrum Field is a favorable amalgamation of Floridian architecture and Philadelphia Phillies’ shades of reds and blues. 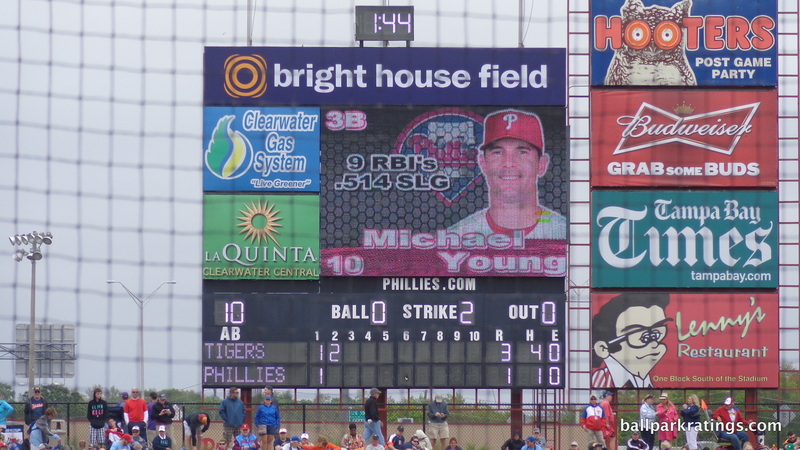 I would like a few more team historical references, but the design is Florida meets Philadelphia in the best articulated way. 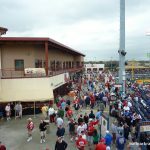 Spectrum Field is still a functionally great ballpark. 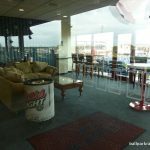 While situated above street level, the open, 360-degree concourse is very navigable and features great vantage points from nearly all areas. 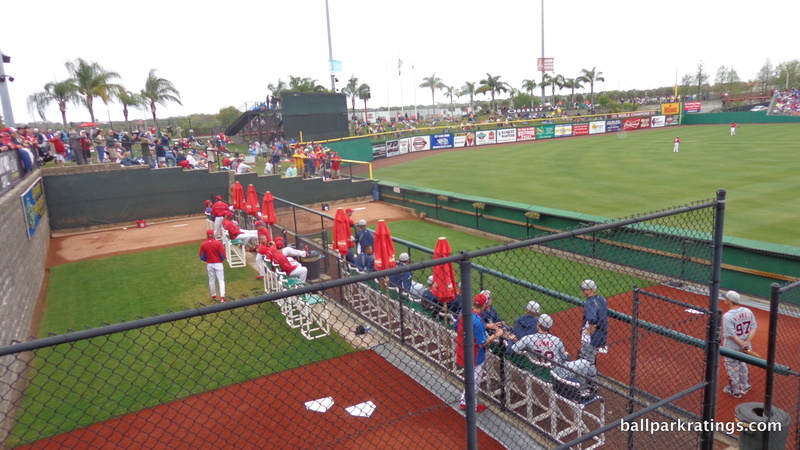 The double decked bullpens providing intimate fan-player interactions in left-center field are a nice touch. 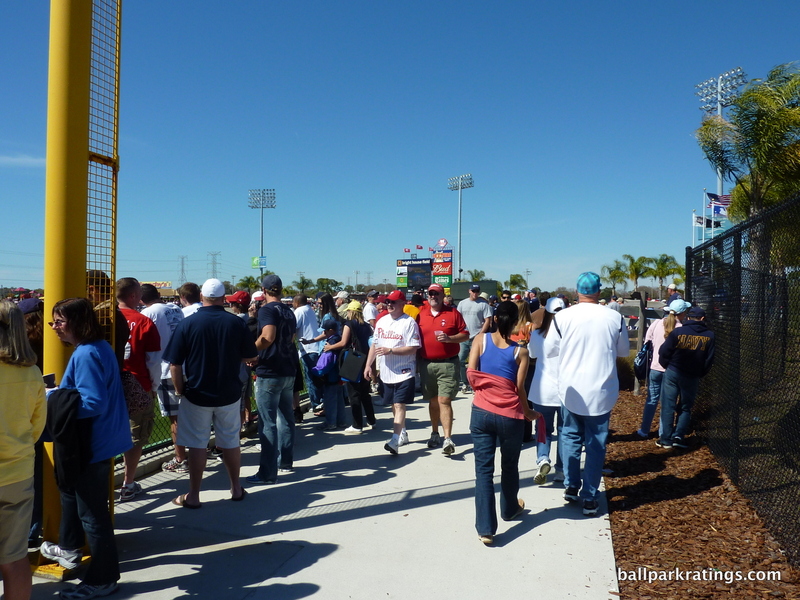 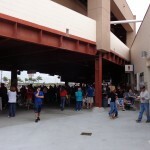 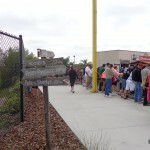 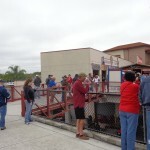 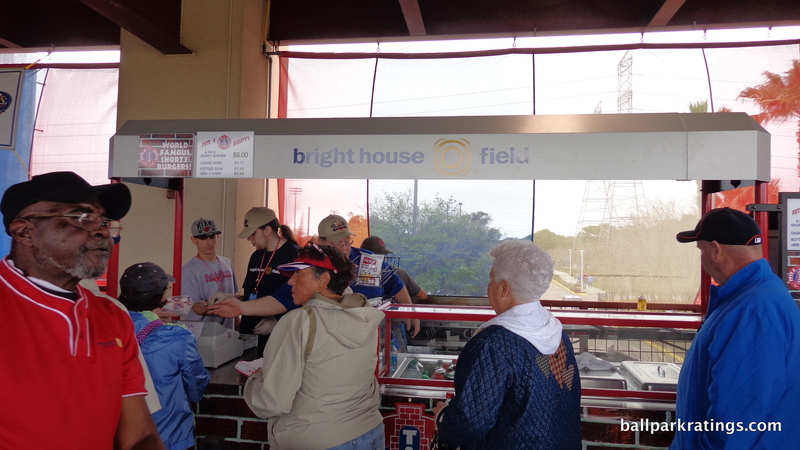 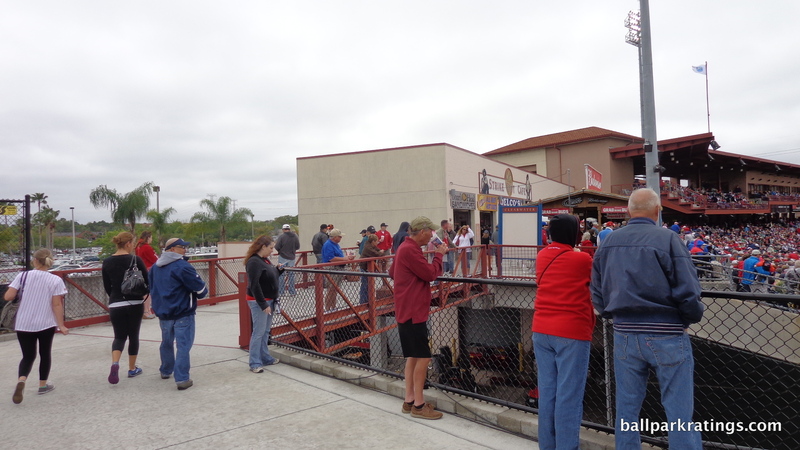 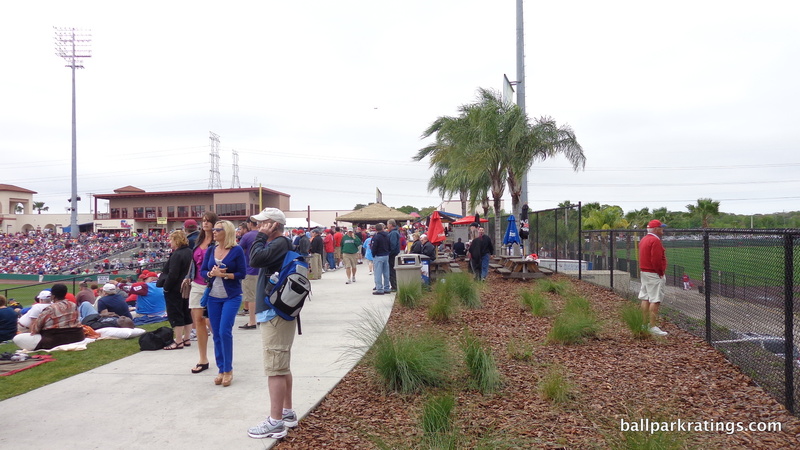 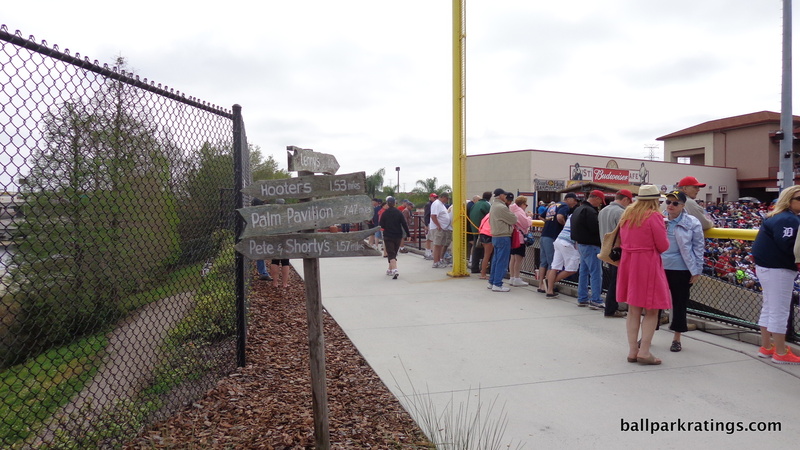 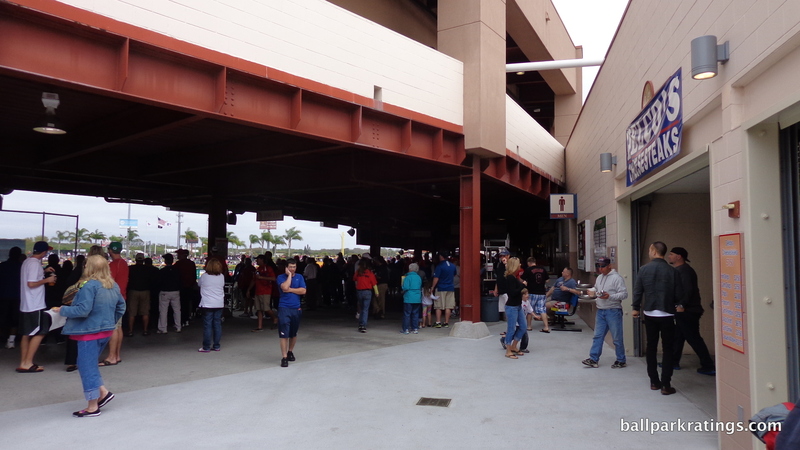 The concourse can be a bit narrow in some places, but it’s only one of two wraparound systems providing field views in the Grapefruit League. 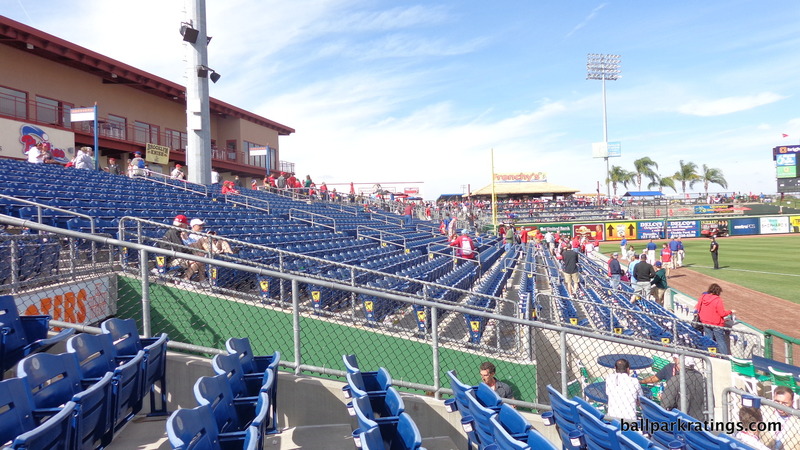 The sightlines are excellent. 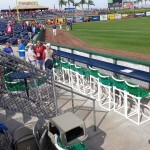 The grandstand has an intimate pitch and seats down the lines are properly oriented toward the infield. 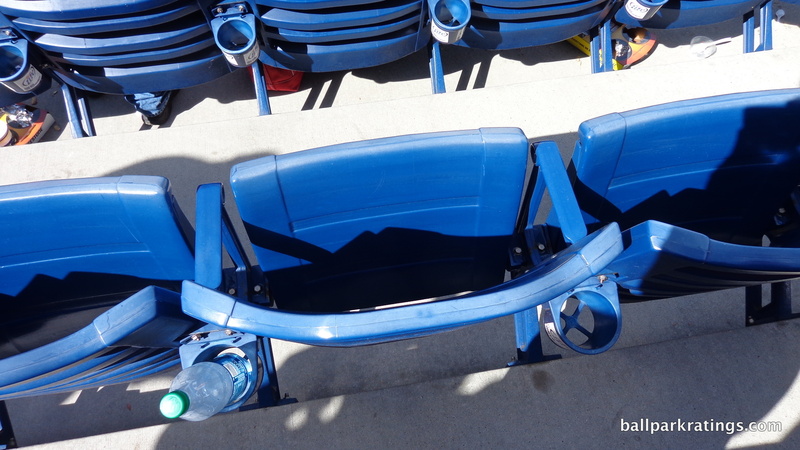 Not only do all blue seats fold-down and possess cupholders, but they have more legroom than average. 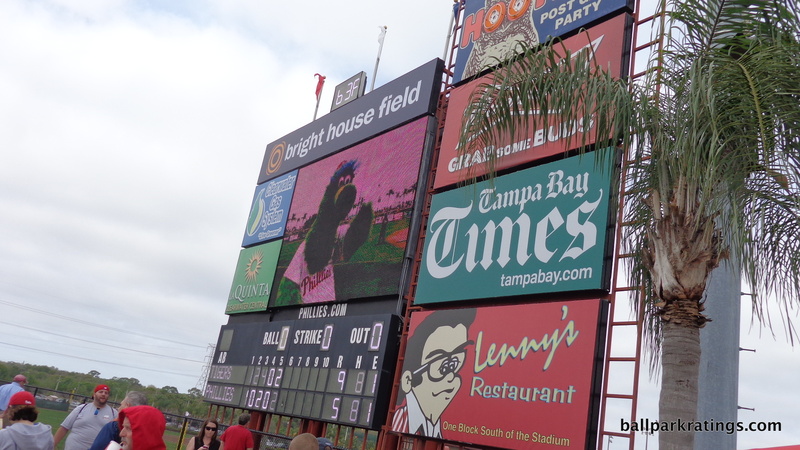 Finally, a new videoboard was added in 2015. 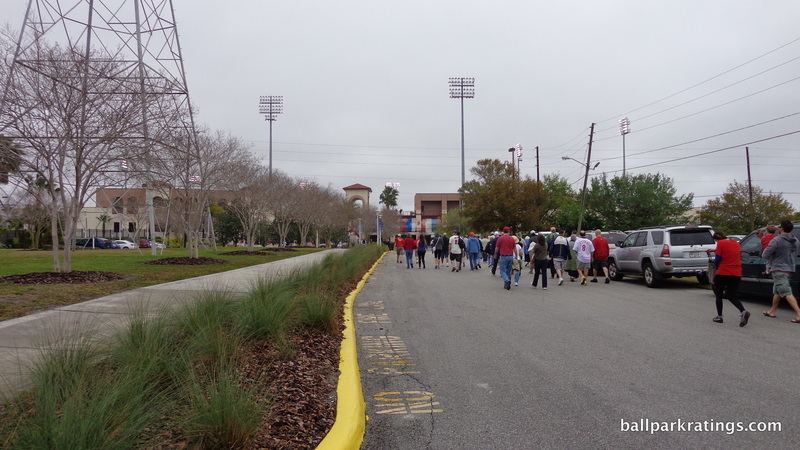 Spectrum Field possesses consistently excellent amenities, even if some spaces are a bit tired. 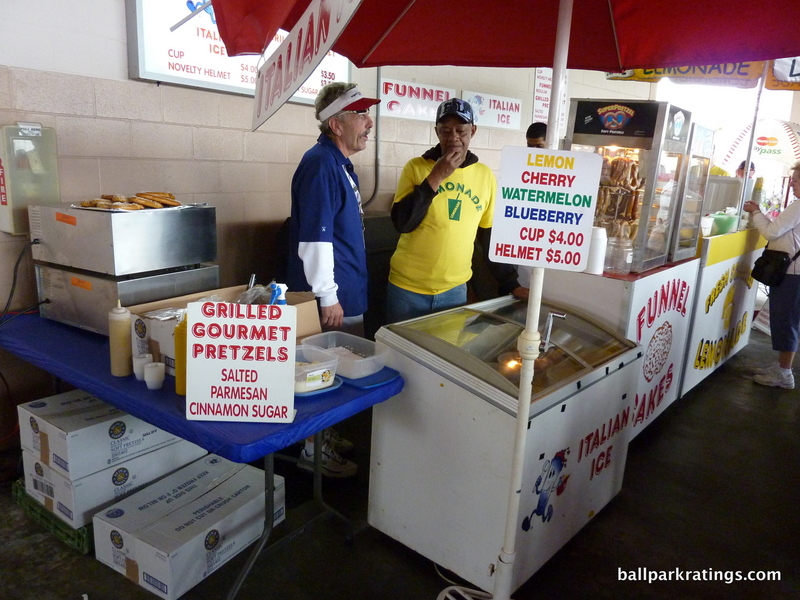 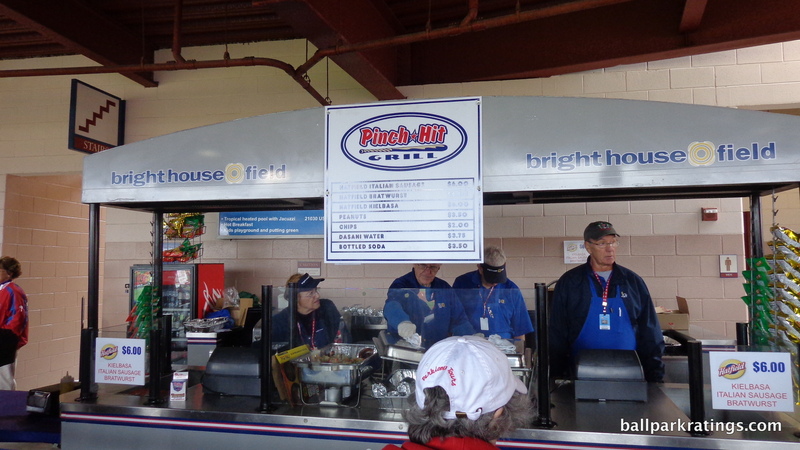 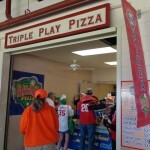 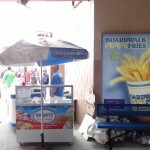 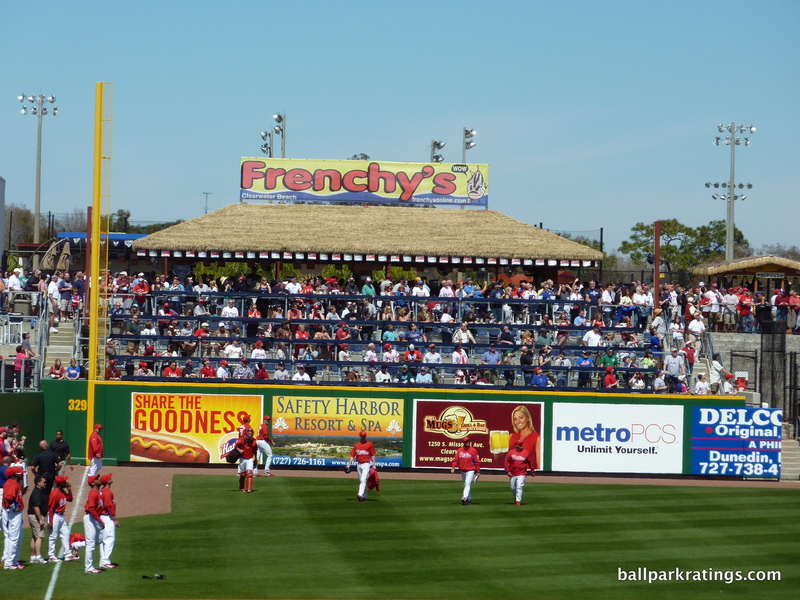 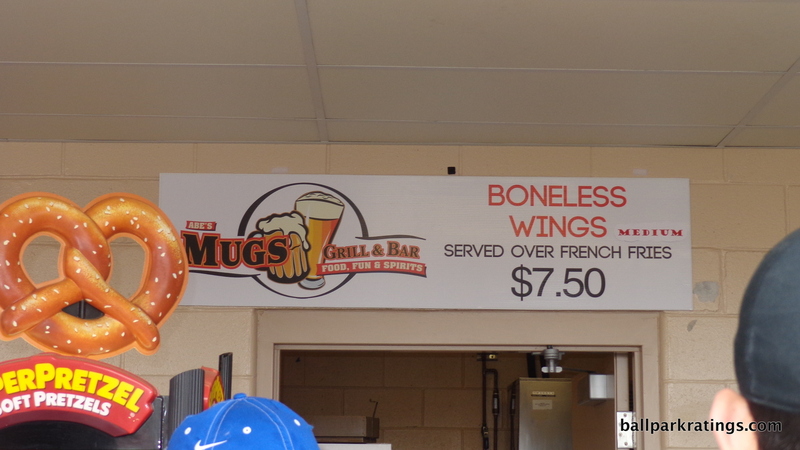 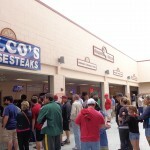 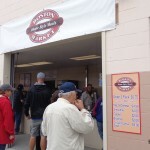 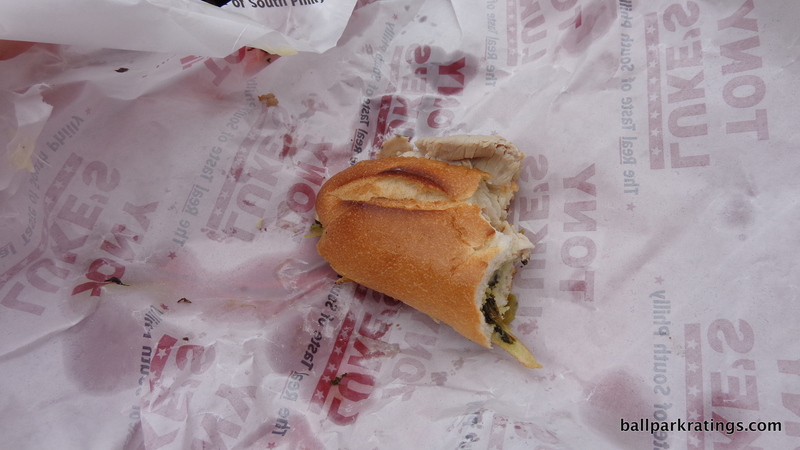 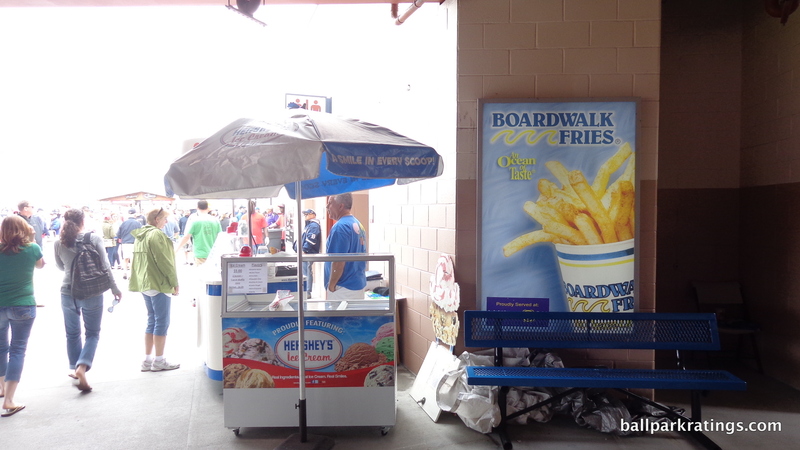 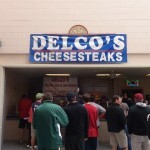 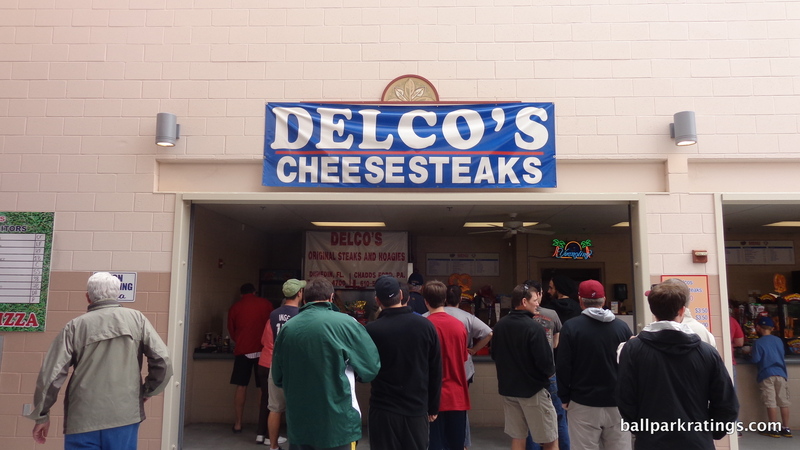 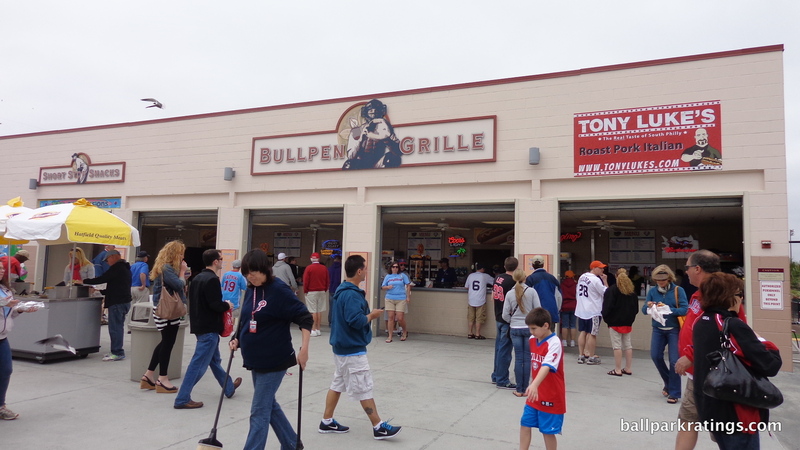 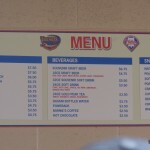 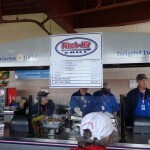 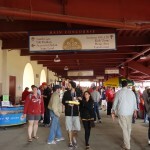 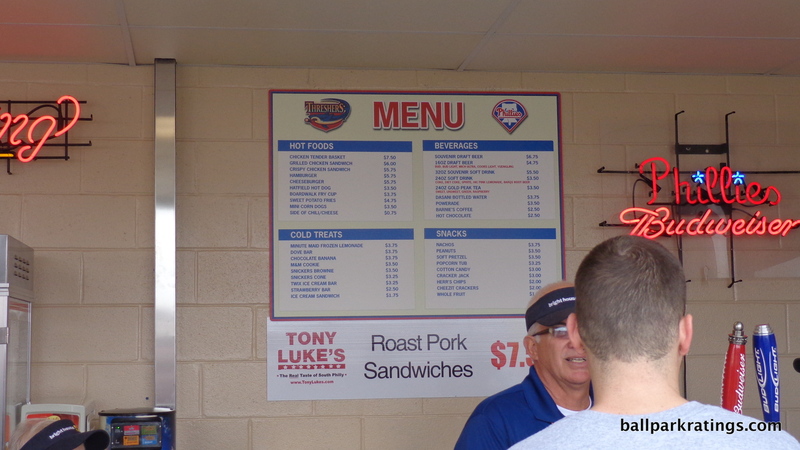 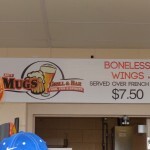 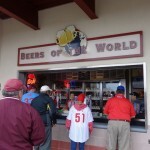 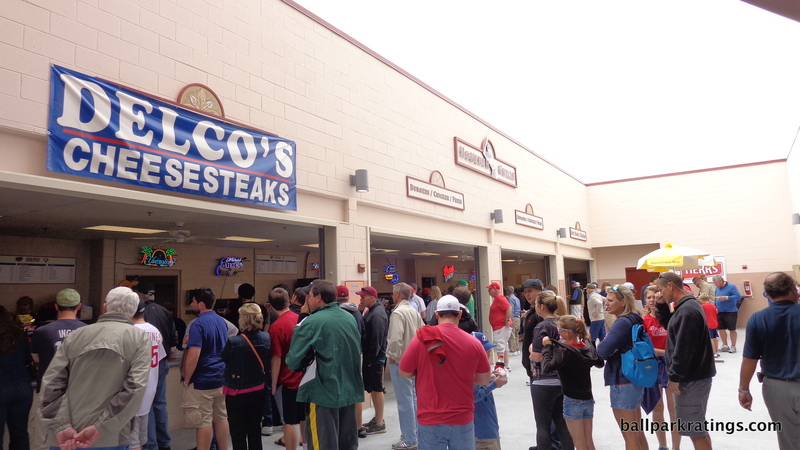 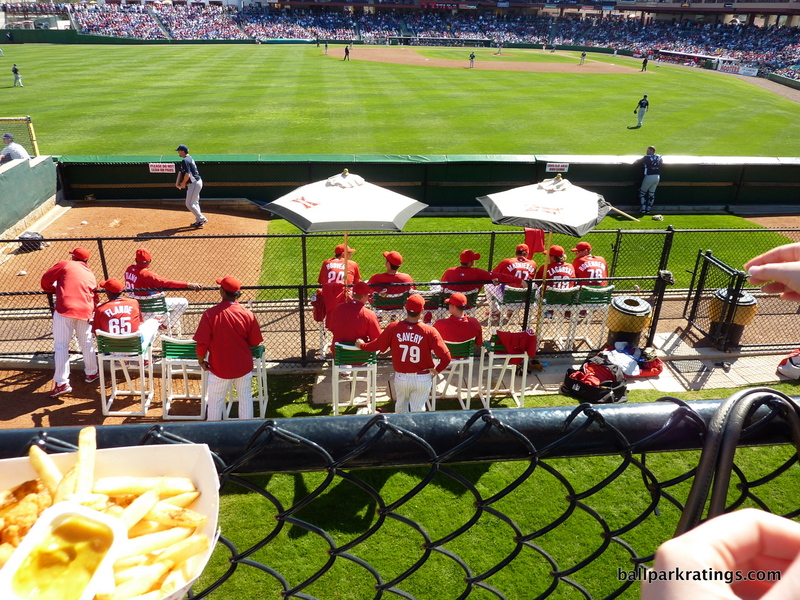 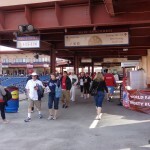 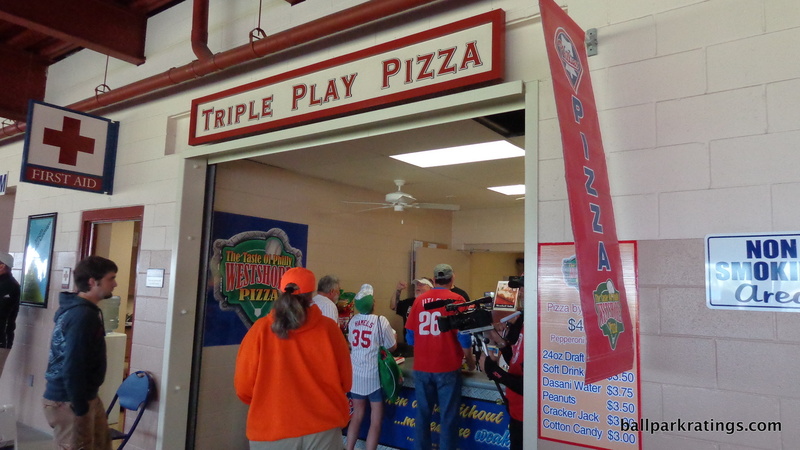 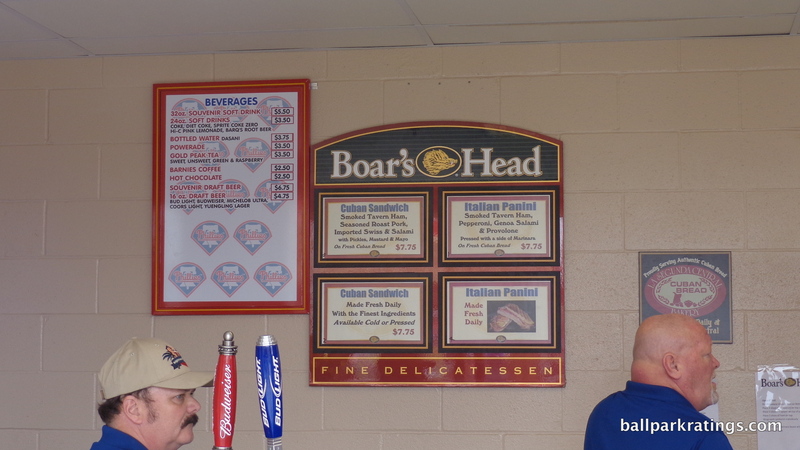 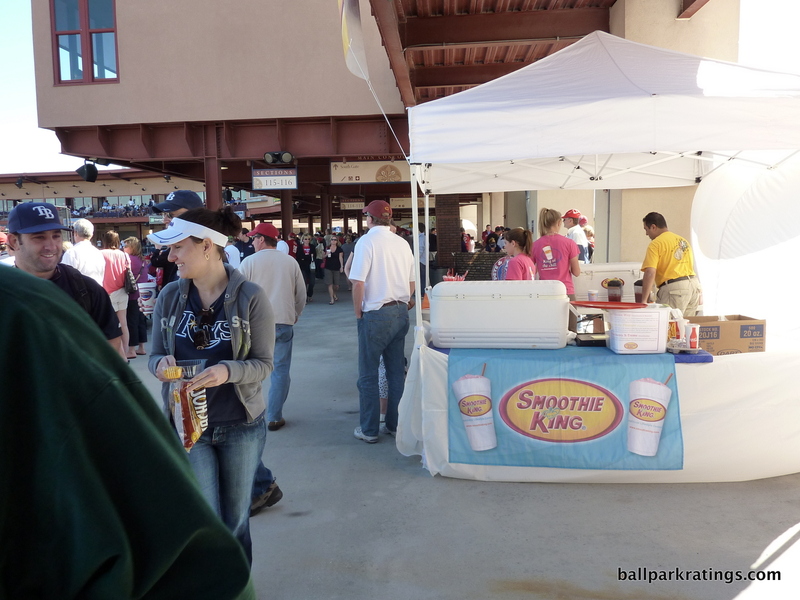 Starting in the early 2010s, the Phillies have done a superb job of serving high quality food from local restaurants. 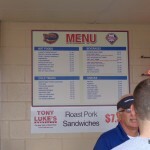 Very little of the grub is from generic food service corporations. 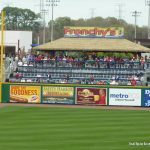 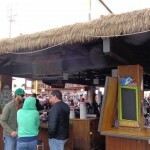 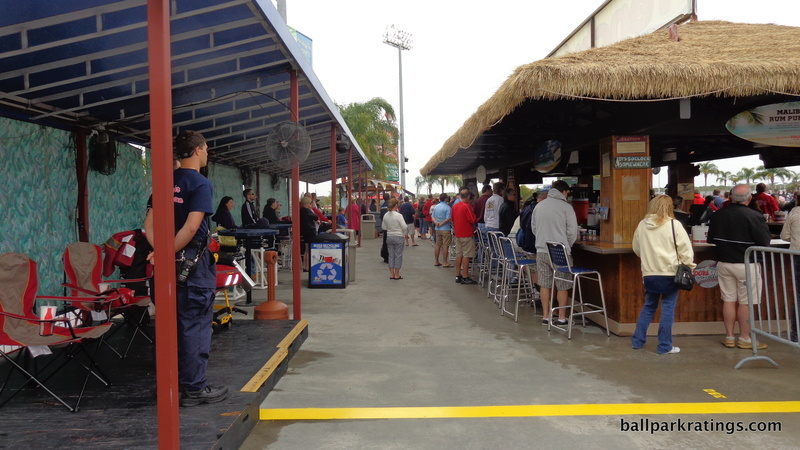 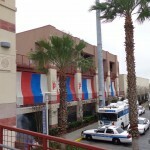 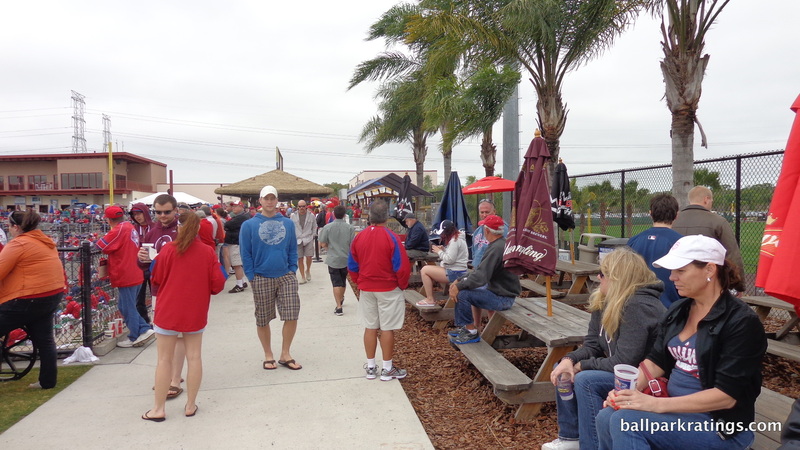 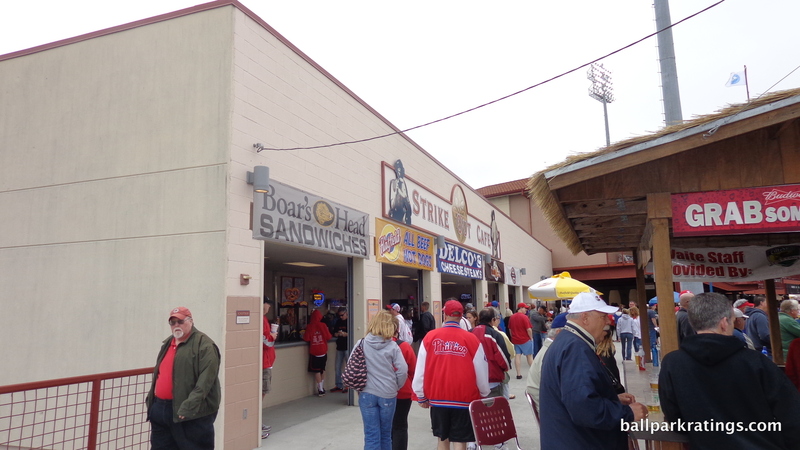 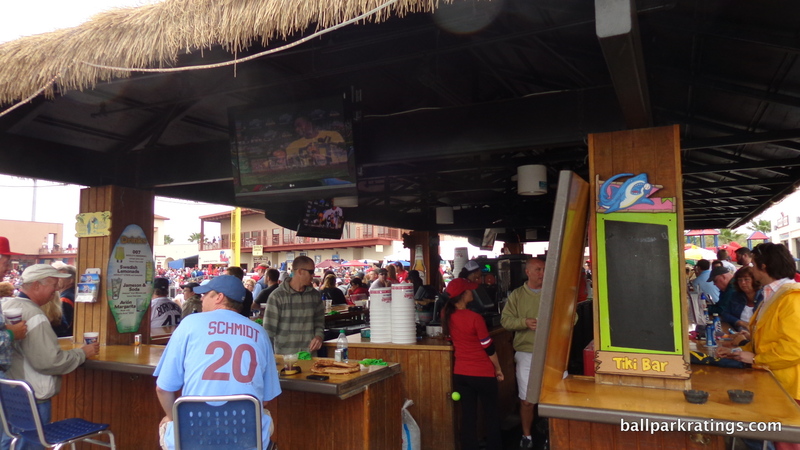 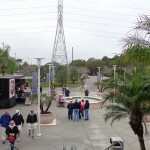 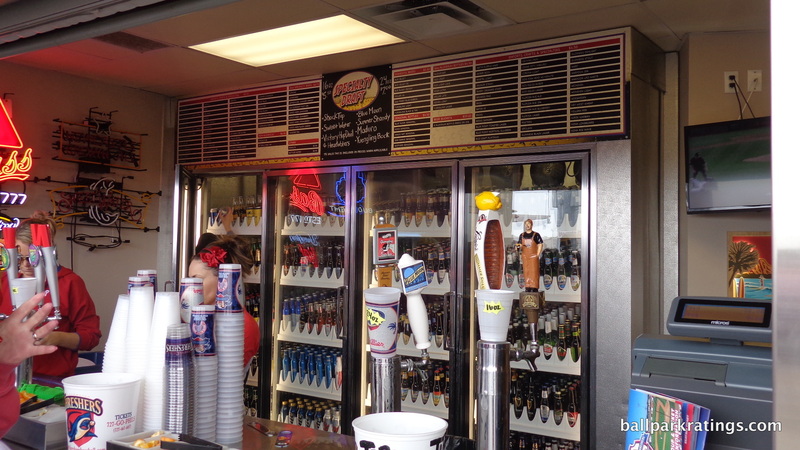 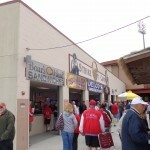 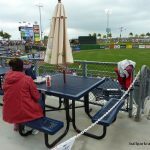 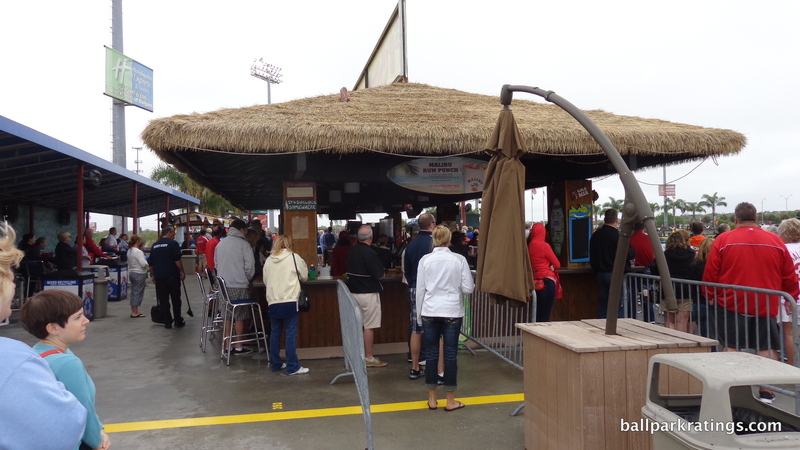 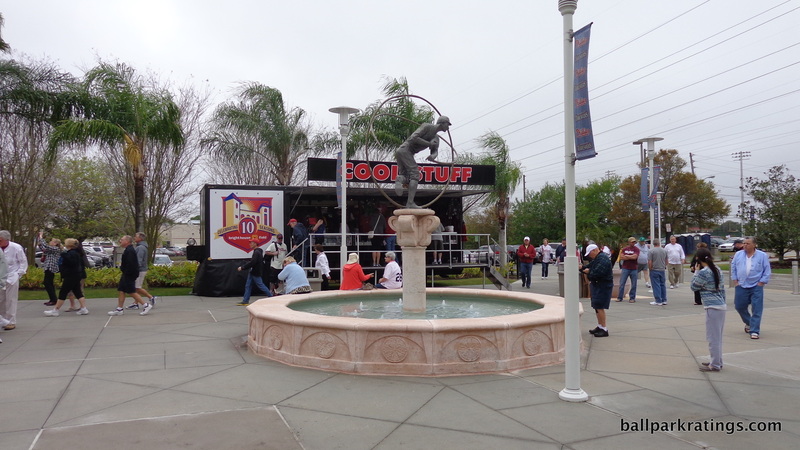 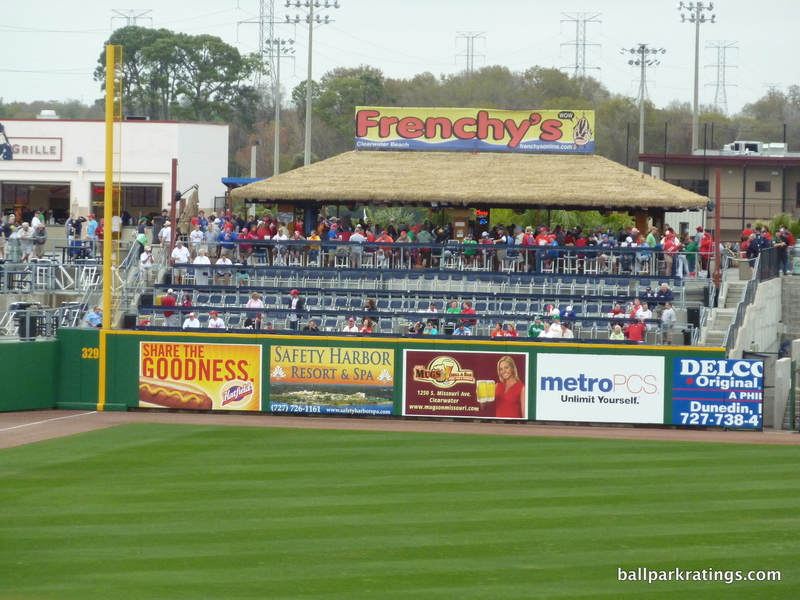 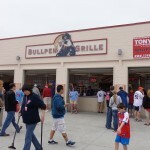 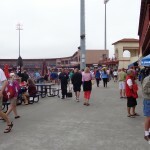 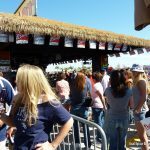 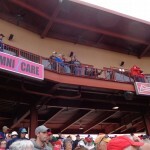 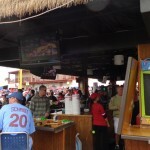 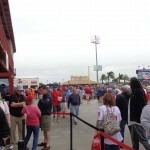 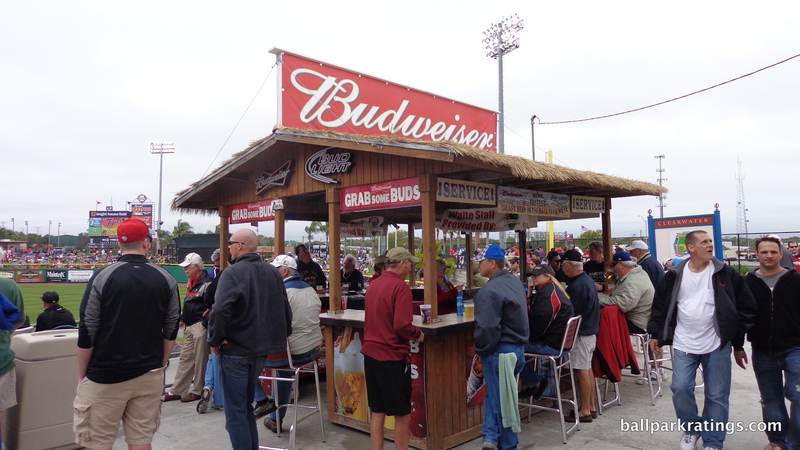 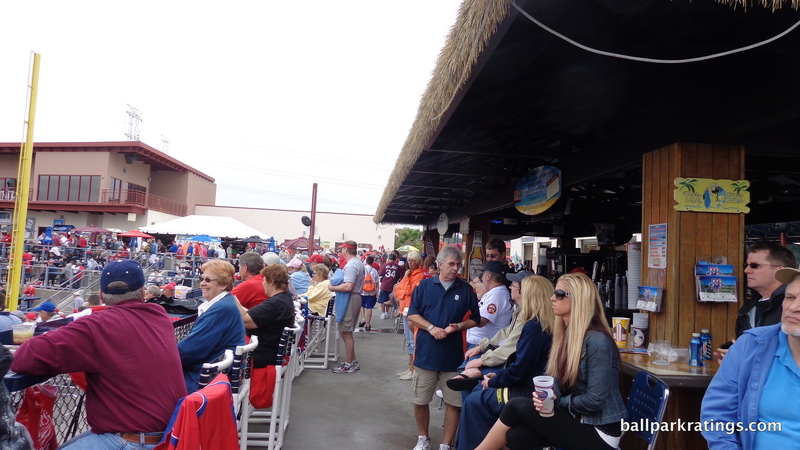 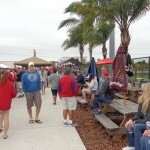 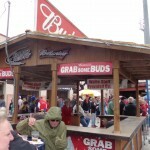 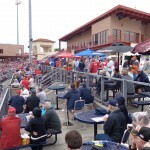 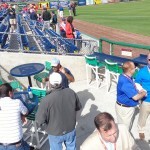 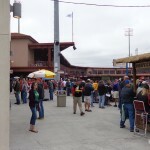 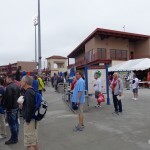 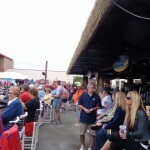 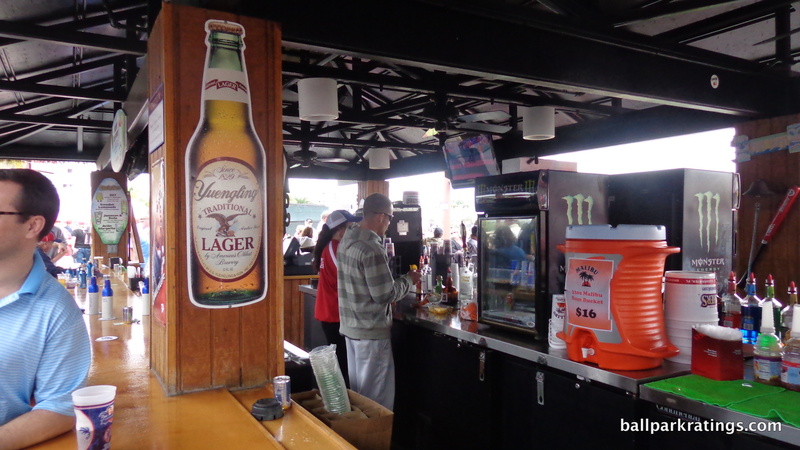 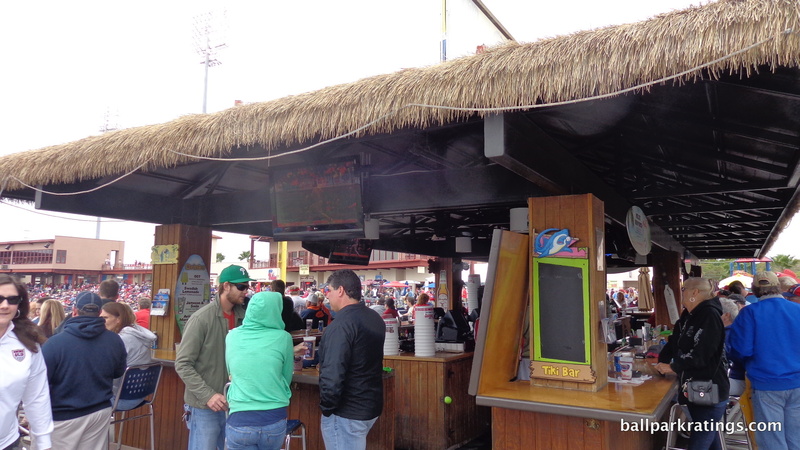 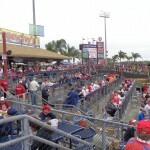 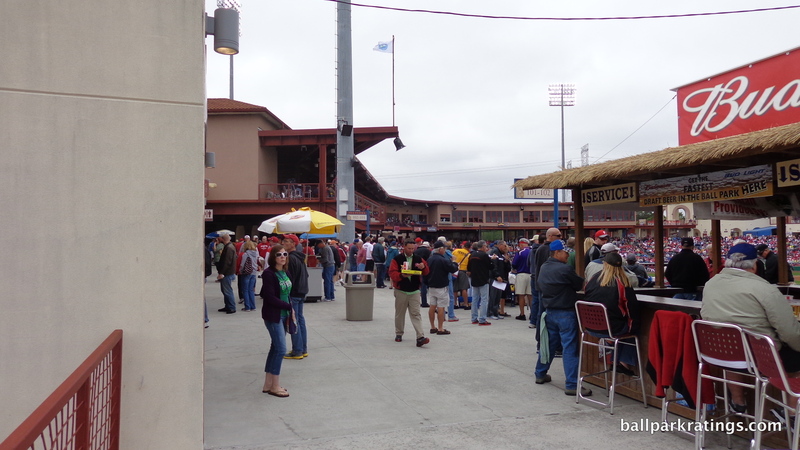 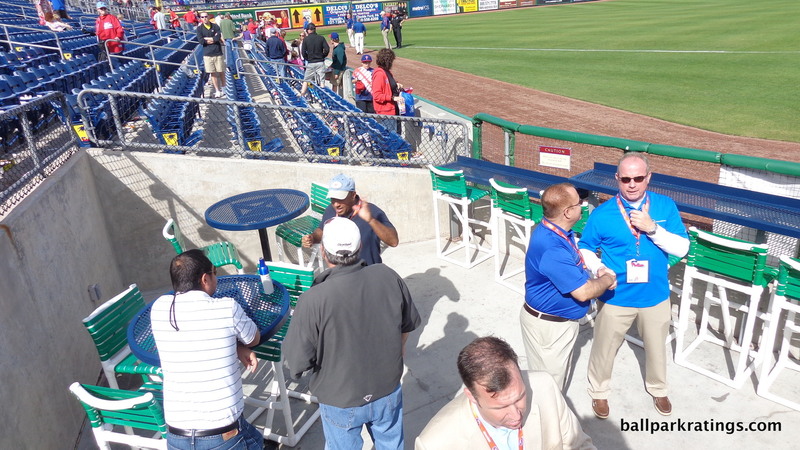 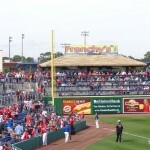 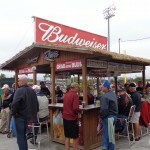 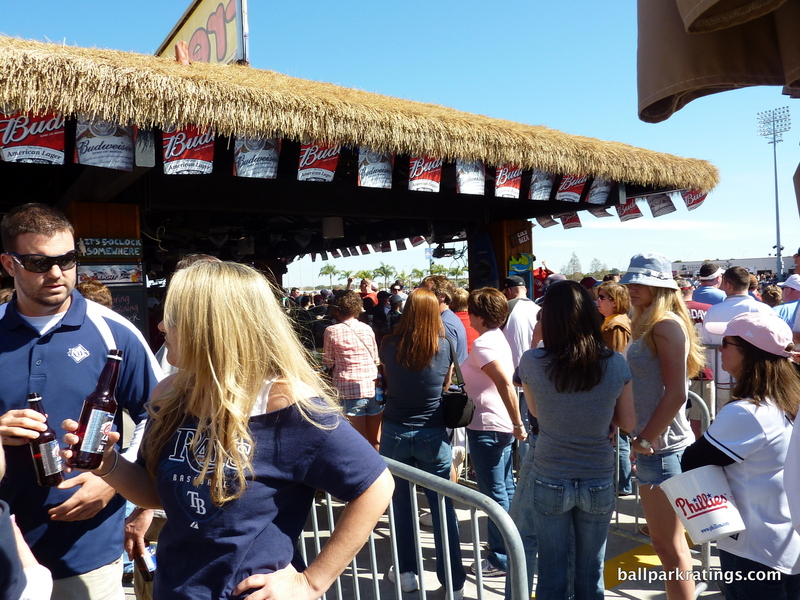 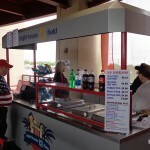 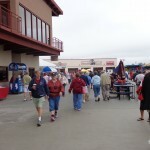 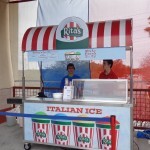 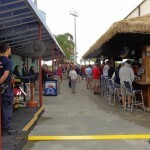 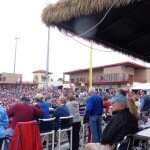 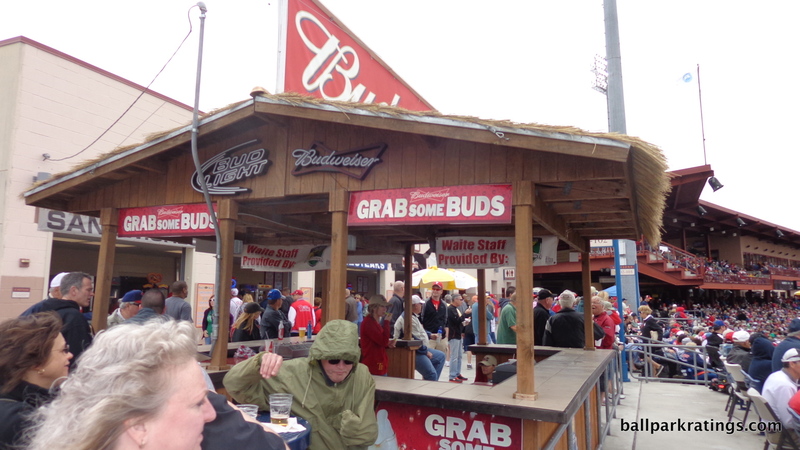 Spectrum Field popularized the tiki bar concept in Florida spring training. 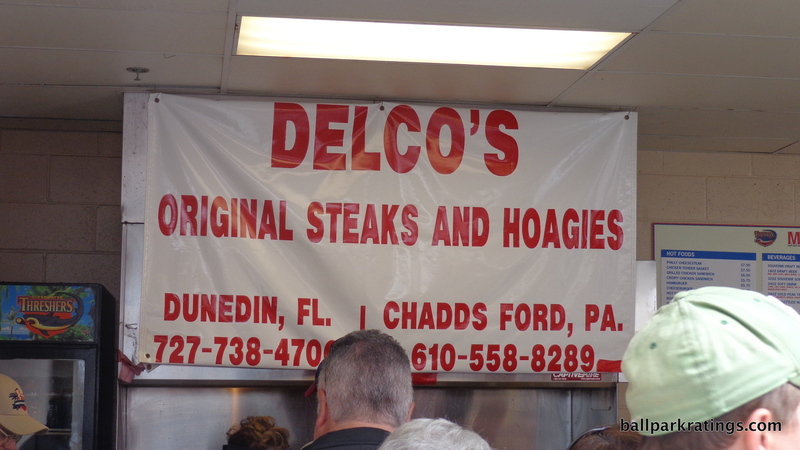 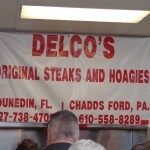 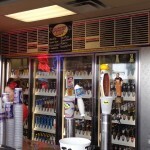 Eateries from around Florida have included Delco’s Original Steak and Hoagies, Westshore Pizza, Tijuana Flats, and Pete and Shorty’s. 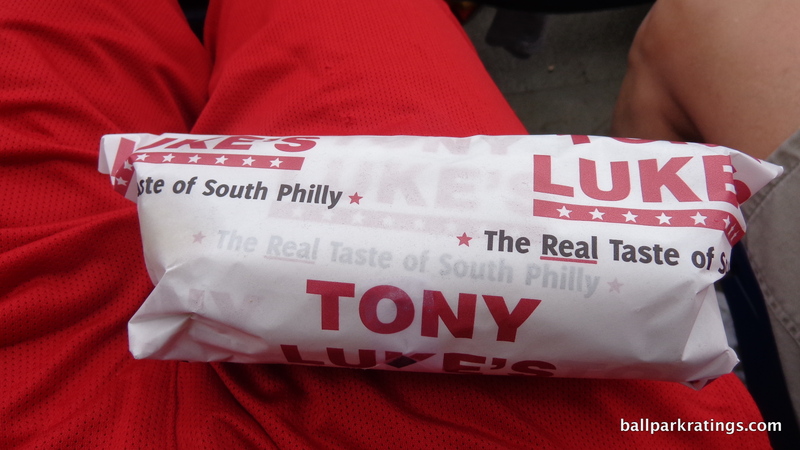 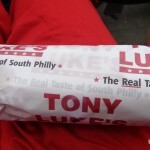 One year, Clearwater imported Tony Luke’s from Philadelphia. 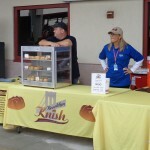 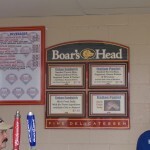 Other items have included Boar’s Head, Boston Market, Boardwalk Fries, BBQ, wraps, and Brooklyn knishes. 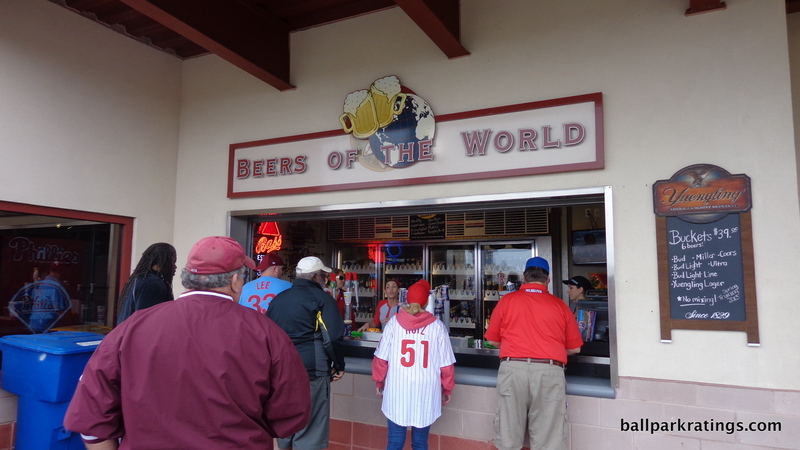 Spectrum Field also has a wide beer selection at the Beers of the World stand. 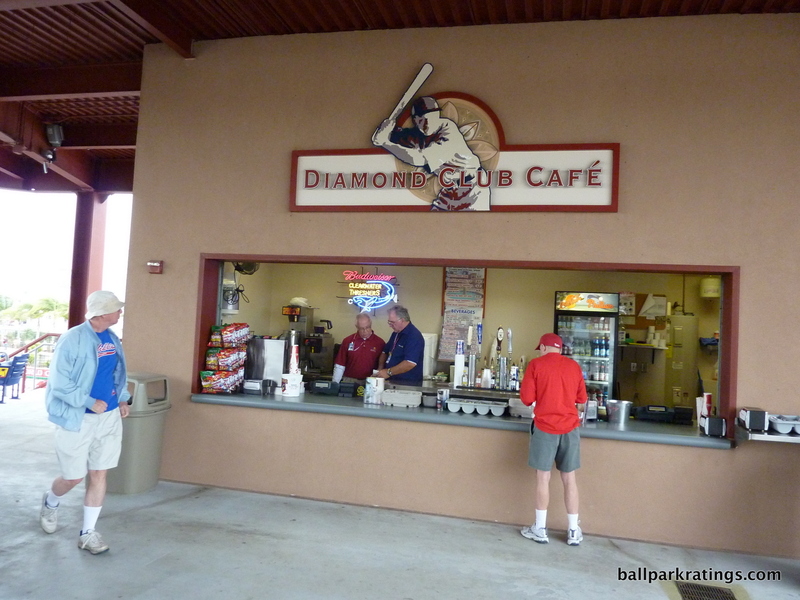 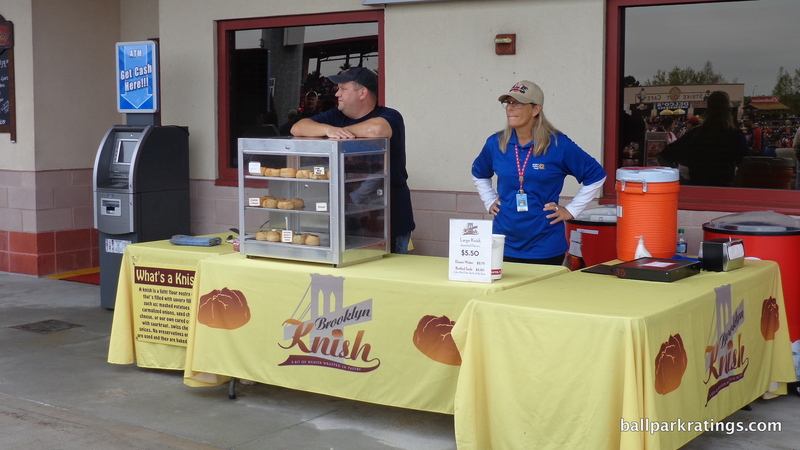 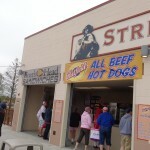 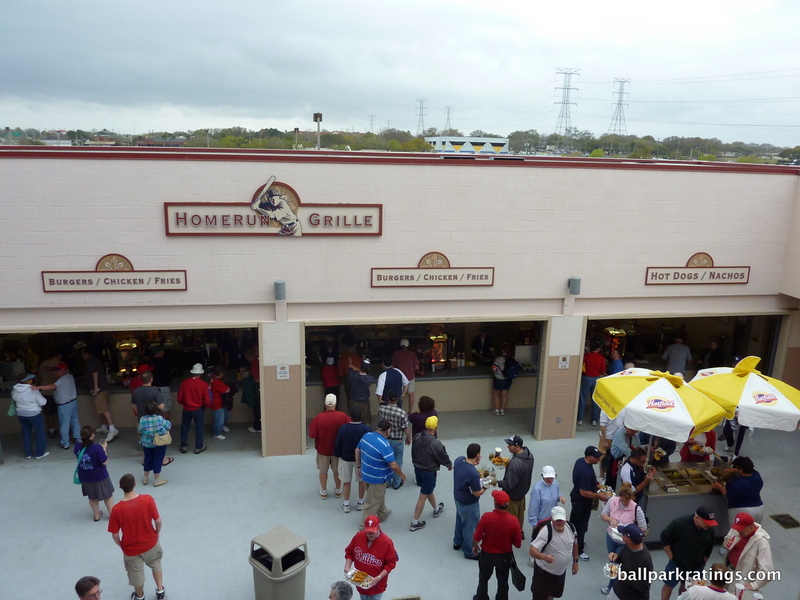 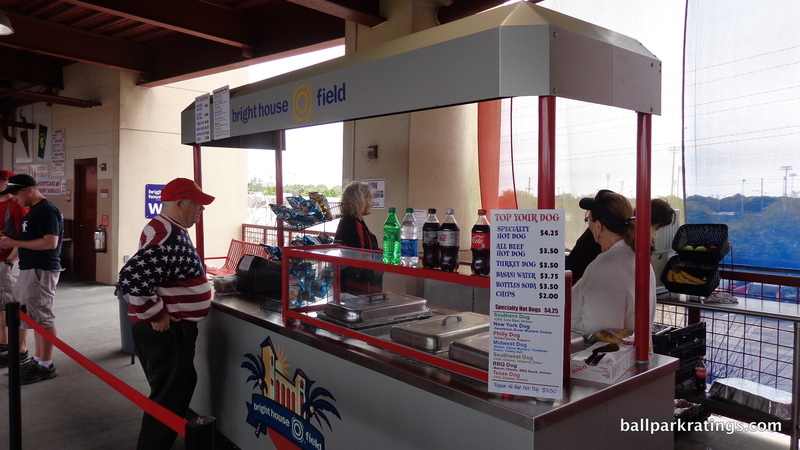 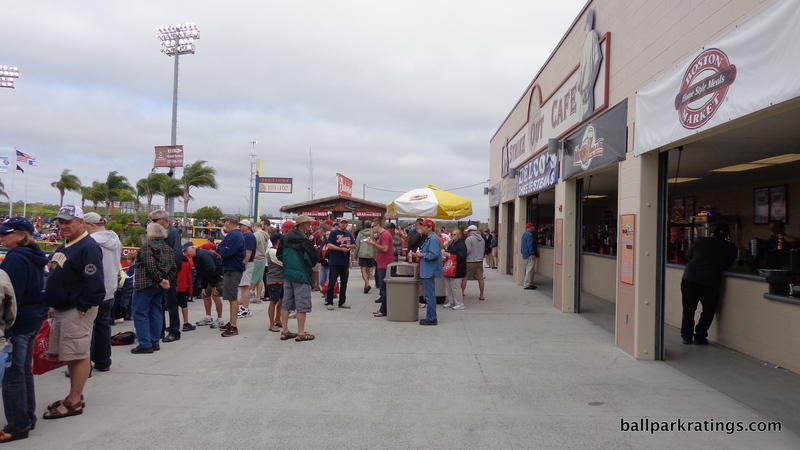 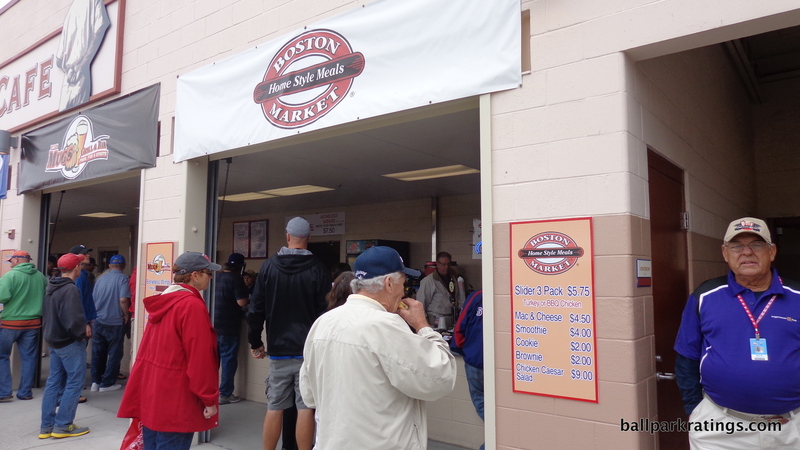 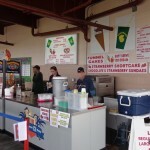 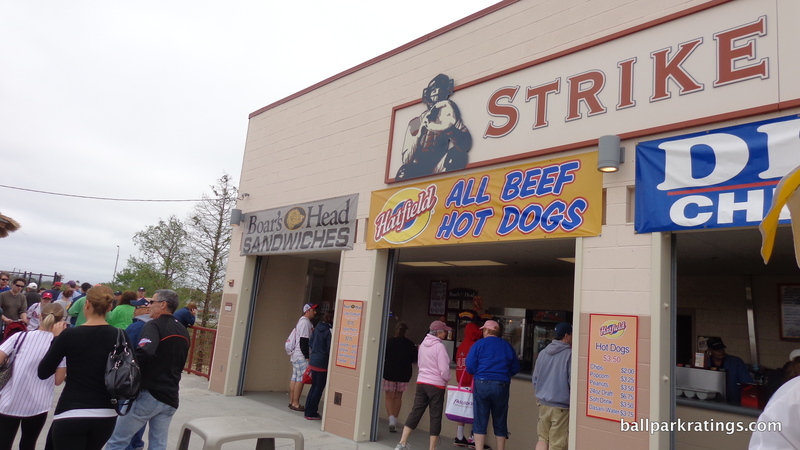 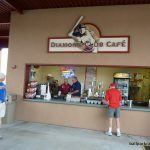 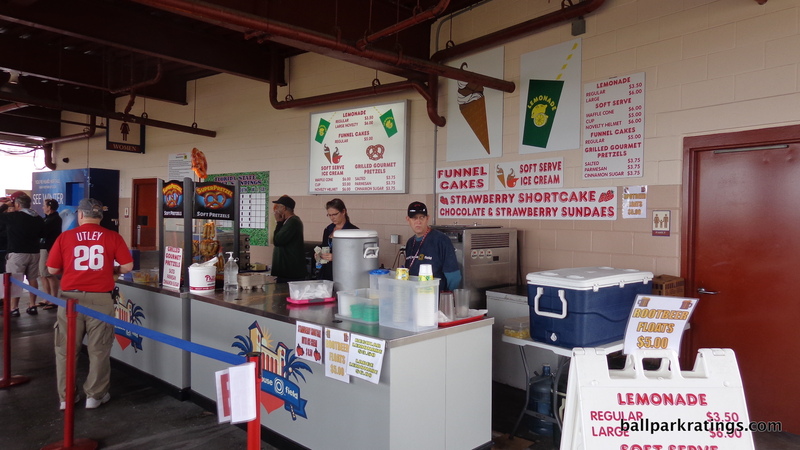 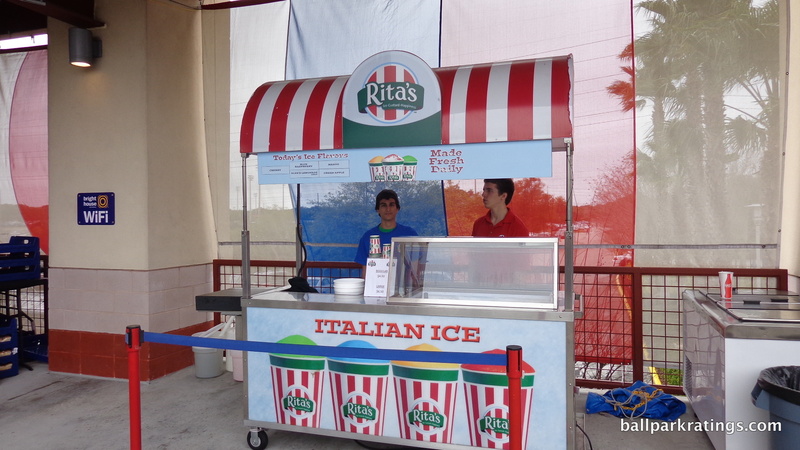 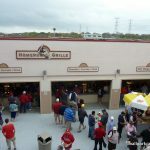 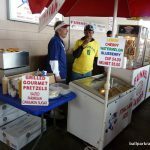 Given the variety and the fact that so many actual restaurants are represented, I rank the concessions as the best in the Grapefruit League. 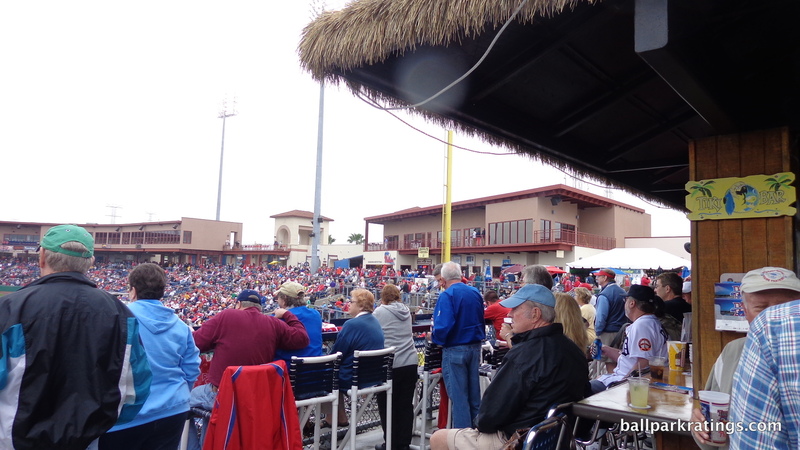 While Spectrum Field’s offering of destination bars and social spaces is pretty ordinary today, the park deserves credit for popularizing the outfield tiki bar concept. 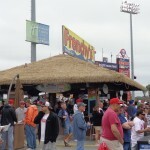 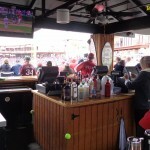 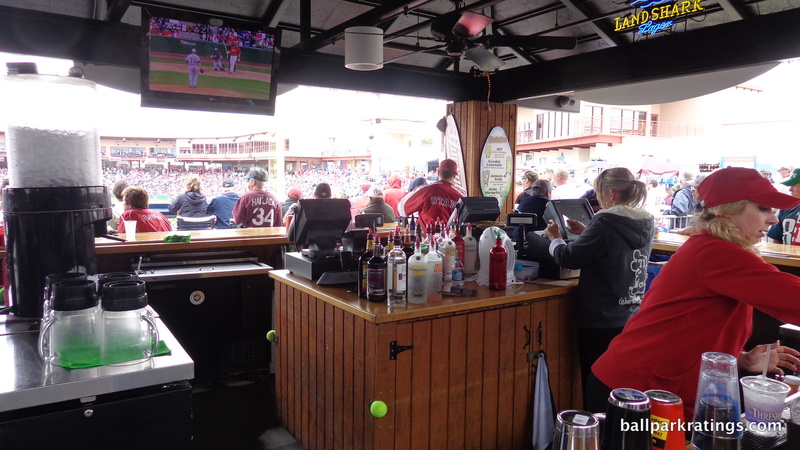 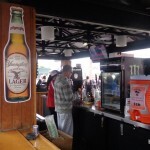 Featuring cool specialty cocktails, the full-service Frenchy’s Tiki Bar overlooking left field is littered with bar seating and café tables. 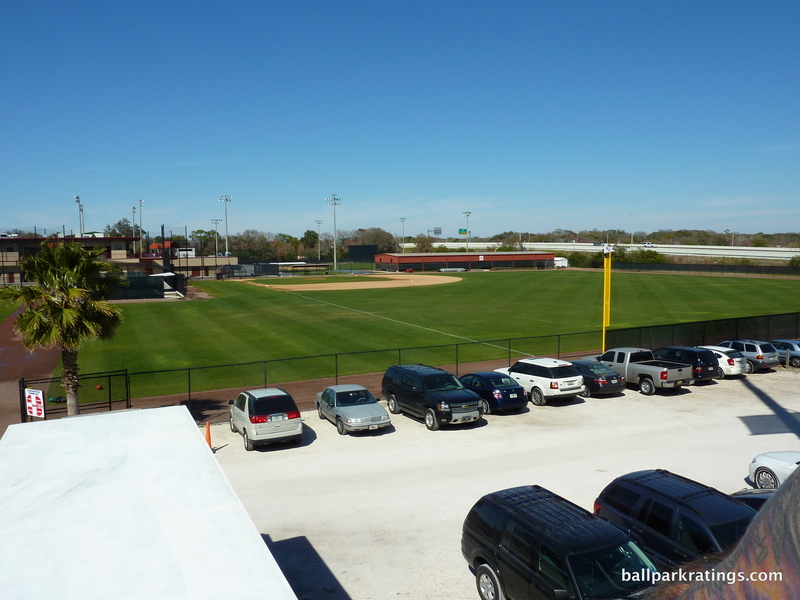 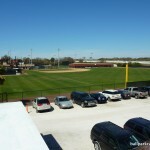 Originally a minor feature at the old Jack Russell Stadium, this is one of the most famous amenities in Florida. 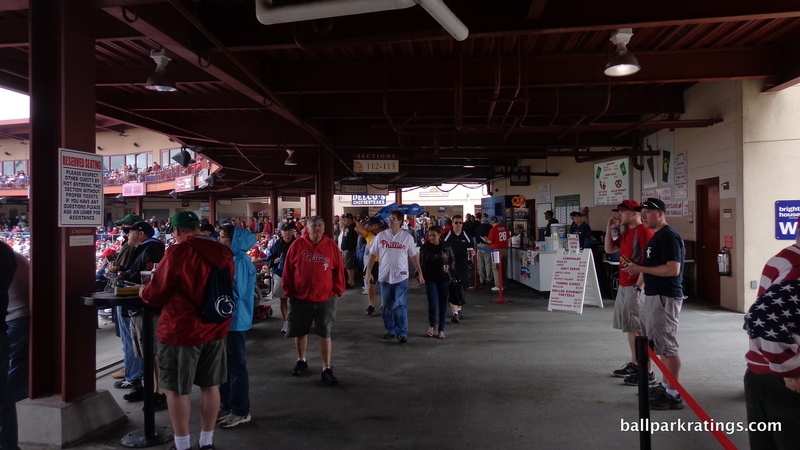 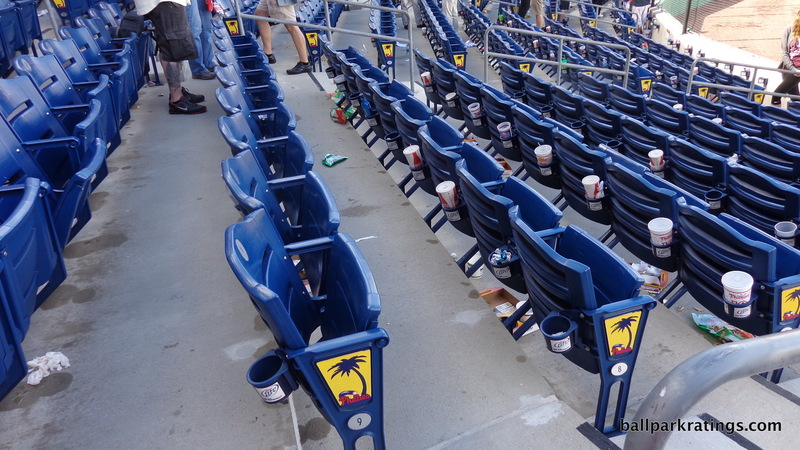 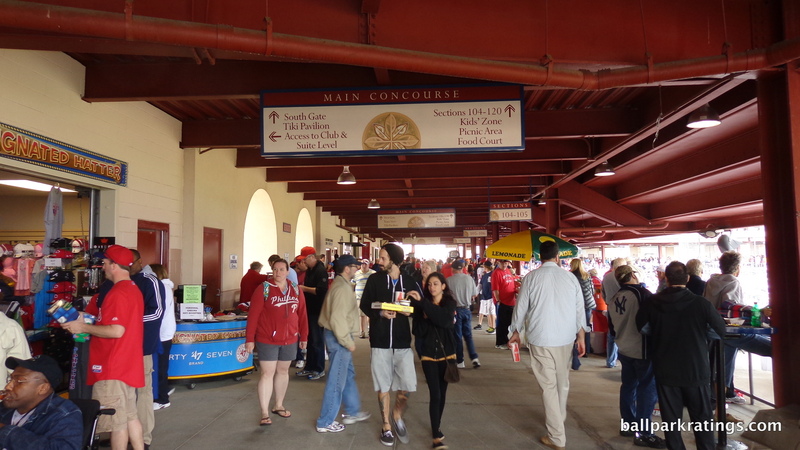 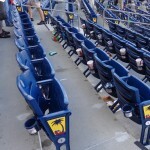 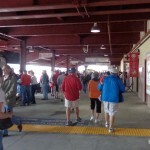 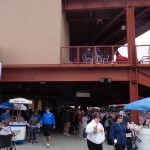 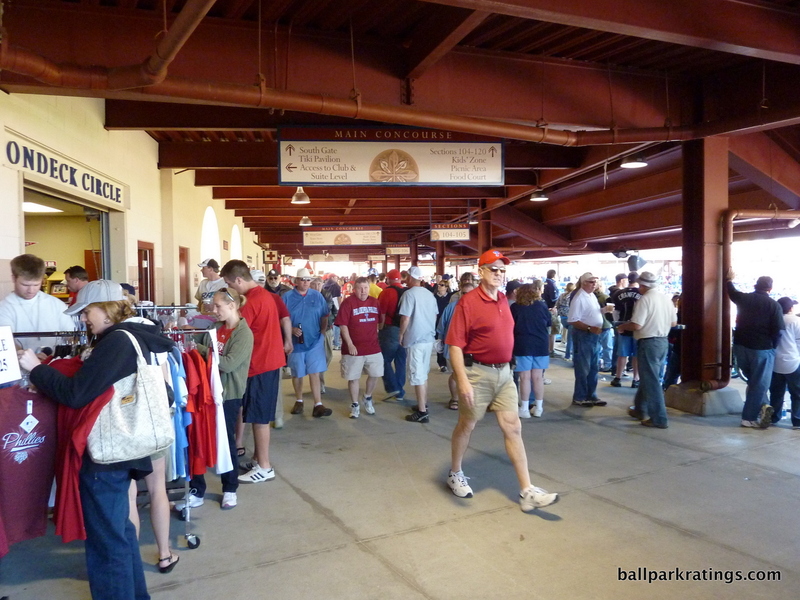 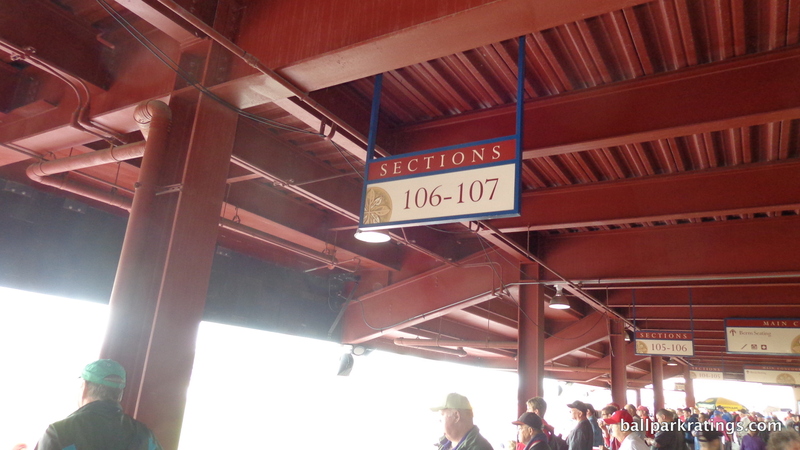 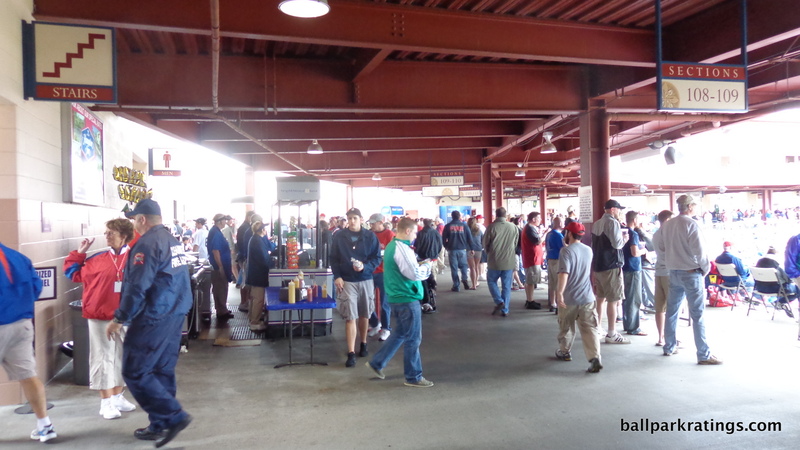 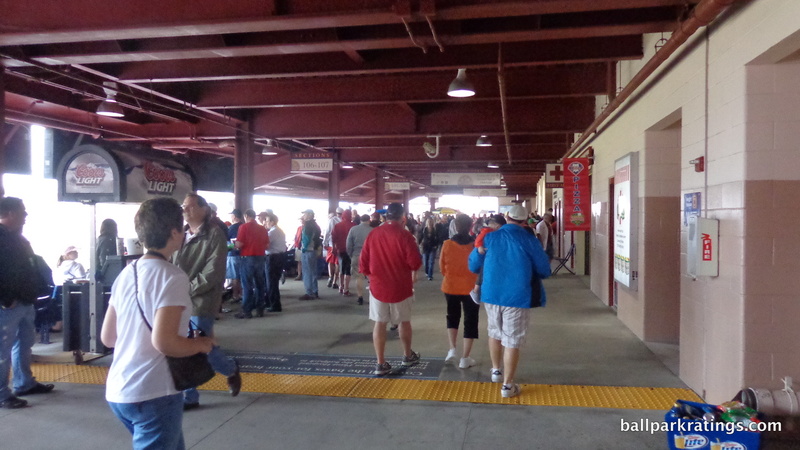 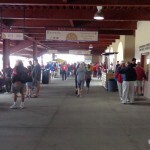 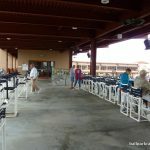 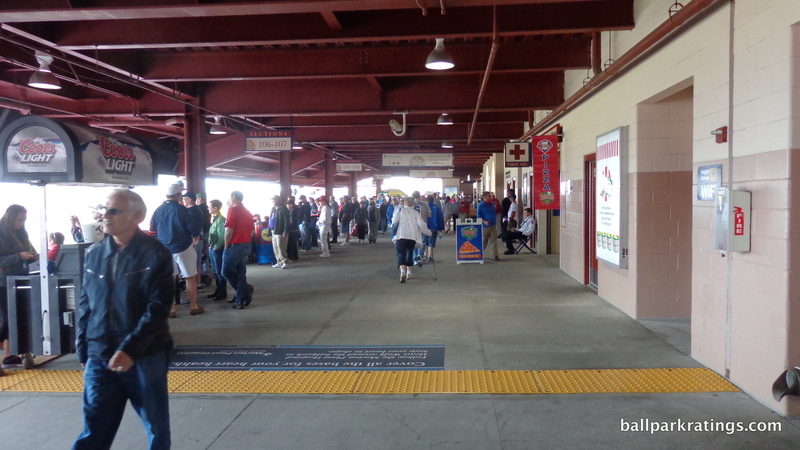 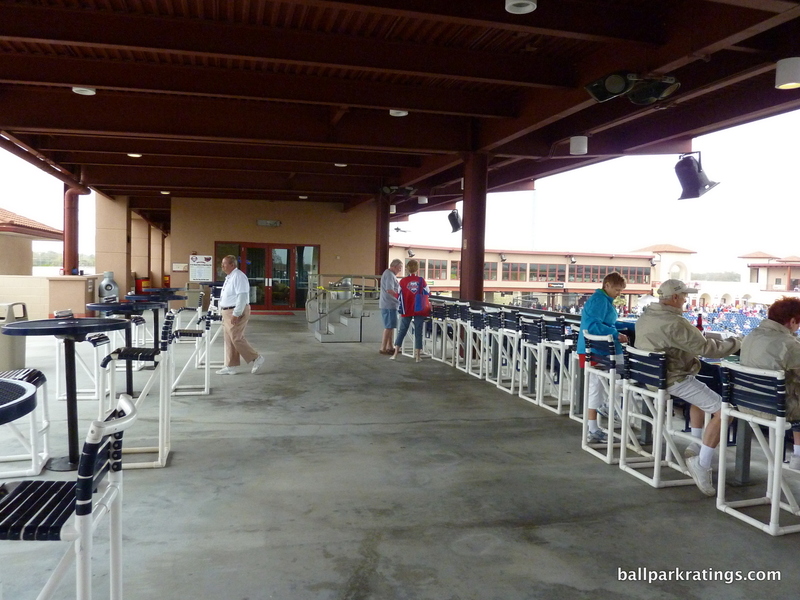 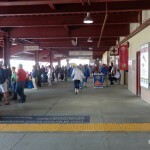 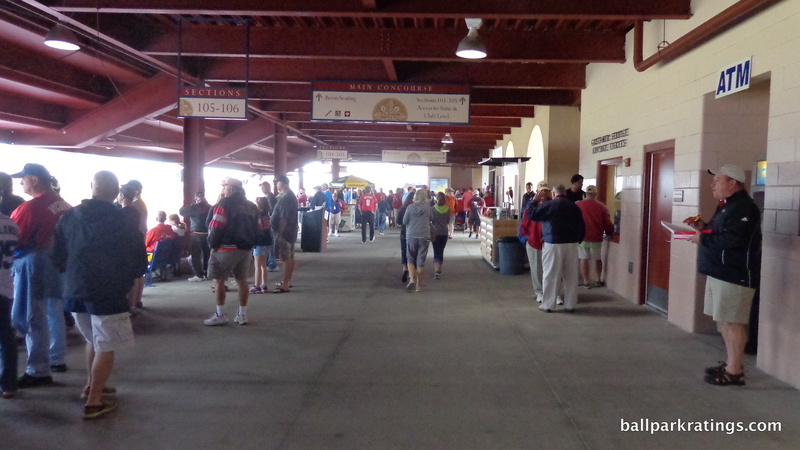 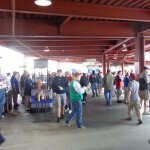 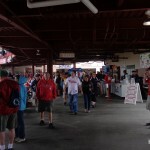 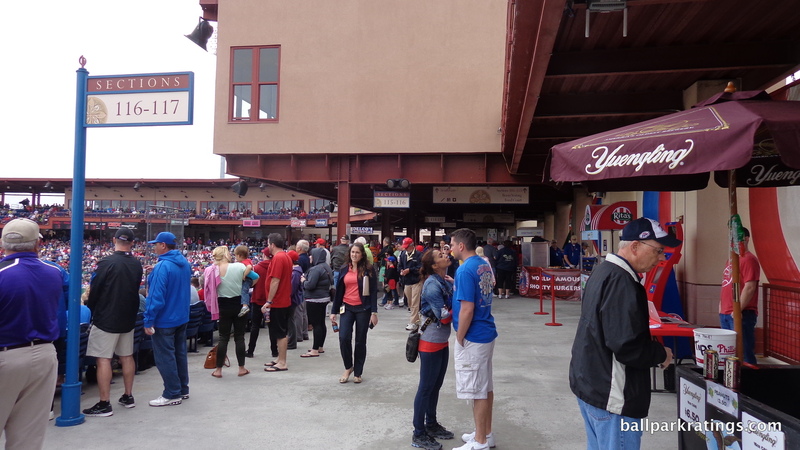 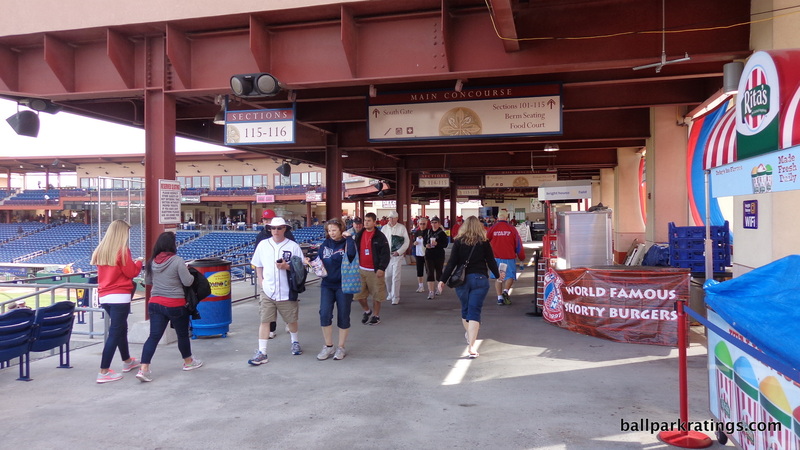 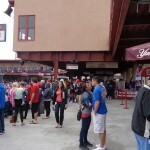 While the Phillies added a supplementary tiki bar down the right field line, the park is otherwise lacking in places to sit down on the main concourse. 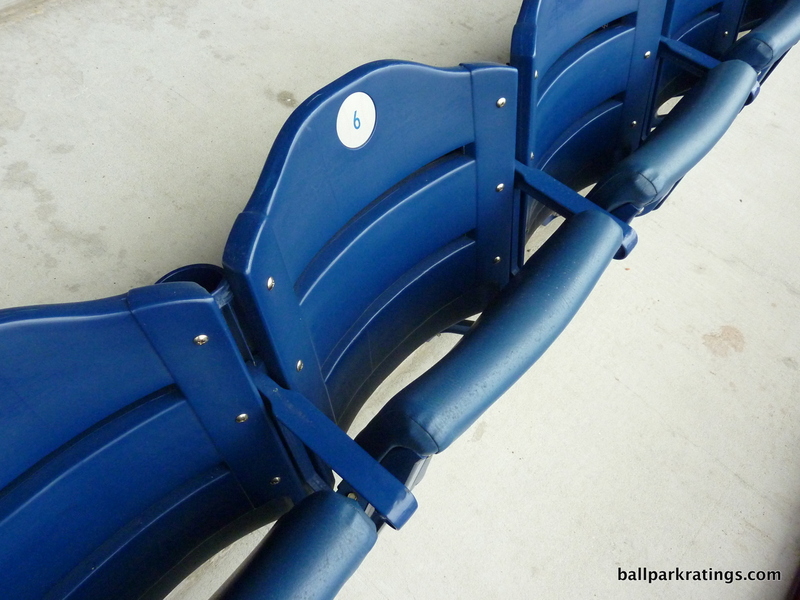 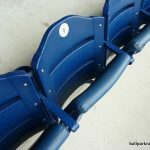 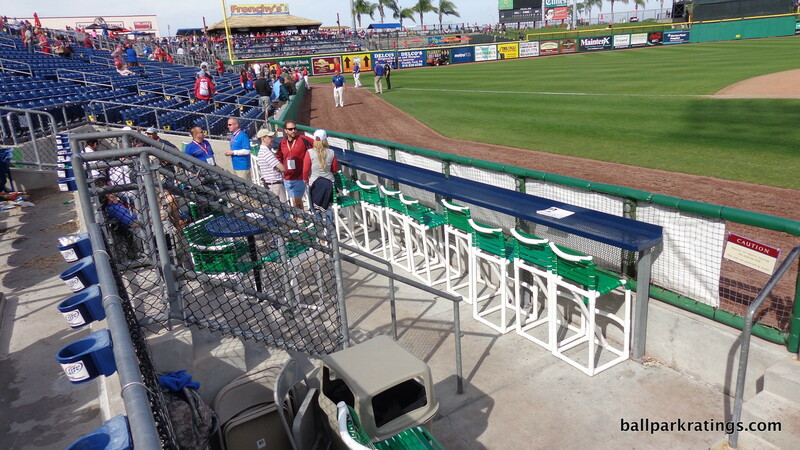 Spectrum Field has plenty of interesting ticketed seating options. 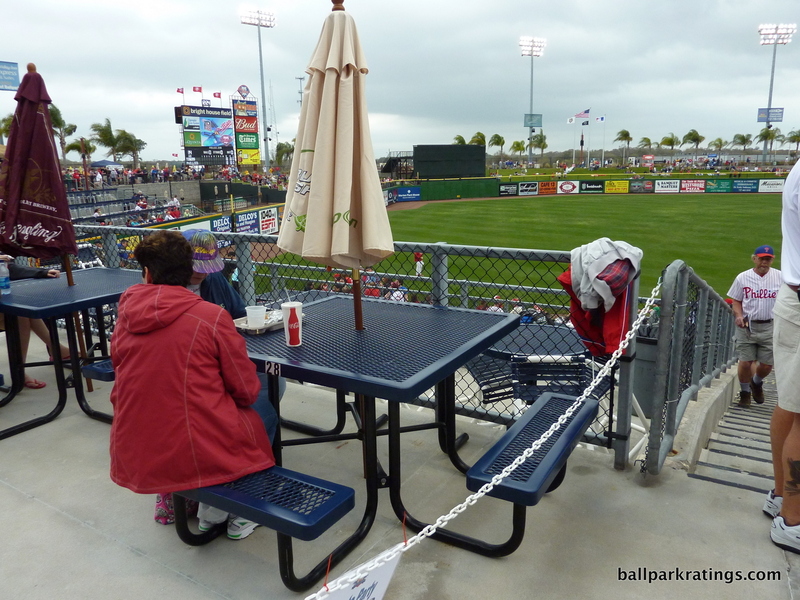 With padded seats and a private open-air concourse with bistro tables, Clearwater is one of the few spring parks to feature proper “club seating“. 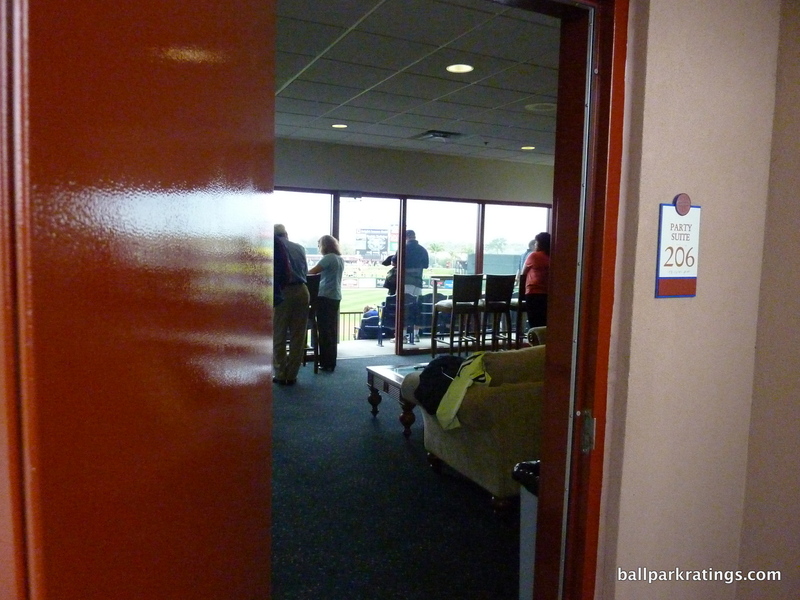 Nine luxury suites fill out the rest of the mezzanine. 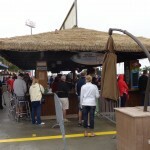 Dubbed the Frenchy’s Tiki Pavilion, five tiers of drink rail seating are situated below the tiki bar. 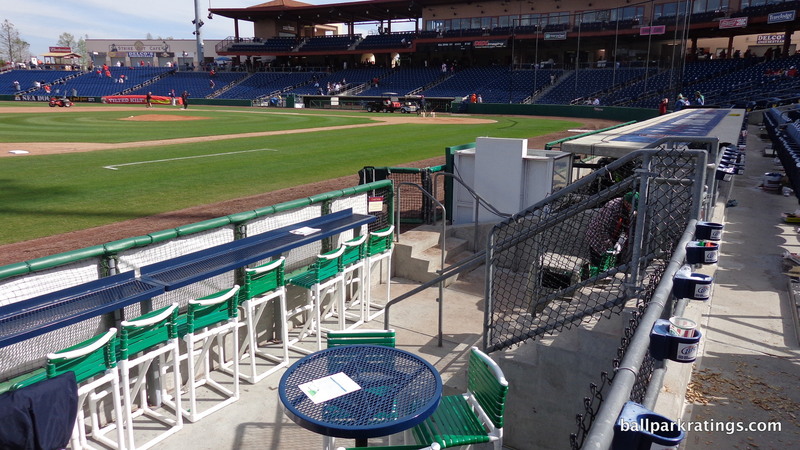 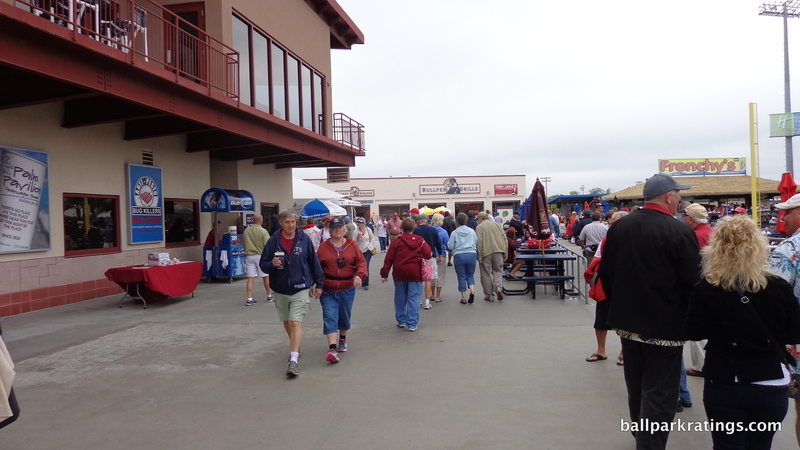 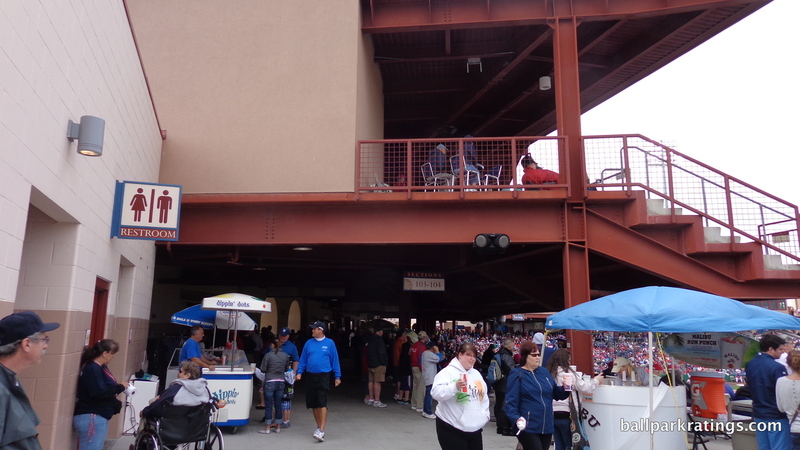 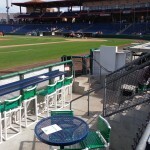 Premium patios and semi-circular tables are adjacent to the drink rail seating down the left field line. 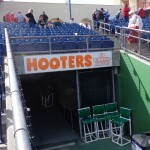 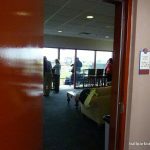 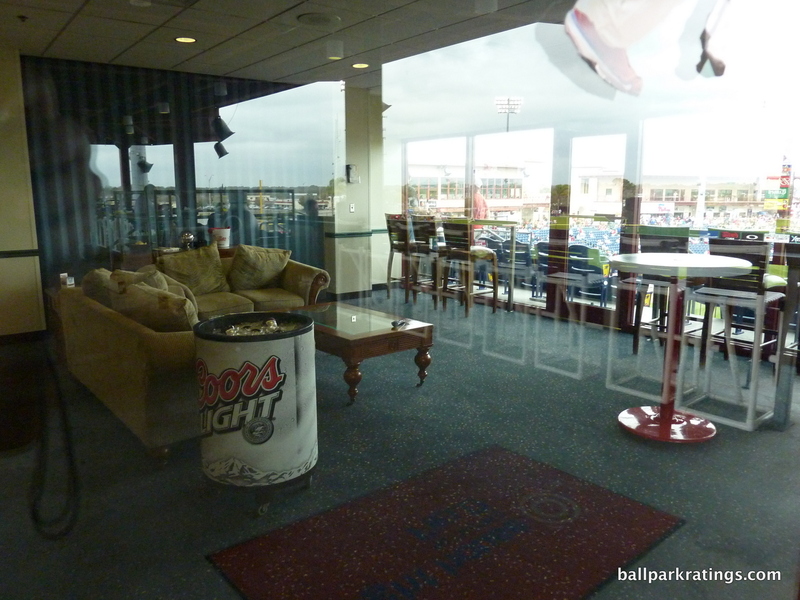 The ballpark’s most unique group option is the Hooters VIP Diamond Dugout at field level next to the Phillies dugout. 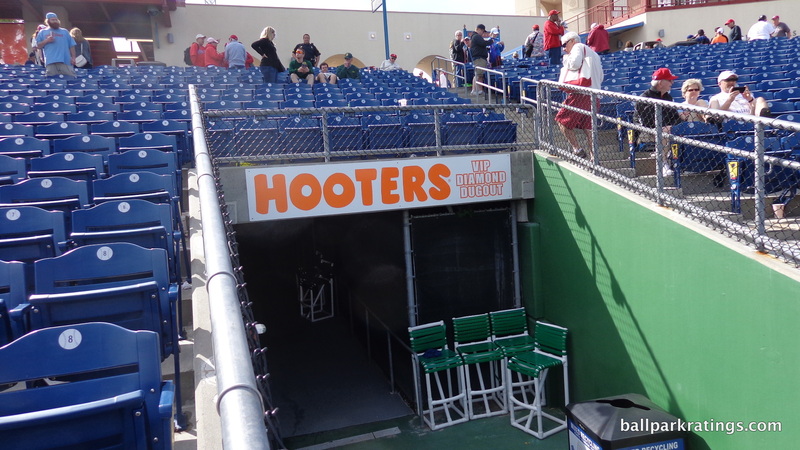 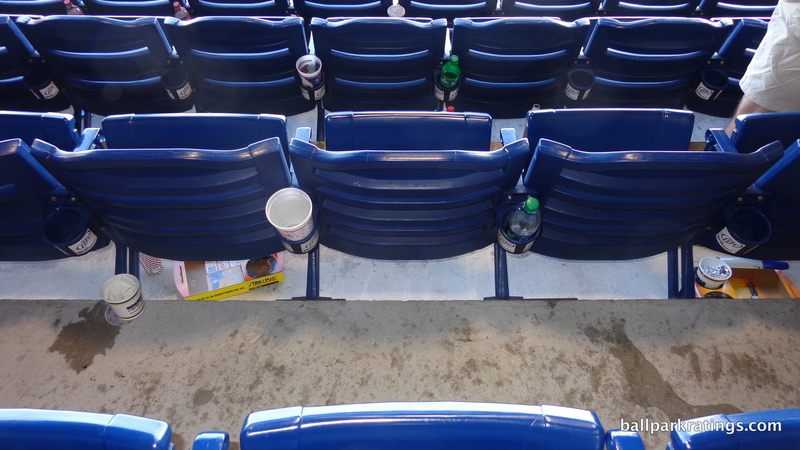 Lucky fans enjoy all-inclusive food and drinks, exclusive game notes, and in-seat service provided by Hooters girls, all while being closer to the third base bag than the pitcher. 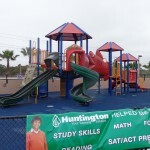 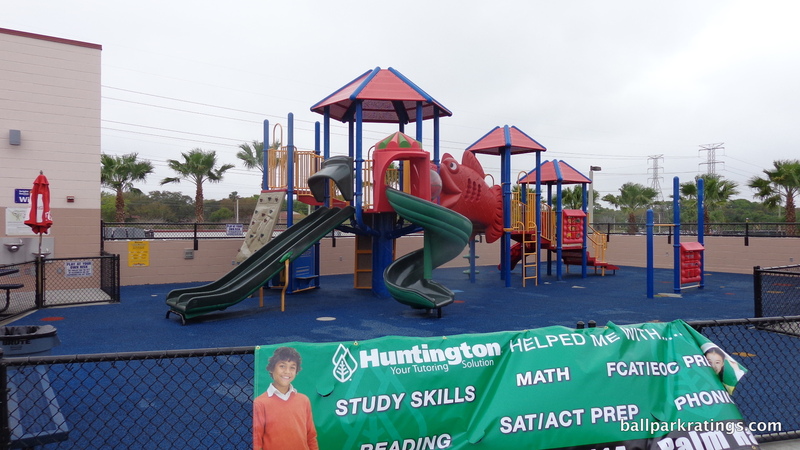 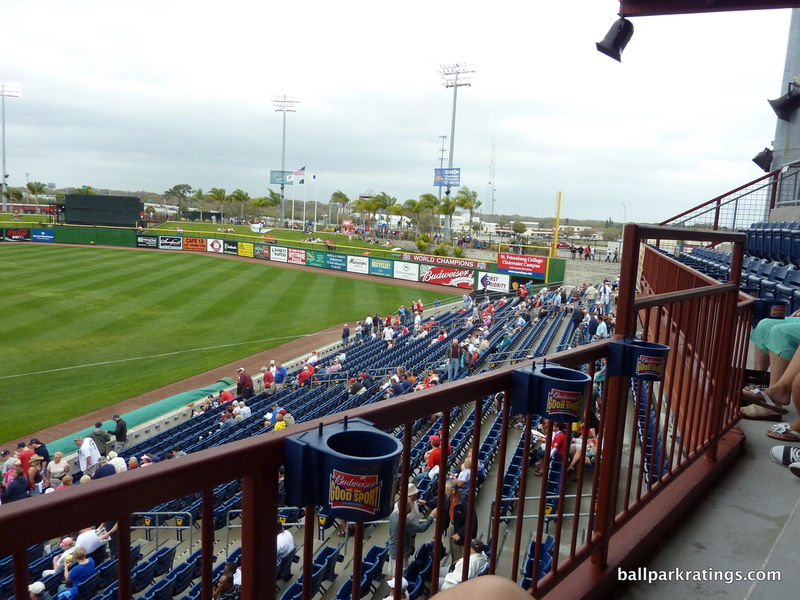 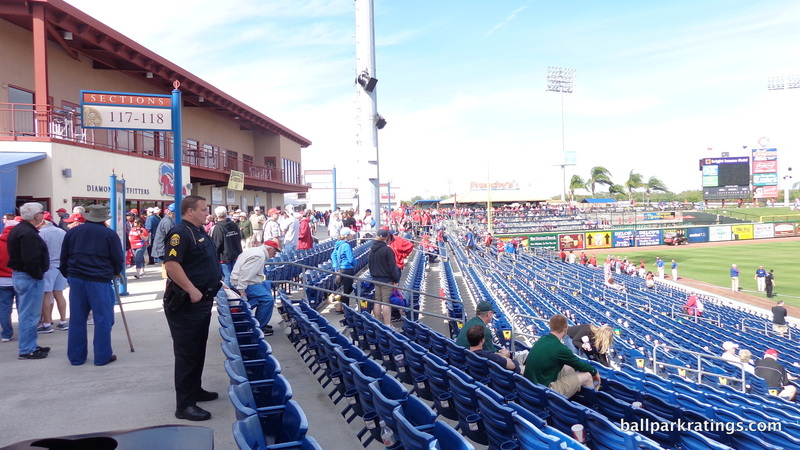 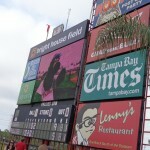 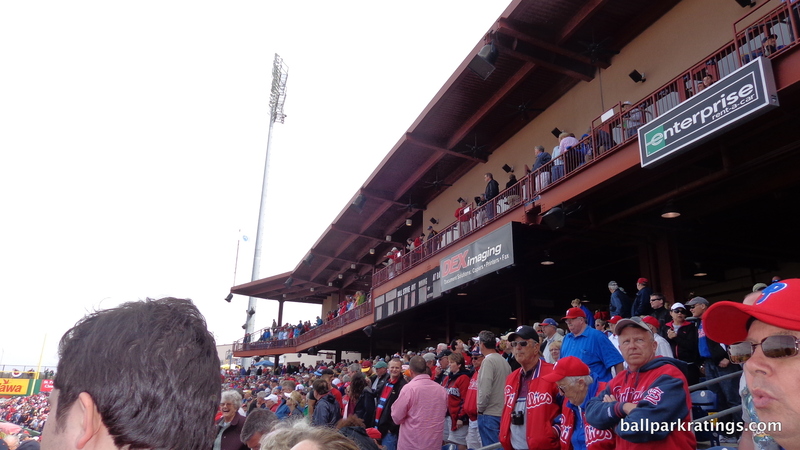 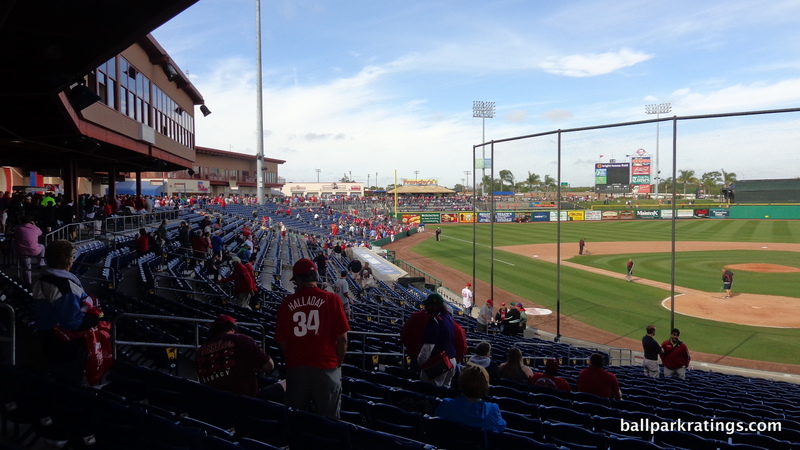 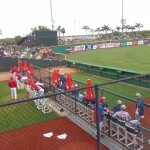 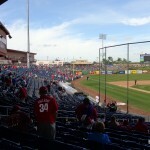 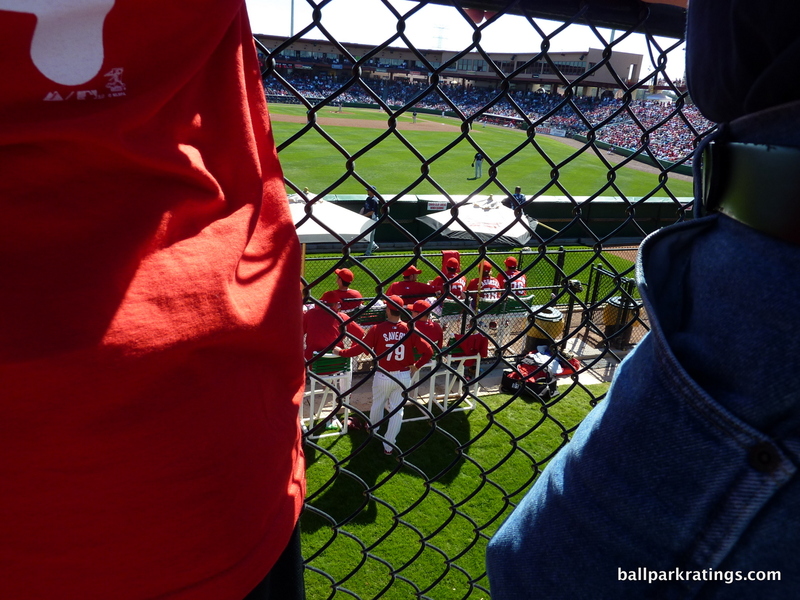 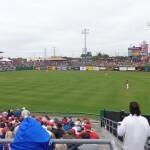 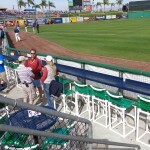 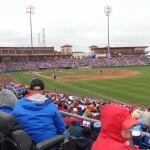 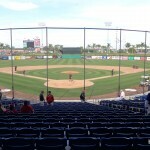 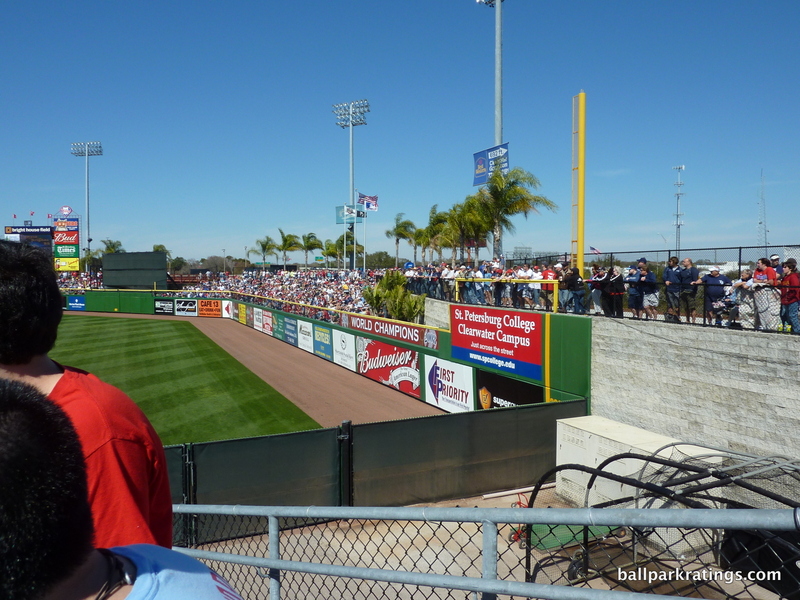 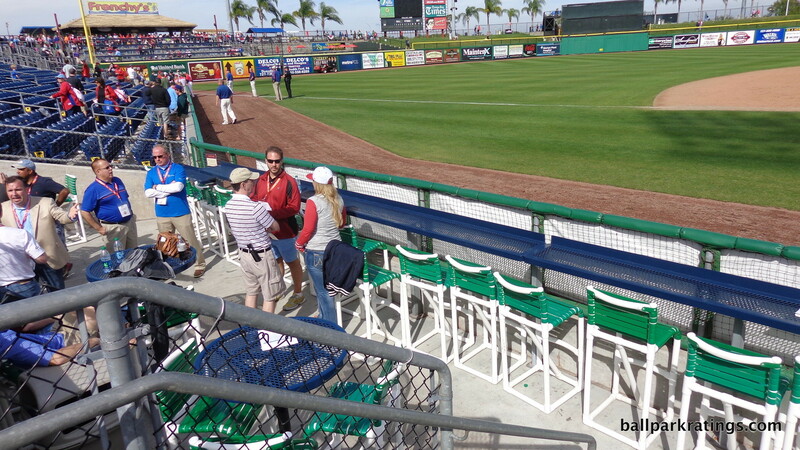 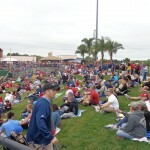 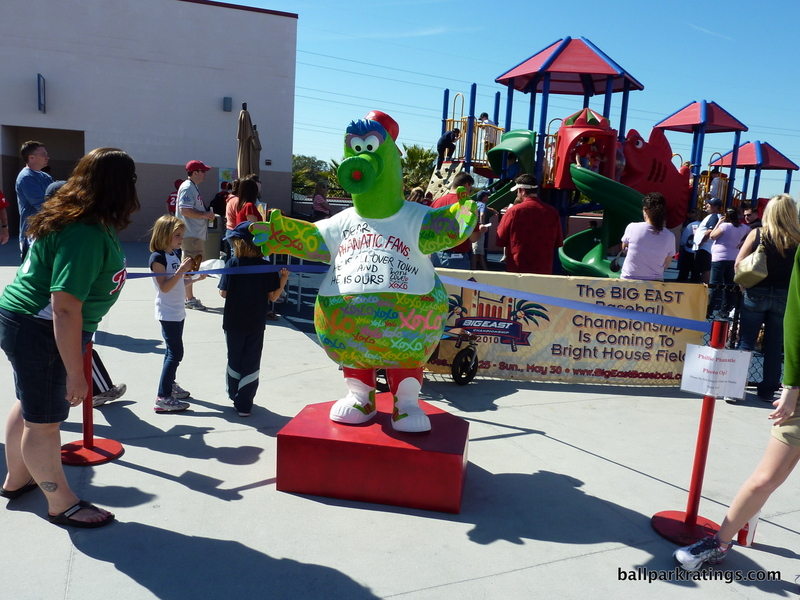 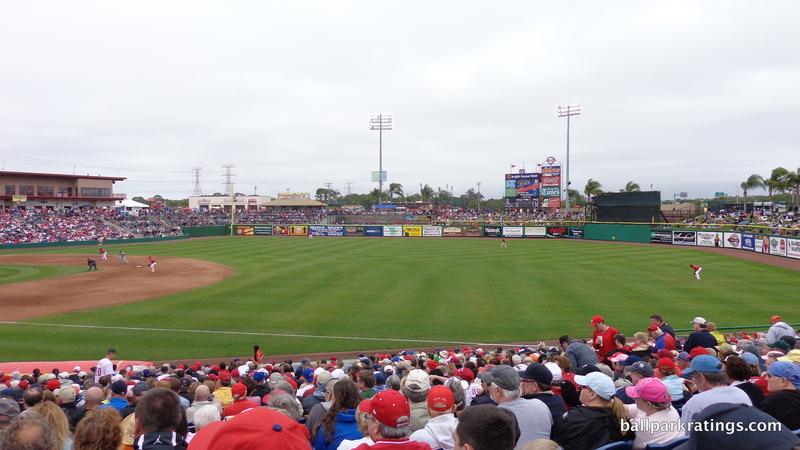 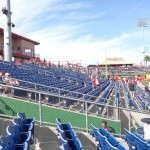 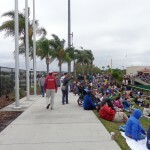 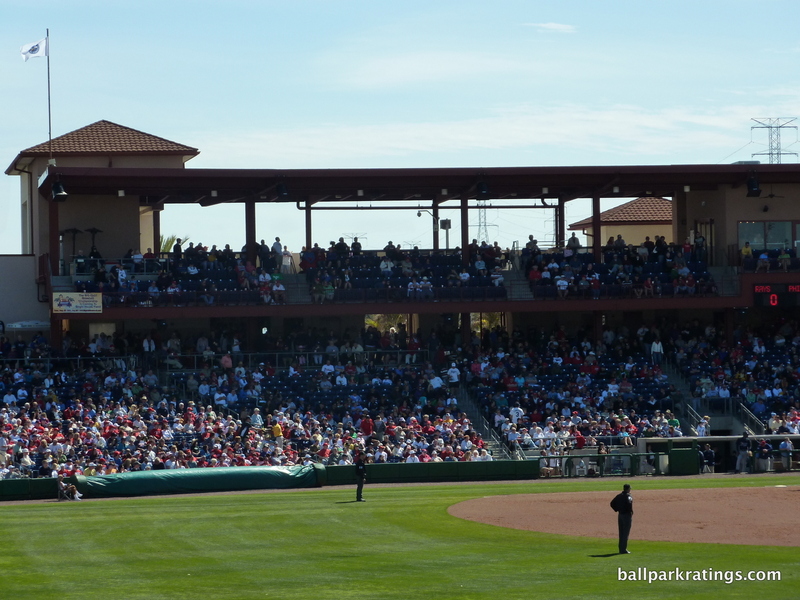 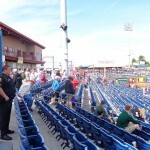 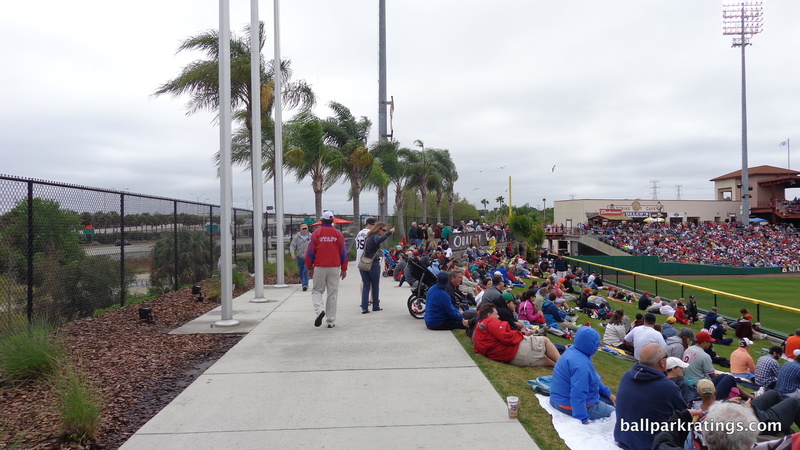 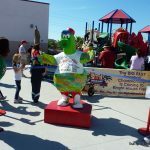 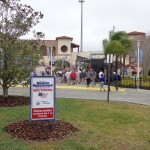 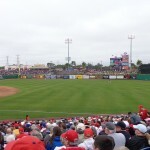 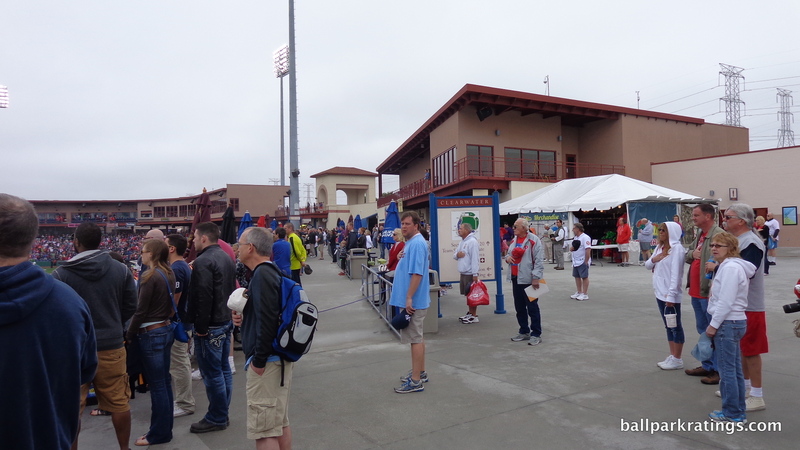 Finally, the Phanatic Phun Zone in the left field corner is one of the best kids’ areas in Florida spring training. 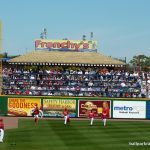 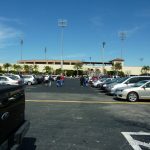 Spectrum Field no longer has that fresh, new car smell of an industry leading ballpark, but it continues to be the best Grapefruit League venue through its all-around excellence. 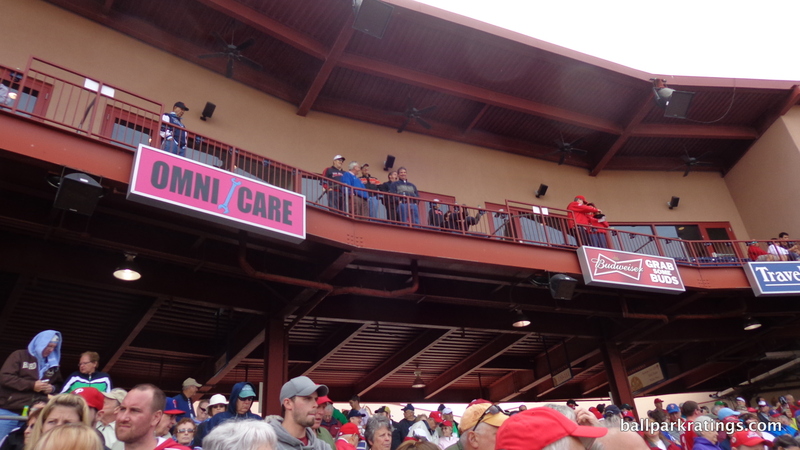 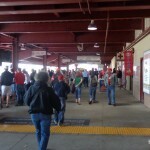 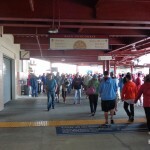 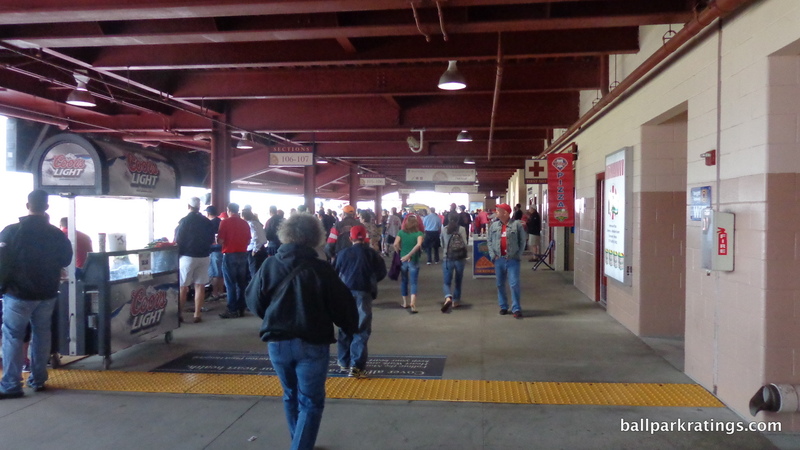 Most of the planned renovations involve upgrading the player facilities, but the Phillies also plan to widen the main concourse and upgrade the club level.